I wanted to dedicate the first tag of this site to my homeland, the Principality of Monaco. 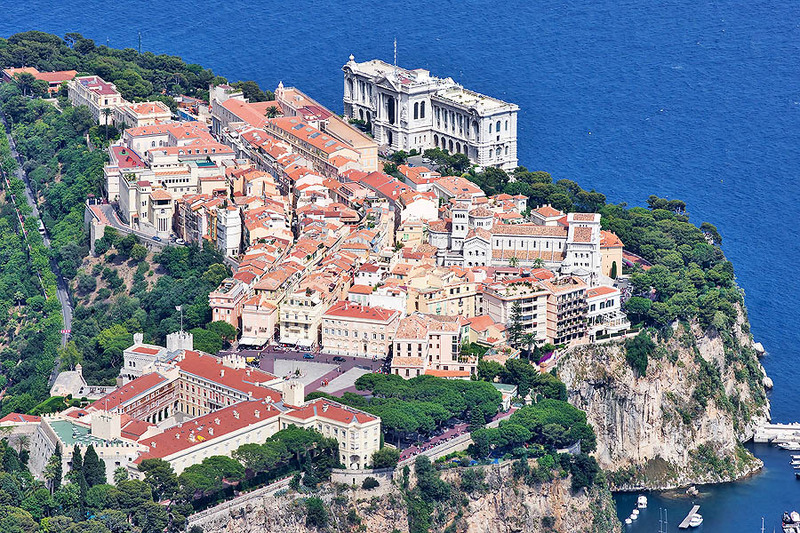 Monaco is a small dot on the geographic maps, but its fame and notoriety go well beyond its borders. 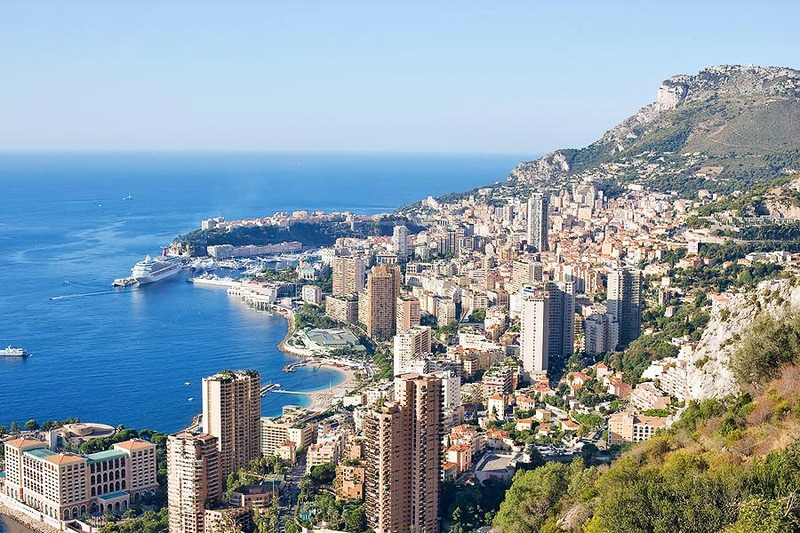 As in fact a Venetian ambassador was saying to a colleague who was ironical about the small size of his nation, “ Countries are not to be measured, but weighed ”, and since the old times the Rock of Monaco has held an important weight due to its strategic position. Five centuries before Christ, it was, in fact, known to Greeks, as well as Elba Island, Ventimiglia, Marseilles and Narbonne, due to its leeward harbour, compulsory port of call during the voyages to Spain, and Hecataeus of Miletus, historian and geographer of the time, in its “Periegesis”, relates of a “ Monoikon poilis Ligustiké ”, that is, of Monaco, city of Liguria, where was located also a temple honoured to Hercules, which later on originated the old Roman name of “ Portus Herculis Monoici ”. 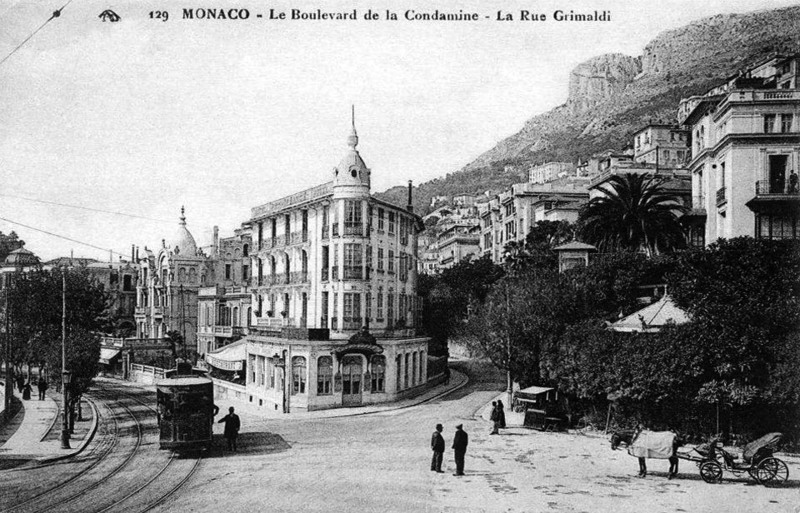 Starting from 1297, the history of Monaco interlaces with that of the Genoese family of the Grimaldis. Following to a battle lost by Guelfs, Francesco Grimaldi, called Malice, while fleeing towards Provence with his vessel, succeeds in fact in taking possession, from the Ghibellines, of the Rock, conquered with the swords during the night of January 8th, after having cheated the sentry post disguised as a monk looking for shelter. 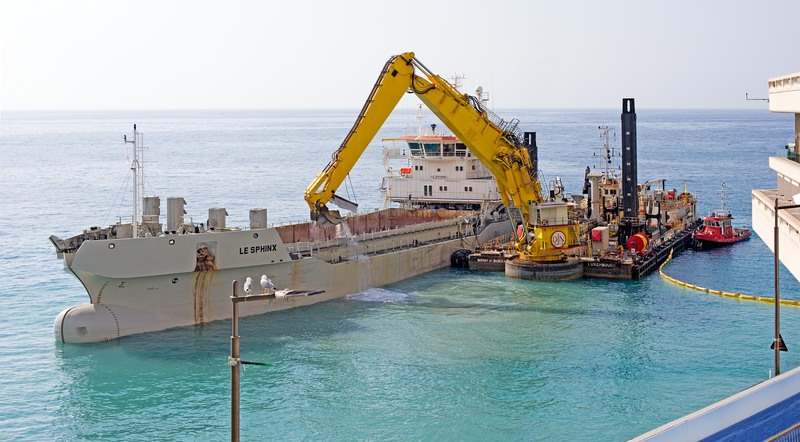 Since then, with alternate vicissitudes and after several sieges, the Grimaldis will live on the Rock with a swinging foreign policy, putting in competition, without giving anything, the powerful neighbours longing for its port. 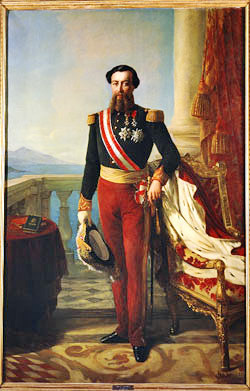 So, in order to protect the independence of their frail nation, we find them at times allied with Provence, with Savoy, with Genoa or with France, betrayed in favour of Spain for 116 years, and then finally raised to guarantee of the autonomy and defence of the Principality with the Treaty of Péronne, signed by the Prince Honoré II, on September 14th, 1641. 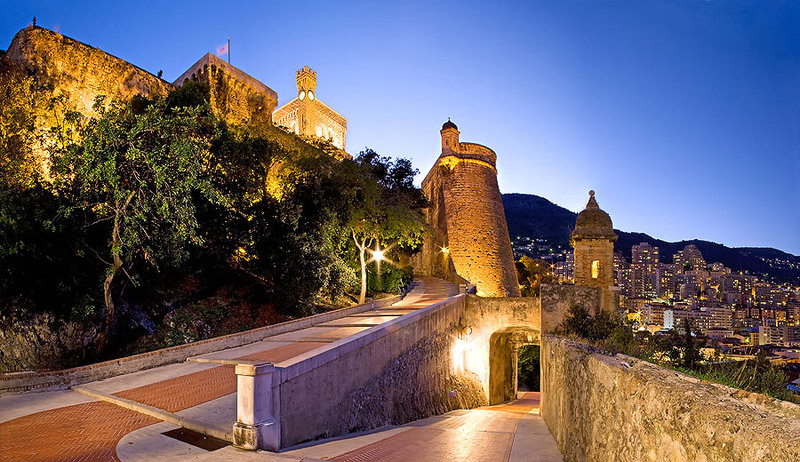 With the French revolution, Monaco is occupied by France, and is annexed, from 1793 to 1814, to the department of the Alpes-Maritimes, with the less clerical name of Fort d’Hercule. When the Grimaldis are back, the Palace has been sacked and the public finances are empty. The Prince Honoré V tries to set up the economy with small industrial and handicraft activities, and grants the monopoly of wheat and flour to licensees without scruples which will cause the dissatisfaction of the population. 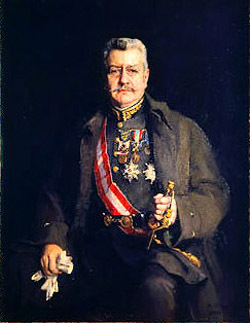 His successor, the Prince Florestan I, abrogates the monopoly, but it is too late, now. 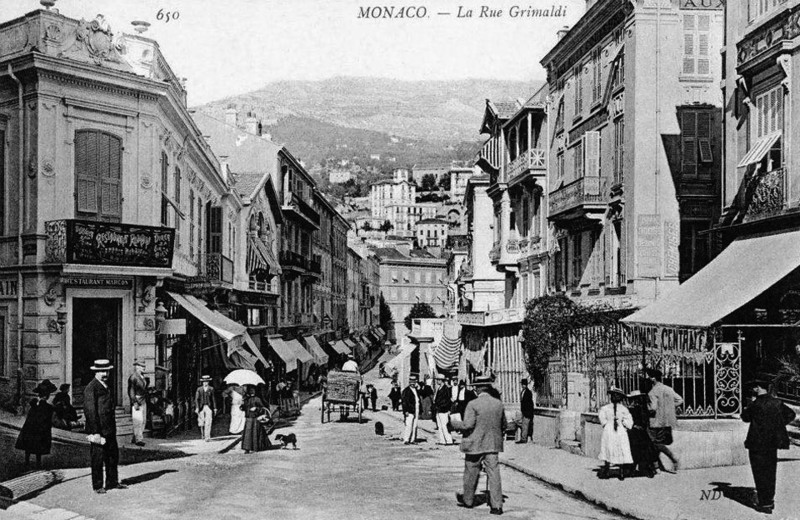 With plebiscite managed by Savoy and France, Roquebrune and Menton, which belonged to the Principality, go under French rule. 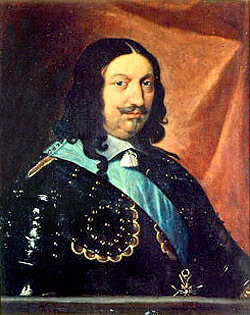 The Prince Charles III, who succeeds to the throne, gets a territory reduced of nine tenths and with only 1.143 inhabitants. 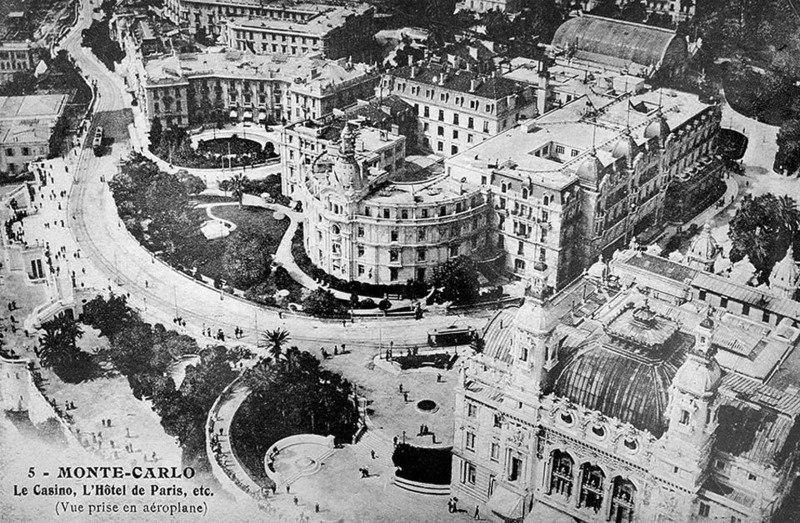 In exchange of this, by formally renouncing to his rights, he obtains from Napoleon III four millions of Francs, a carriage road Nice-Monaco, and the railway Nice-Monaco-Genoa, allowing the rich European tourists to easily reach the new ward of Monte Carlo, born in record time, with villas, gardens and a Casino on the “plateau des Spélugues”, where before there was only brushwood and, as the name suggests, some grottoes utilized by the shepherds. 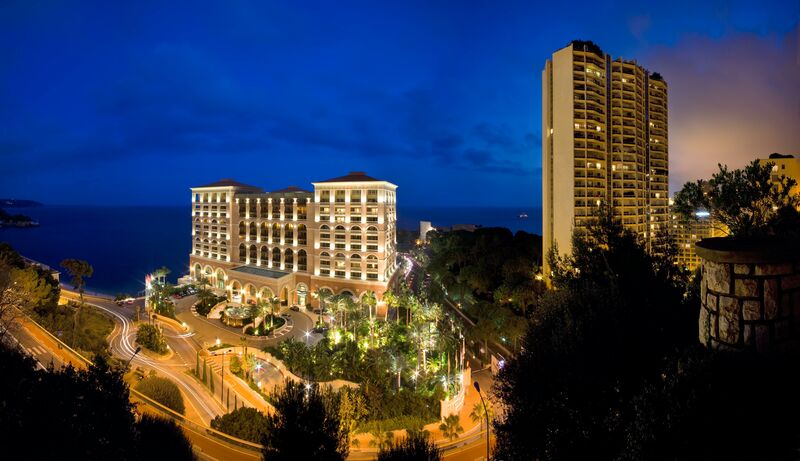 Monte Carlo becomes in short time synonym of elegance, feasts, displays, cultural and sporting events. 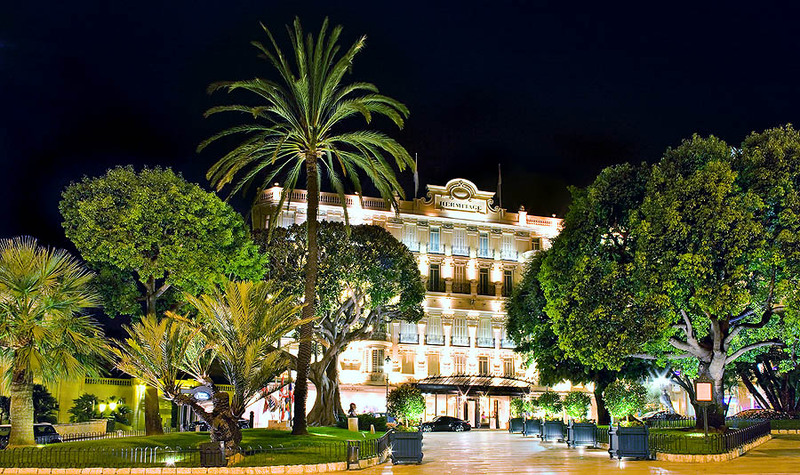 The direct taxes are abolished. 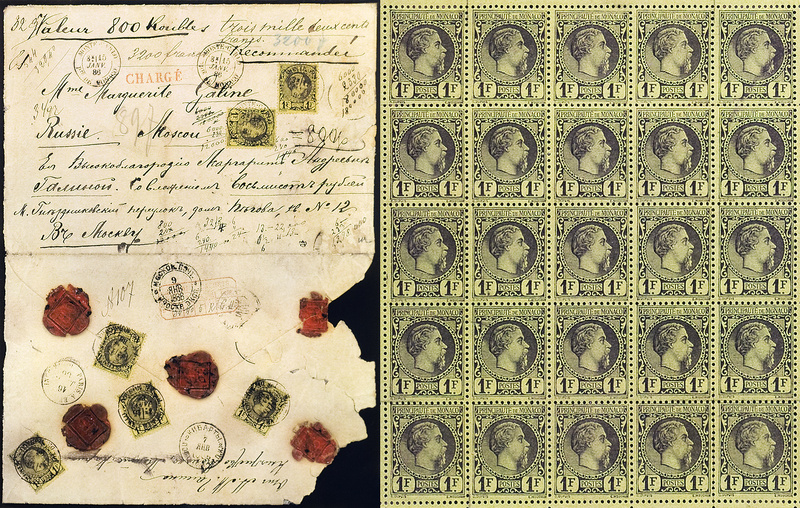 The prince mints golden coins, and can emit the first stamps. 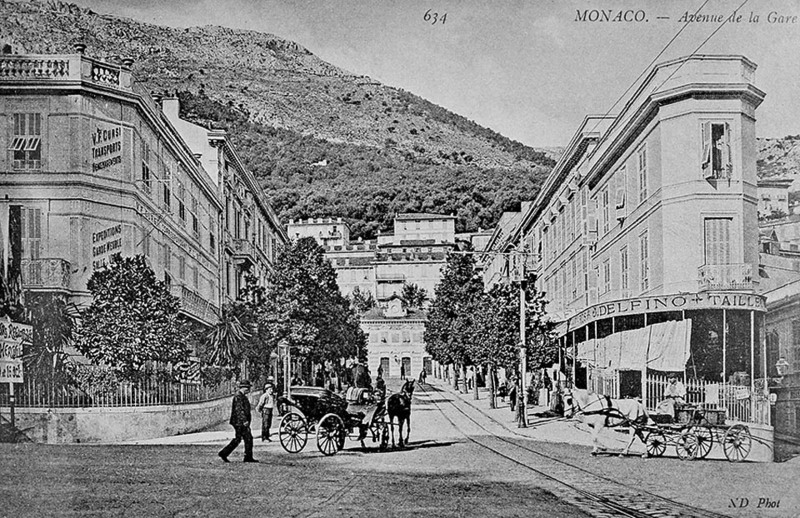 The recent history is known to everybody, with its extraordinary geographic researches and scientific discoveries of Prince Albert I, not to talk of the cultural, economic and social development continued by the Prince Louis II, who creates, among other things, the broadcasting station of Radio Monte Carlo and the motor Grand Prix of Monaco. 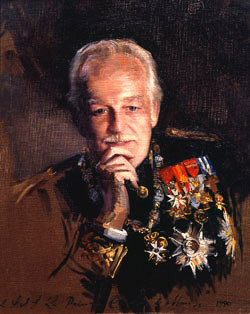 Upon his demise, in 1949, Prince Rainier III takes over. 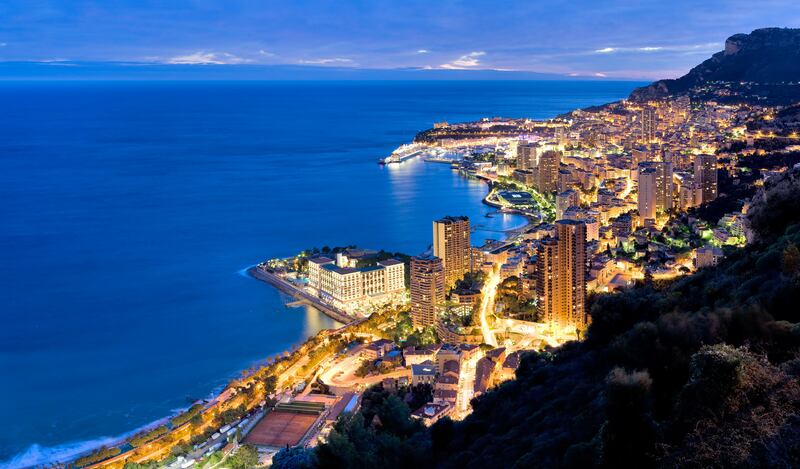 He is only 26 years old, and his rule will be one of the most important in the history of Monaco. Called also the “Building Prince”, is able to extend by one fifth the Principality with the areas taken from the sea. 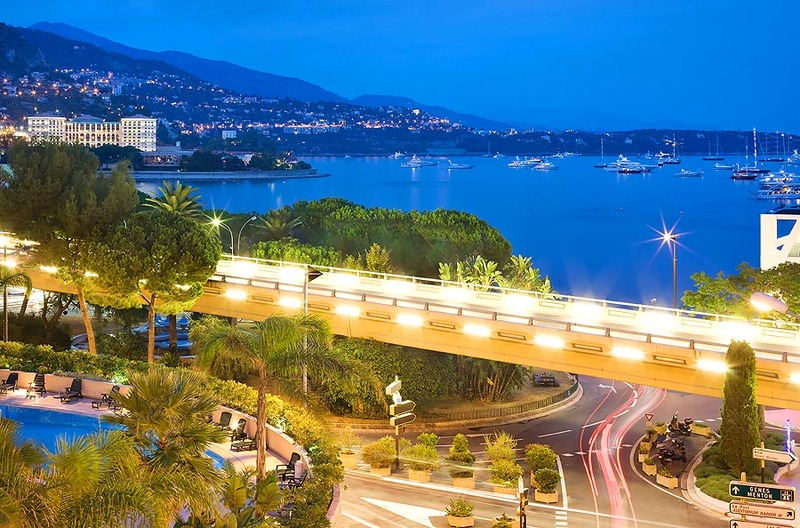 Create the beach of Larvotto, the modern ward of Fontvieille, the floating pier which allows the berthing of the huge cruise vessels, and all a series of buildings devoted to events, conventions, and international meetings, such as the recent Grimaldi Forum. 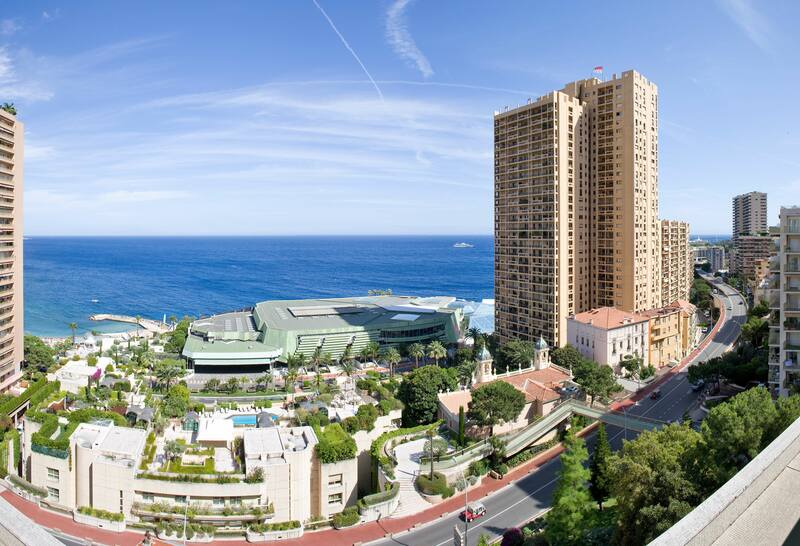 Monaco adheres to all great international bodies, and close to the tourism and the hotel activity, the bank activities and the building trade develop in an impressive manner. Beside him, the unforgettable Princess Grace will render the Principality known overseas with the marriage of the century. Almost like a “Foreign Affairs Minister”, she will contribute with her charisma and charm to the image of the Principality, helping her husband in the difficult decisions, without forgetting the charity and humanitarian works, and her role of mother. 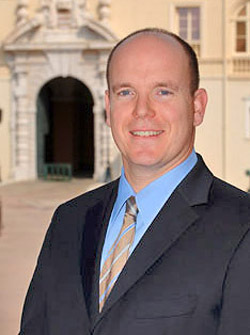 Ascended to the throne on April 6th 2005, His Highness the Prince Albert II continues on the traces of his father, whom he sided since 1984 in the management of the state affairs. 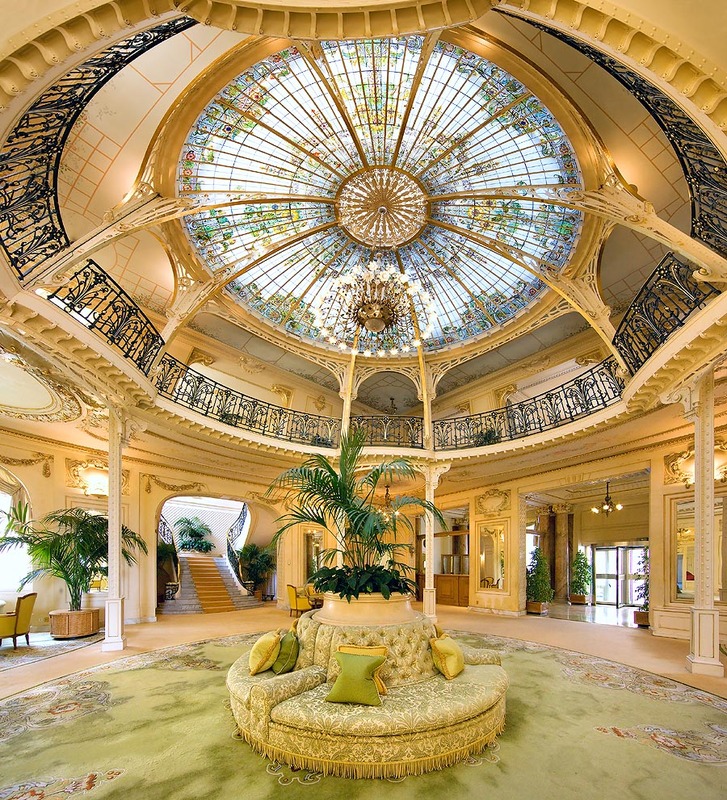 Like his great-grandfather, the Prince Albert I, he displays a sincere interest for the nature. 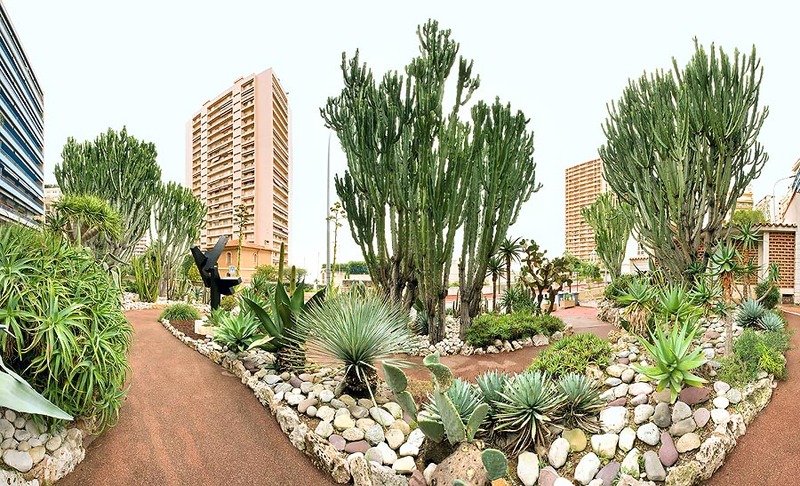 He has personally gone to the North and South Poles, for realizing personally the degradations related to the increase of the temperatures and to the global pollution, and to the Tropics for endangered forests and species, without forgetting the humanitarian missions. In connexion to this, on 2006, he has created the Prince Albert II de Monaco Foundation which acts for the protection of the biodiversity and the problems related to the climate changes and the lack of water. 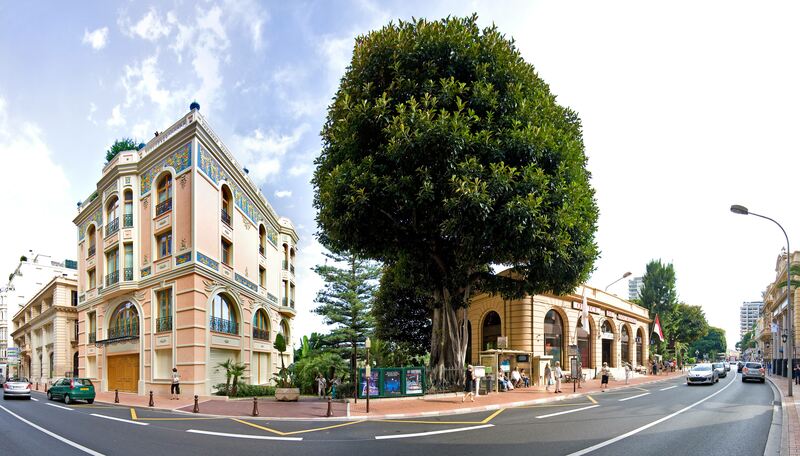 In the photos which follow, close to the geography of the Principality, you will discover several aspects of the Monegasque life, of our cultural and artistic heritage, and of our history. 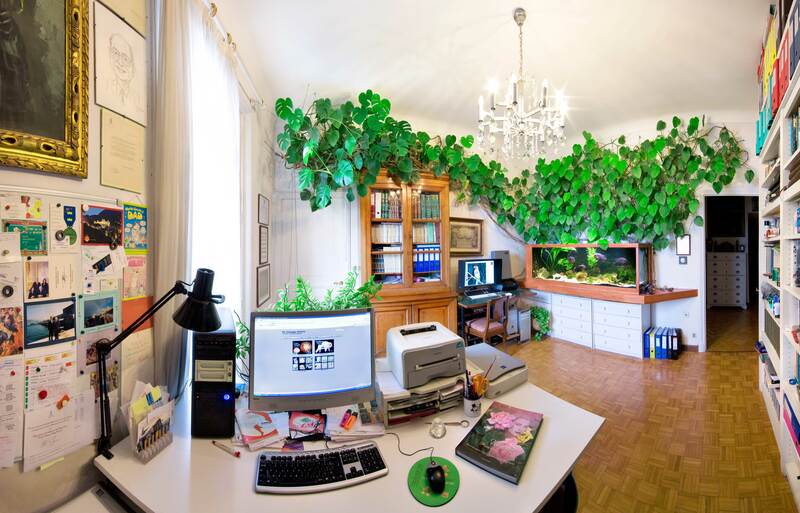 It is often matter of unusual views covering 180° and more, obtained sticking together, by computer, even 33 shots. Very heavy originals, which, at full resolution, fill up half of a DVD, and which I had, unwillingly, to reduce and compress in order to render them accessible on the web. 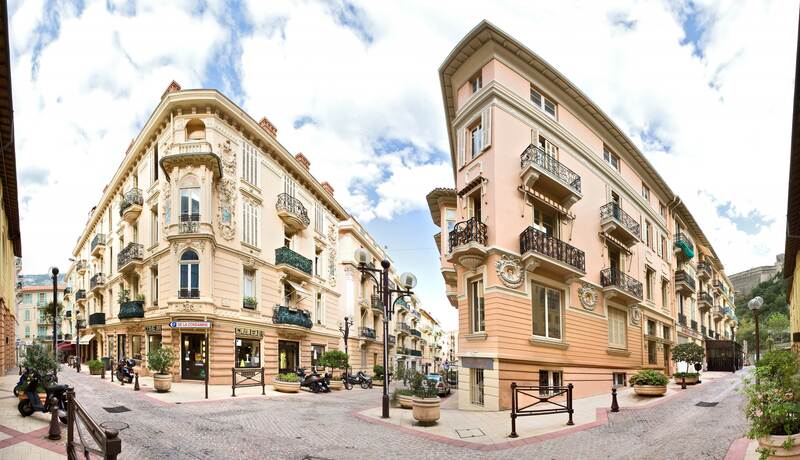 Some views may surprise, as, for getting a curve surface flat, we have to reach some compromise. I had, almost always, to adjust aberrant and broken lines and to draw things which had gone lost. 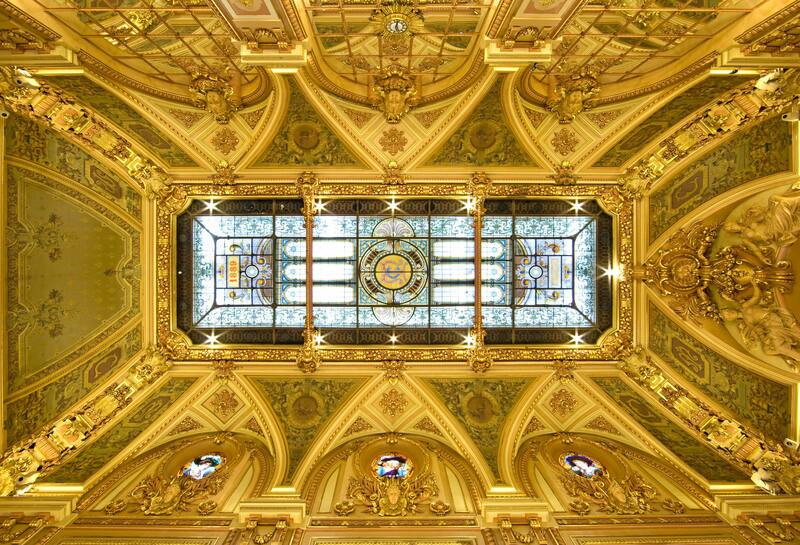 As an average, I have worked two days for each photo, at times with challenges at first sight impossible, but it is rightly here, at the moment of the shots and after, that stands the beauty of the artistic creation. Point and click one time only on the images here under to have them in fullscreen and a second time for getting the maximum enlargement and explore the details. 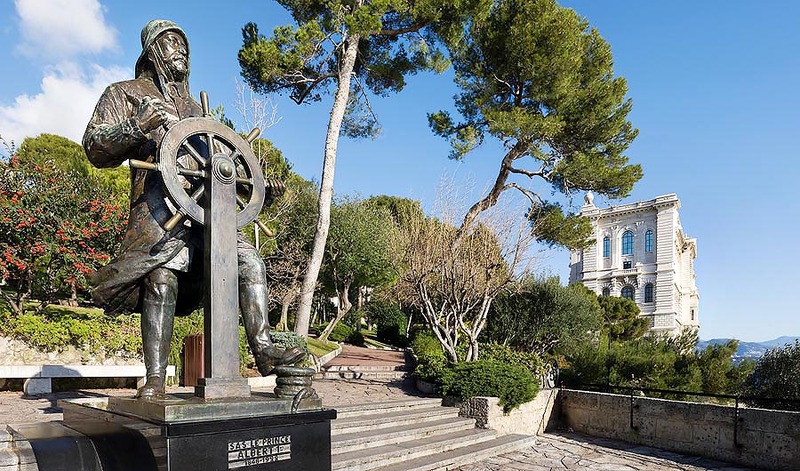 Monaco-Ville: the statue of François Grimaldi, called Malice, done by Kess Verkade, was inaugurated on Jan. 8th, 1997 on the Princes’ Palace Square for commemorating the 700th anniversary of the Grimaldi Dynasty. 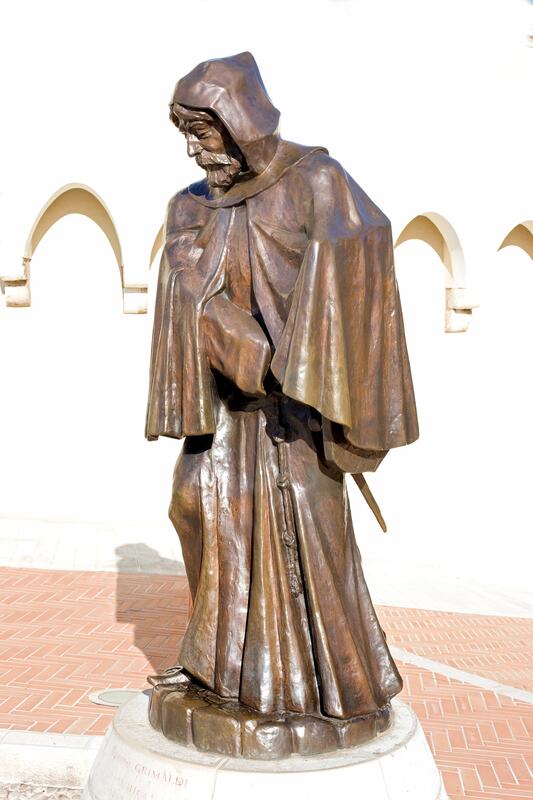 Disguised as a monk, he was able to get the guard station open, and to conquer the fortress, which, in this way, passed from the hands of the Ghibellines to the Guelphs’ ones. 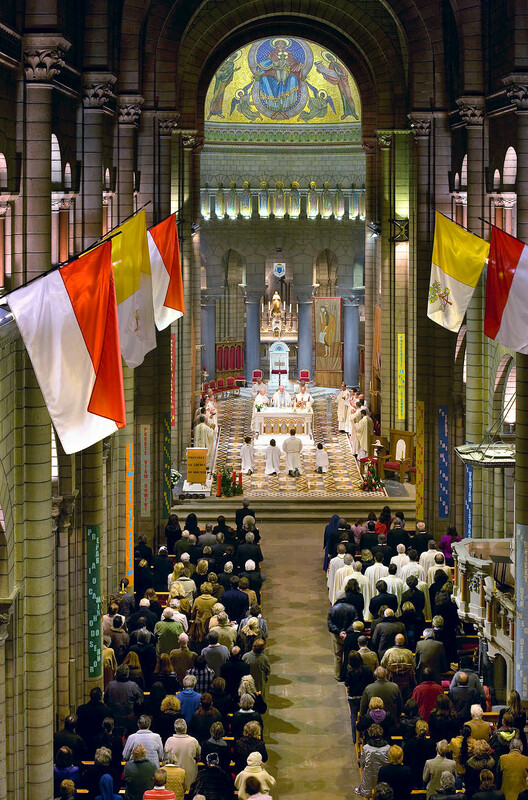 The Cathedral on occasion of the National Holiday. 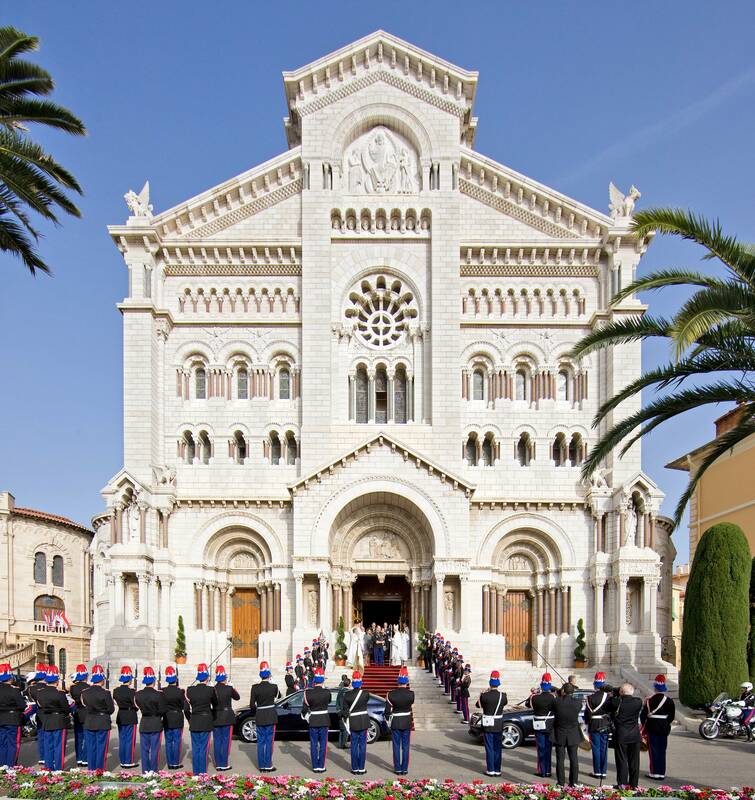 While leaving, HRH the Prince Albert II greets the Archbishop, Msgr. 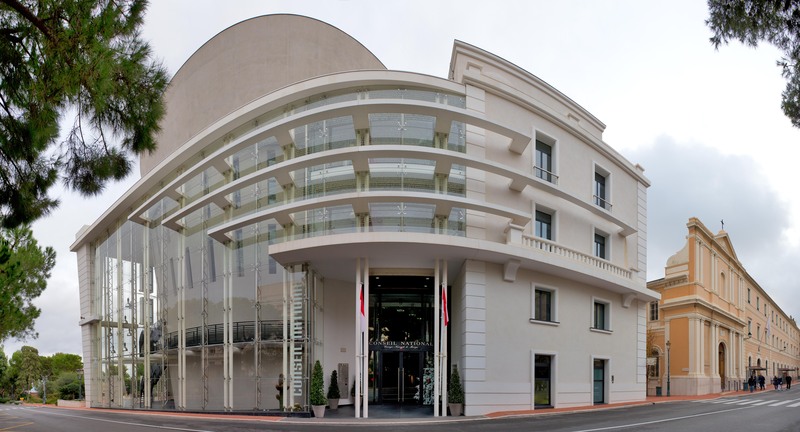 Bernard Barsi, surrounded by HRH the Princess of Hannover and by HRH the Princess Stéphanie of Monaco. The altarpiece of St. Nicholas, visible in the Cathedral ambulatory, was realized in 1500 by Louis Bréa, famous paint Nice master who operated, marking a transition point between the Medieval painting and the Renaissance one. 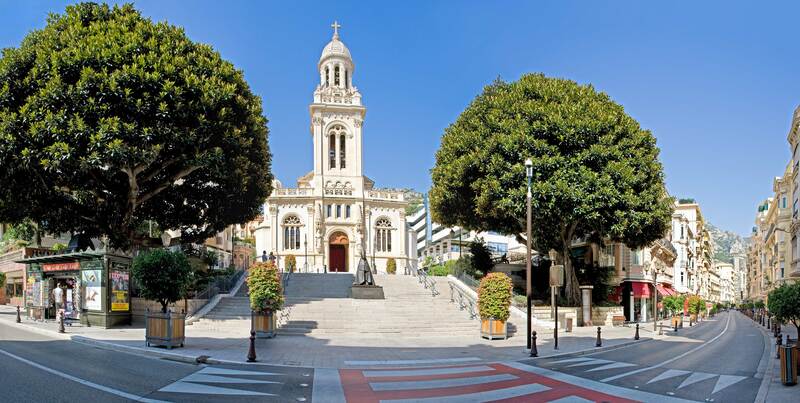 Under, on the left, close to St. Nicholas, patron of Monaco and bishop of Myra, St. Michael stabs and tramples an evil, half man and half dog, and weighs the souls for the Final Judgement, while St. Stephen, hit by a stone in me- mory of his lapidation, looks towards the beholder. On the right, St. Lawrence with the Roman Church registry, read again before martyrdom, and his torture gridiron, and St. Mary of Magdala, with her box of ointment for the Christ. 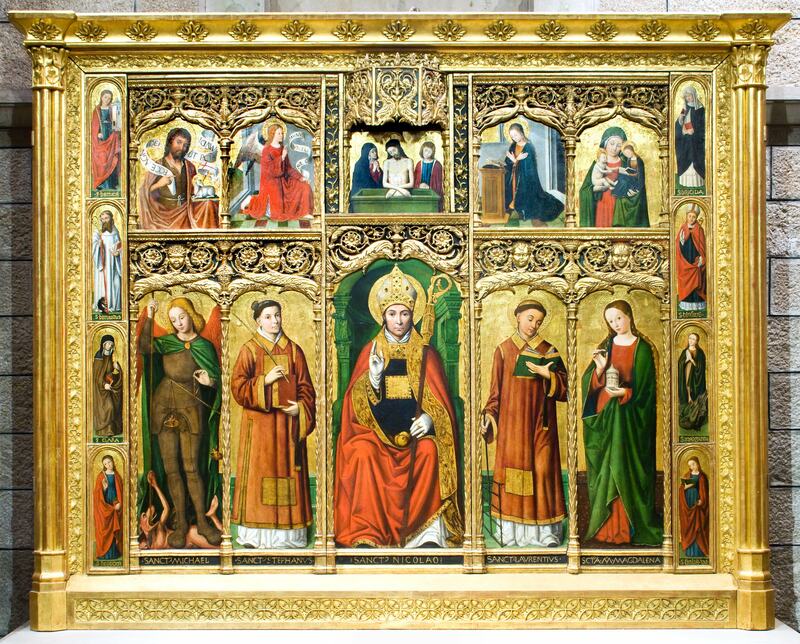 On the sides, to the left, St. Barbara, St. Bernard, St. Clare of Assisi and St. Devote. 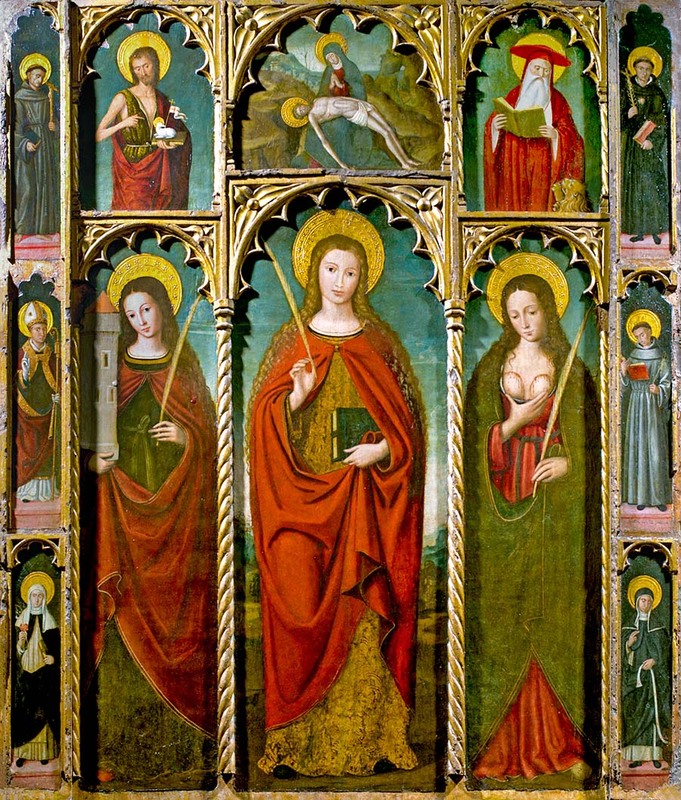 To the right, St. Brigid, we do not know quite well if of Ireland or Sweden, St. Blaise of Sivas, St. Margaret with in her hand the cross utilized in prison just in order to send away Satan, in the shape of a dragon, and St. Julia, patron of Corsica along with St. Devote. 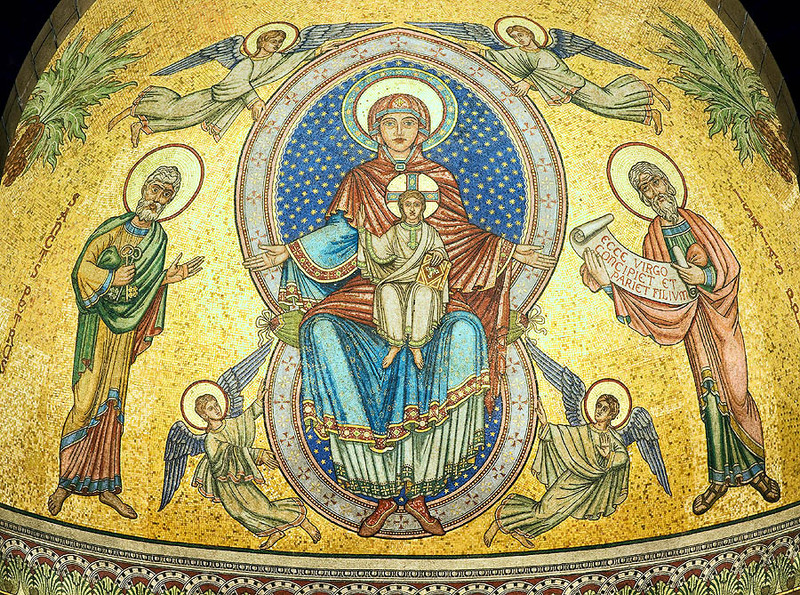 Upwards, on the sides of the Holy Sepulchre of Christ, St. John the Baptist, the Archangel Gabriel with the Annun- ciation to the Virgin Mary, and an unusual portray of St. Anne, ideally holding in her arms Mary and the Child. 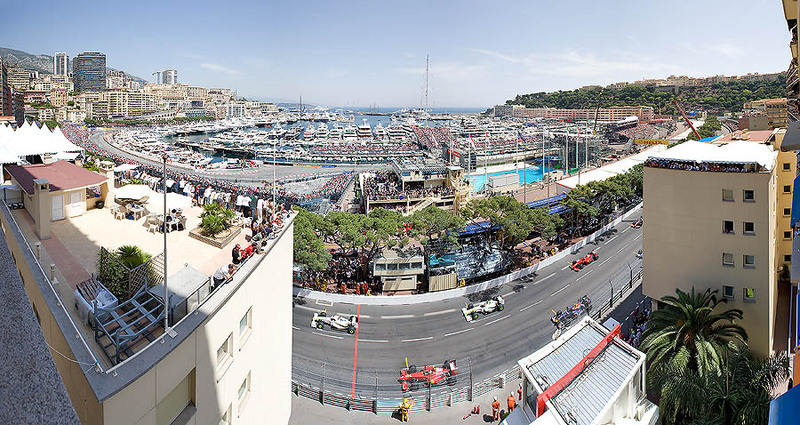 Monaco: St. Devote sided by St. George and St. Lucy. 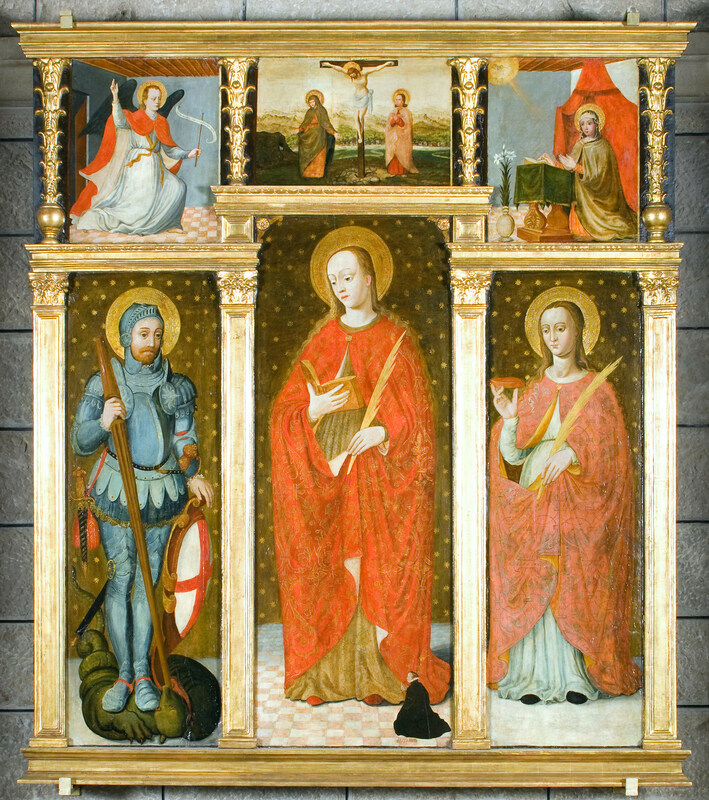 Polyptych by unknown Ligurian school author, offered around 1560-1570 by Isabelle Grimaldi, wife of the Prince Honoré I, shown in miniature, knelt downbelow, in the central panel. Upward, the Virgin Annunciation with the Archangel Gabriel and the Crucifixion. 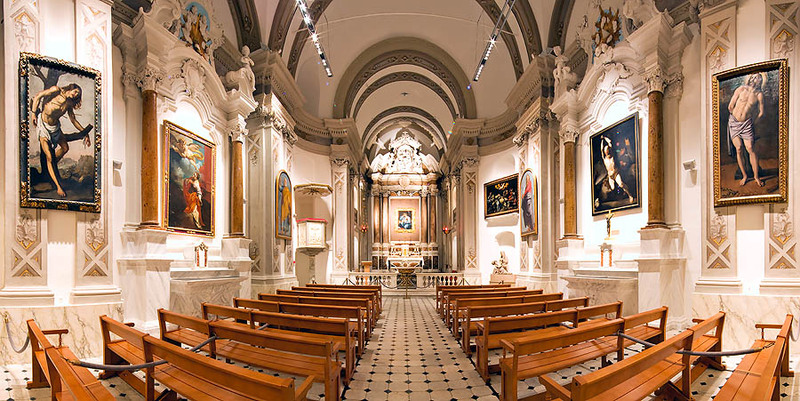 Monaco: “La Pietà” so called of the Curate Antoine Teste. 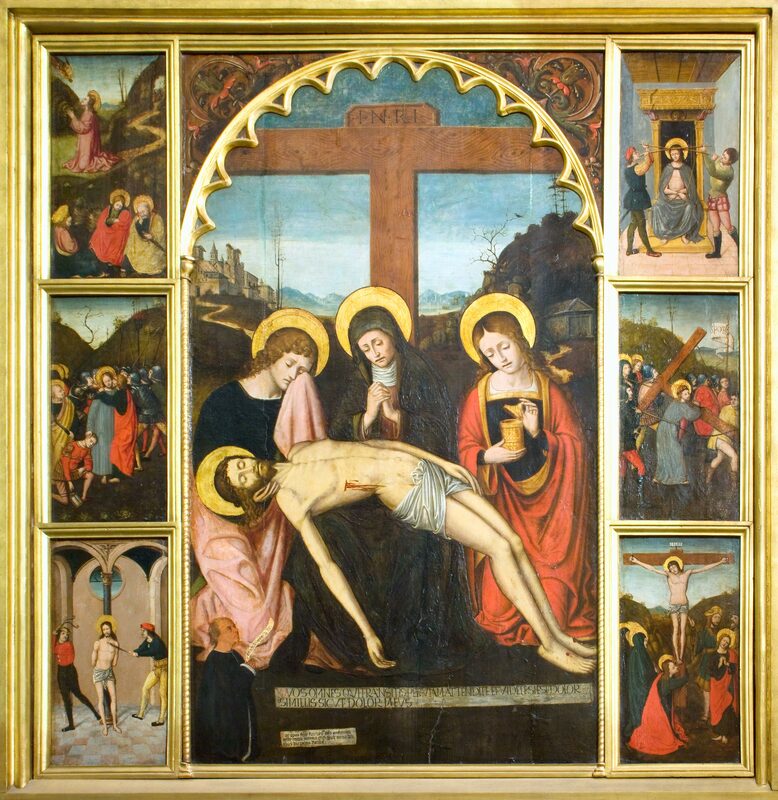 Polyptych ordered to Louis Bréa, by the parish of Saint Nicholas, and completed on April 1st, 1505. 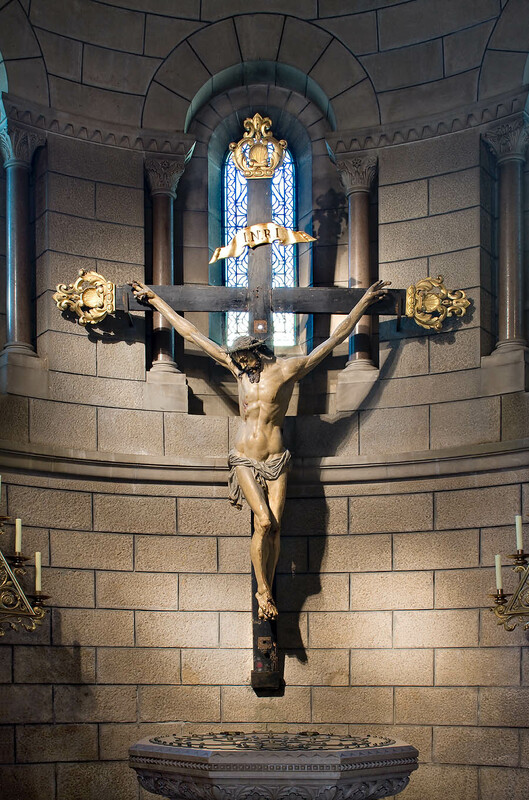 Monaco Cathedral: XVII century baptismal font and wooden 1637 Crucifix coming from the old St. Nicholas Church. 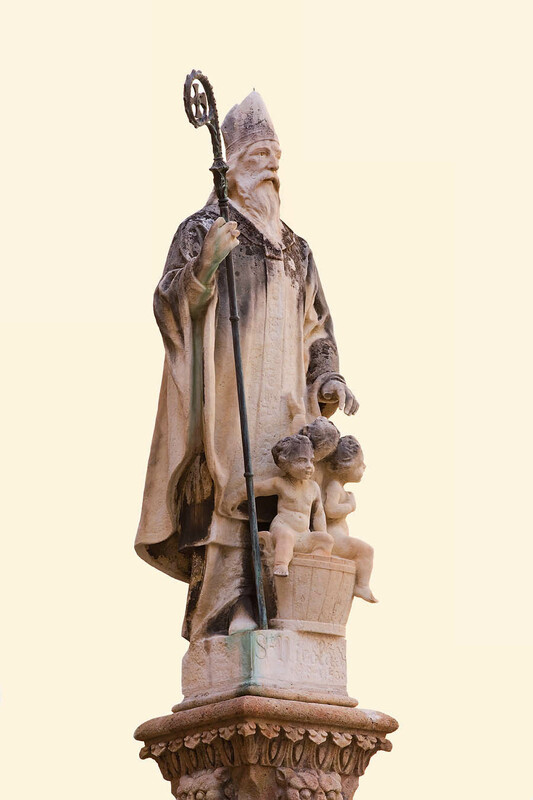 Bassignani’s work, the statue of St. Nicholas, patron of seamen and children, and of Monaco along with St. Devota, surmounts the fountain of the square which holds the same name in Monaco-Ville. 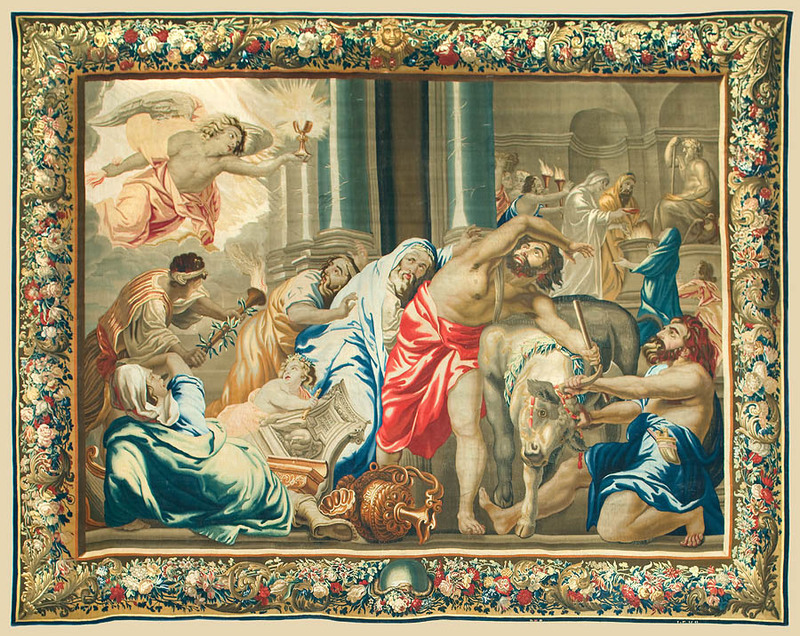 Monaco-Ville: tapestry “The Triumph of the Eucharist” over the pagan sacrifices, by Jean Franc Van De Hecke around 1691, after a cartoon by Rubens, dated 1625-26. Built by Giacomo Taddeo Cantone, under Prince Honoré II rule, the Chapel of the Miséricorde in Monaco-Ville is honoured to St. John the Baptist. 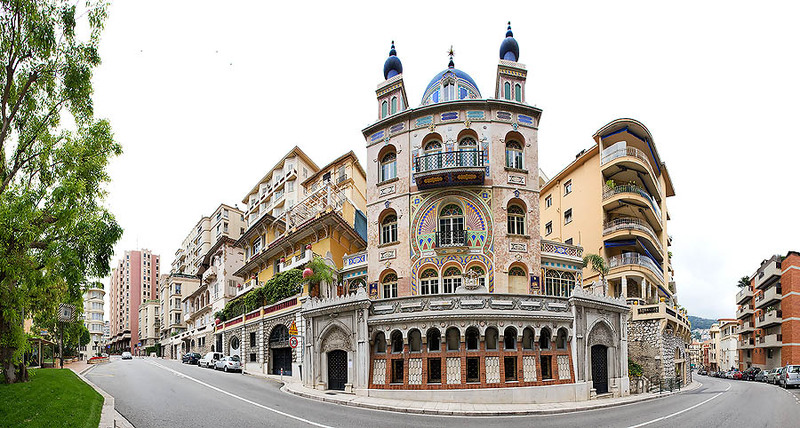 The huge ceramics on the façade of the Chapel of the Miséricorde in Monaco-Ville by Ernesto Sprega, master craftsman of the famous Monégasque terracottas, represents the Black Penitents and the head of St. John the Baptist. 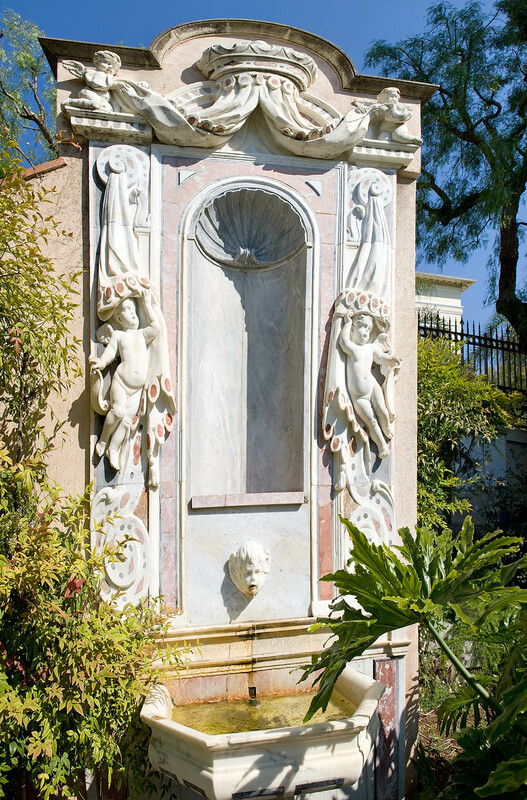 Monaco-Ville: the “Piaçeta Bosio” with its water well, once active, recalls François-Joseph Bosio, Monégasque sculptor. He worked in Monaco, in Italy and in Paris, where he became famous for his bust of the Empress Joséphine and the equestrian statue of Louis XIV. Louis XVIII ordered him the bronze quadriga on the Arc de Triomphe du Carrousel, Paris. 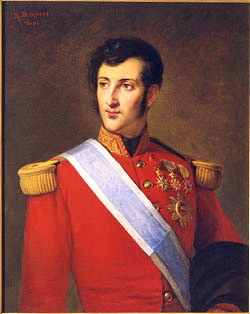 In 1828, he was made Baron of the French Monarchy by Charles X. Several ceramics of the old “Poterie de Monaco” are exposed in the Museum of ancient Monaco, located at the number 2 of Emil de Loth street in Monaco Ville. 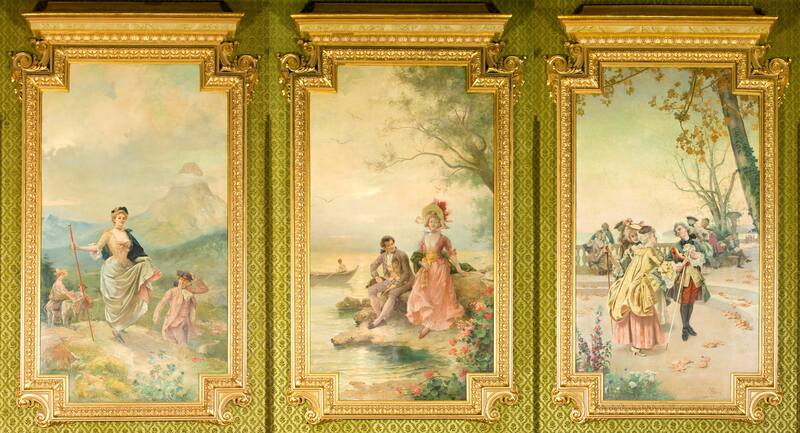 The most valued pieces are those realized by Ernesto Sprega (1829-1911), who was its director from 1883 to 1889. 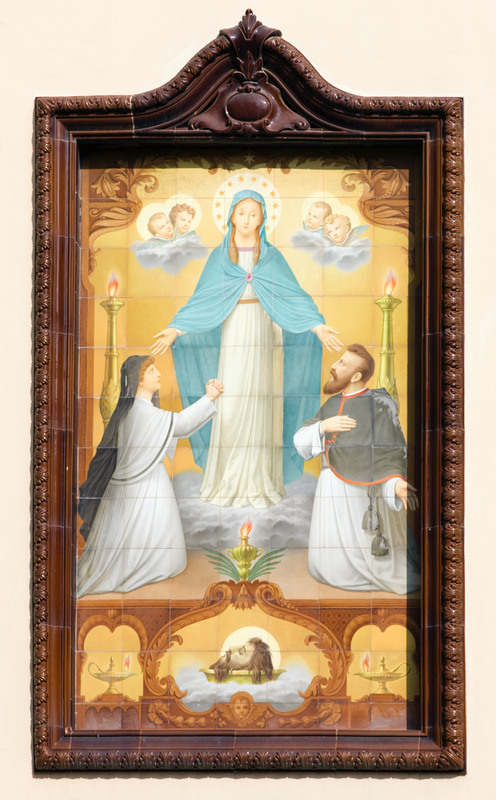 Of Roman origin, he was a pupil of the famous master Mantovani, and later operated in Florence for Ginori, eminent painter and ceramist. 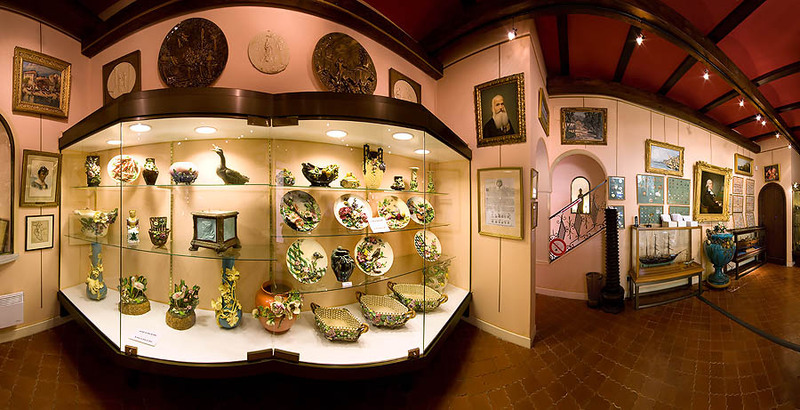 Ernesto Sprega, shown in the self-portrait on top at the right of the show-case, created, during his stay in Monaco, several ceramics and paintings. He made himself known mainly for the “cannage”, an absolutely personal technique giving the pots and baskets a graceful look, very similar to the true ones, pleached with straw and rushes. 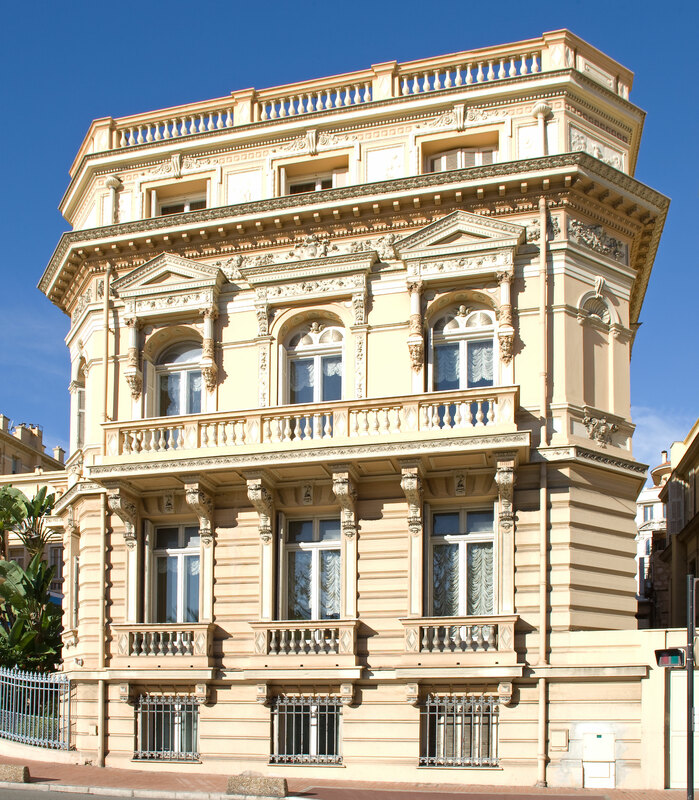 This technique, along with his never-ending research for new forms and colours, brought him several acknowledgements while representing Monaco in International Exhibitions. 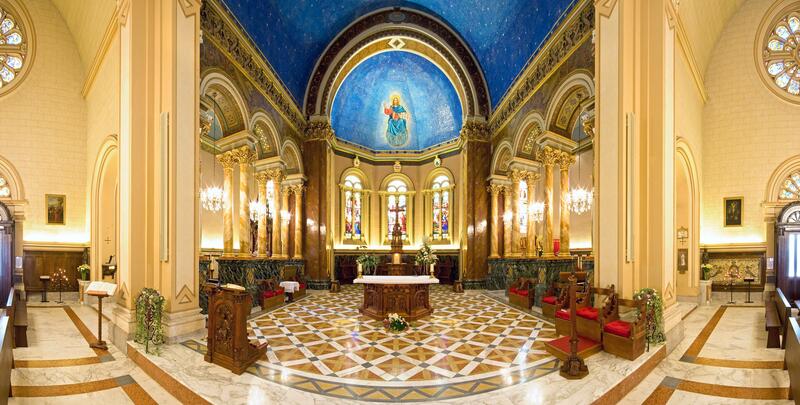 Besides as talented ceramist, Ernesto Sprega is to be remembered for his numerous frescoes in the Palatine Chapel and in the Private Apartments of the Princes’ Palace. Between 1524 and 1641, during 117 years, the Principality of Monaco was under the more and more intrusive protection of Spain. Only one remembrance of that time stands in Monaco-Ville, in the Passage of the Misericorde. 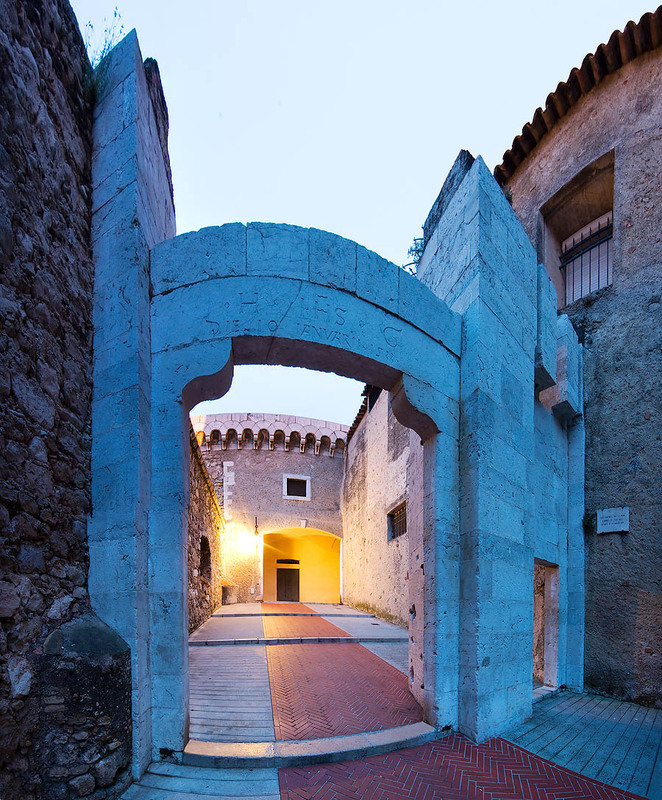 Over the door of an ancient house, we read, in a mixture of Spanish and Italian languages: “15th March 1548. Deo Juvante. 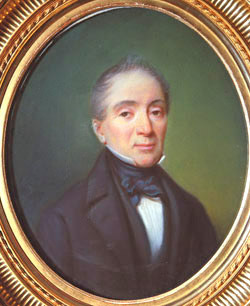 Pietro Carbonero. 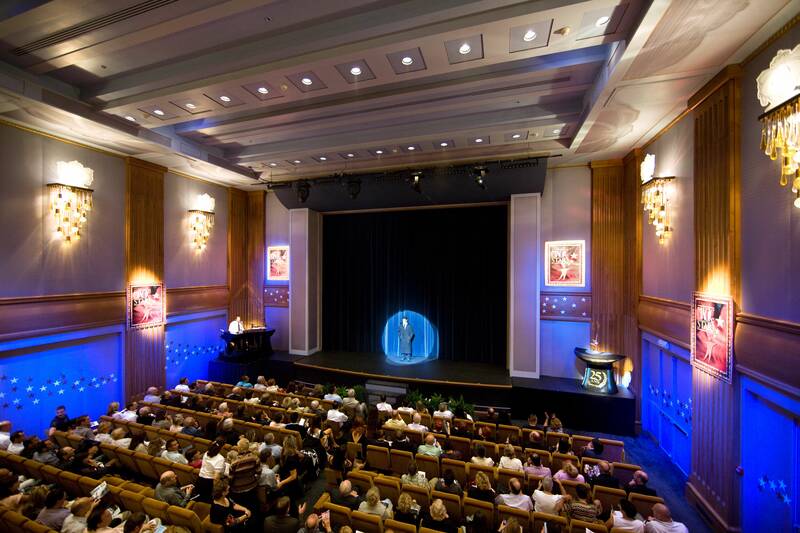 All earthly things pass by quickly, but fame and glory”. 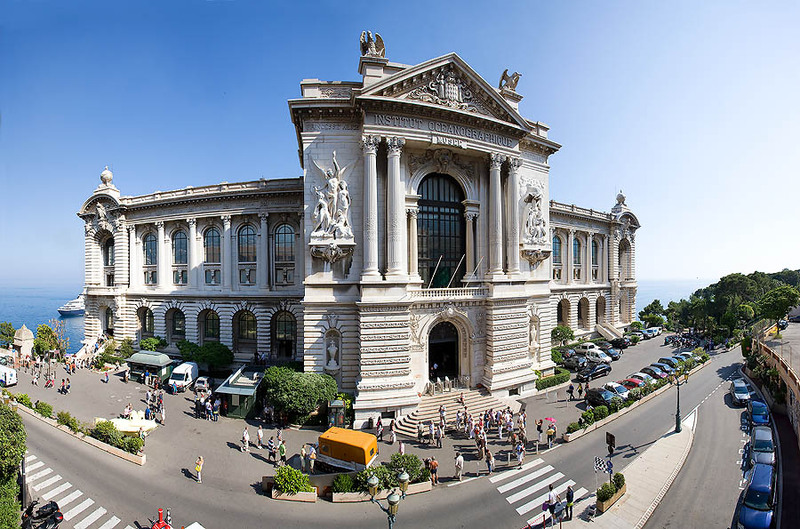 Rightly called “The Temple of the Sea”, the Oceanographic Museum magically unites as one body with the impressive scenery of the Rock of Monaco as seen from the open sea. Monaco-Ville: the famous Oceanographic Museum is a neo-classic work of the architect Paul Delefortrie. Built between 1899 and 1910, under the rule of Prince Albert I, it has a monumental façade with great sculptures by Gustave Dussart. 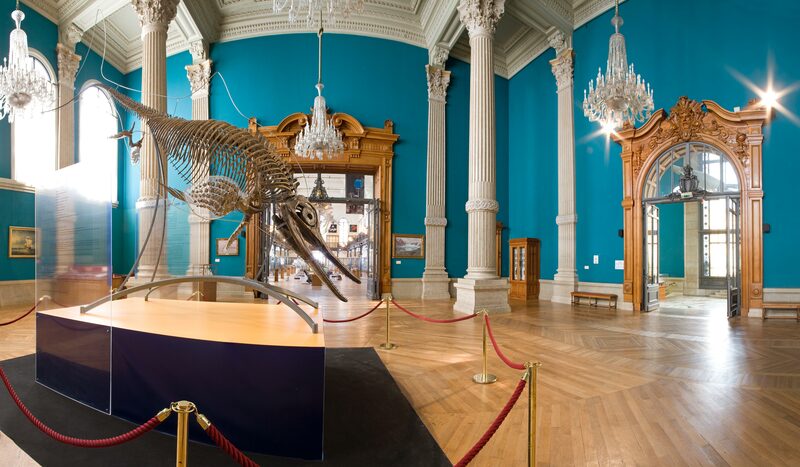 Monaco-Ville: the “hall of the whale” of the Oceanographic Museum with skeletons of Balaenoptera physalus, Pseudorca crassidens, and Orcinus orca. 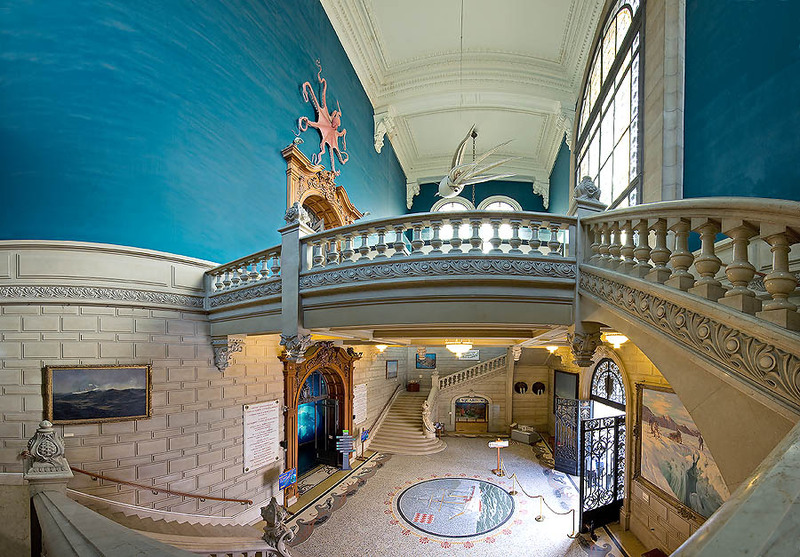 Monaco Oceanographic Museum: exposition of Ophthalmosaurus anna, a fossil of a sea reptile born 150 millions of years ago. 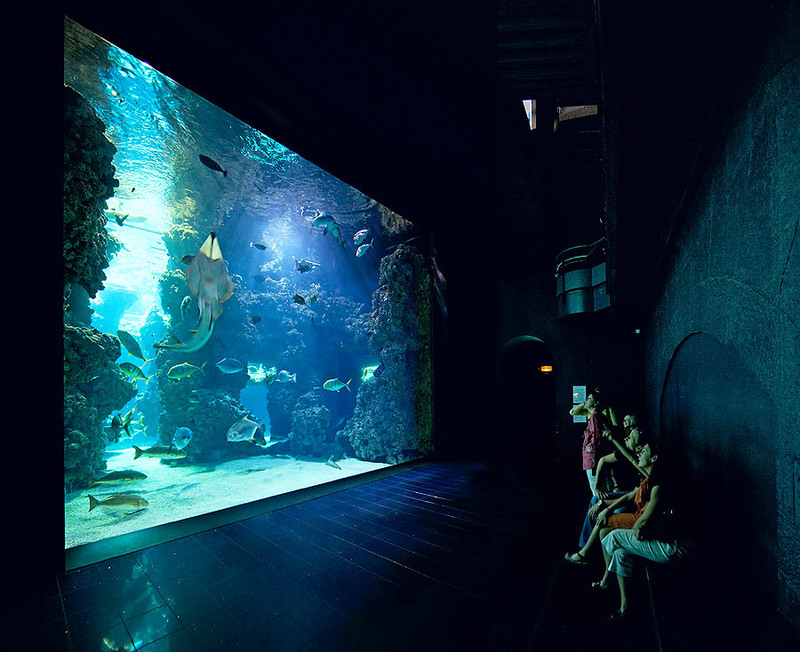 Due to its hydrodynamic and morphologic structure, it recalls a dolphin, but it has a vertical fin, like a shark, and a crocodile jaw. 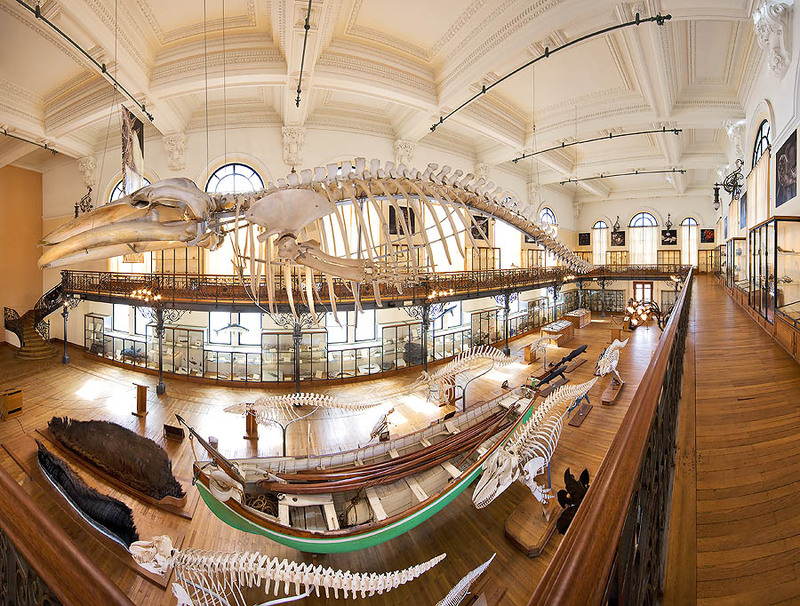 5,40 m long, it weighed 1.000 Kg and had the largest eyes in the animal world. It was hunting the giant cuttlefishes in the great depths. Monaco: the Stamps and Coins Museum. Letter stamped with 3.200 F or with 6 x 1 F Charles III and a unique 25 stamps block. 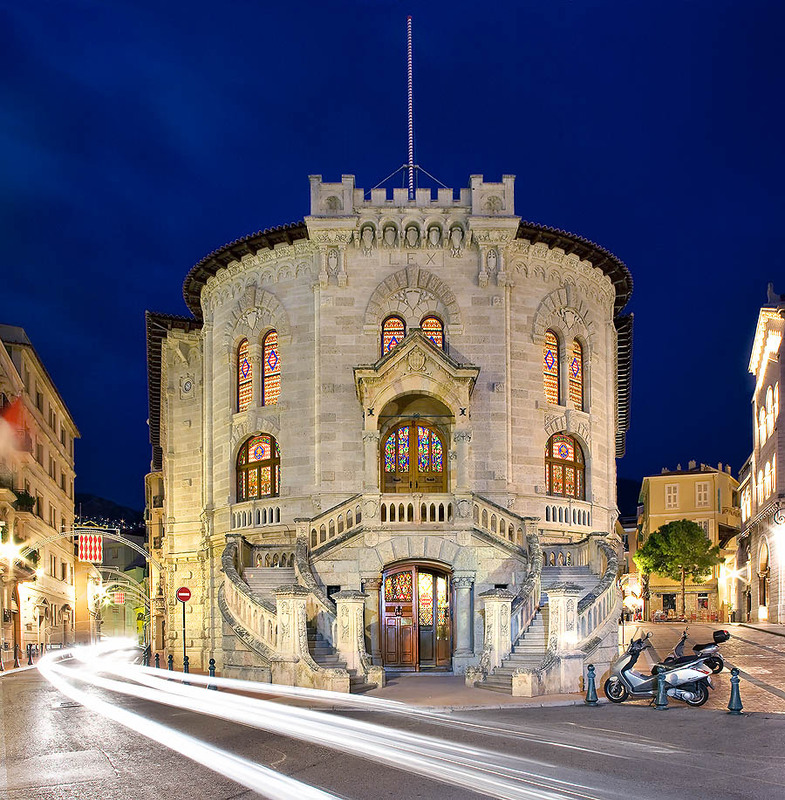 Monaco: the Stamps and Coins Museum. 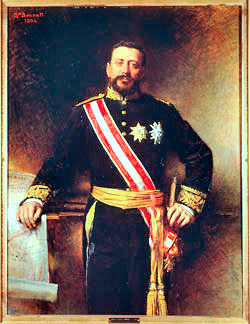 “Douze Gros”, called “Florino”, coin and “Pistol d’or de 10 livres”, representing Prince Honoré II. 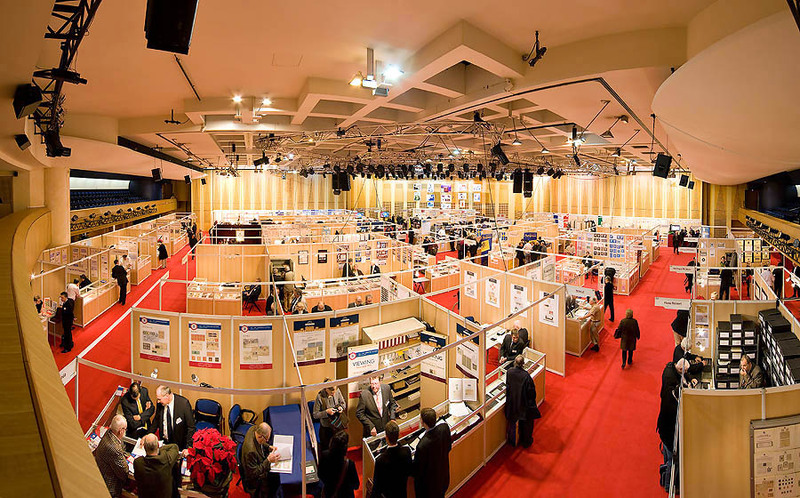 The “Salle du Canton” gives hospitality, every two years, to the Monacophil, the prestigious international stamp exhibition. Monaco: the Seaside Plaza and the Fontvieille Chapiteau, which yearly accomodates the Circus International Festival. 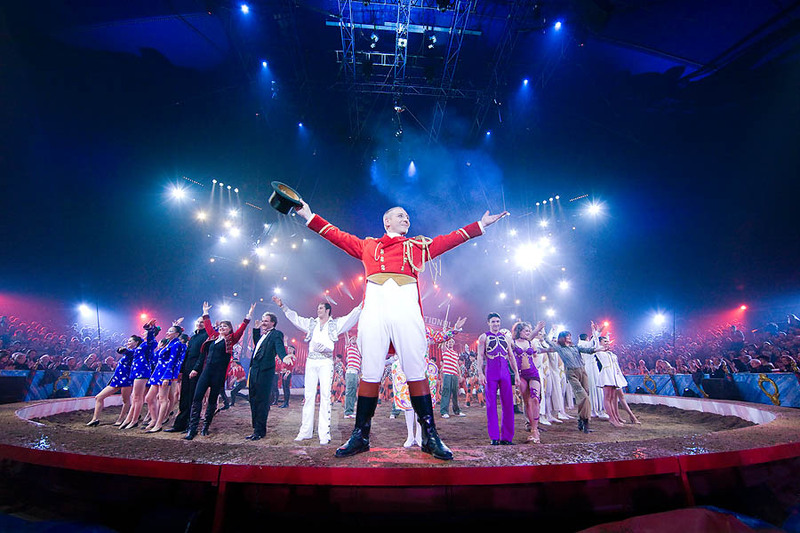 The Monte Carlo International Circus Festival, strongly wanted by HRH, the Prince Rainier III, attracts every year 50.000 beholders. On the track, the California Sea-lions of Pietra and Roland Duss, born in their “water farm” in Spain. 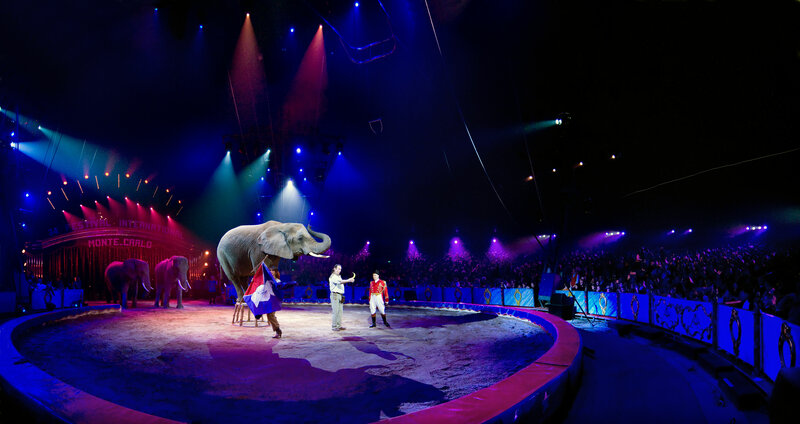 Monte Carlo International Circus Festival: the African elephant Kenya, trained by the German family Frankello, plays the harmonica and performs legerdemains, transforming apples into bananas. Monte Carlo International Circus Festival: grace and synchronism in the extraordinary show of the Mongolian contortionists. 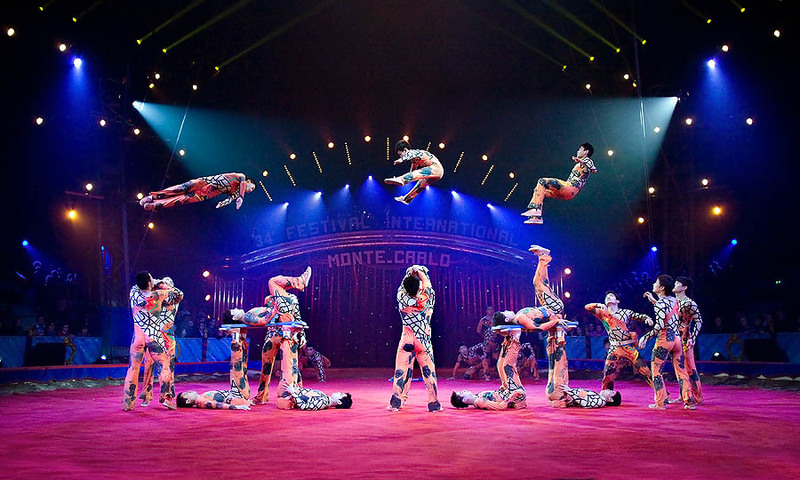 Monte Carlo International Circus Festival: the Shandong Acrobatic Group, with 21 Chinese artists which perform, from pyramidal formations, incredible vaulting and somersaults. Monte Carlo International Circus Festival: Martin Lacey Junior, a modern tamer who kisses and embraces his lions, real stars of the German circus Krone. 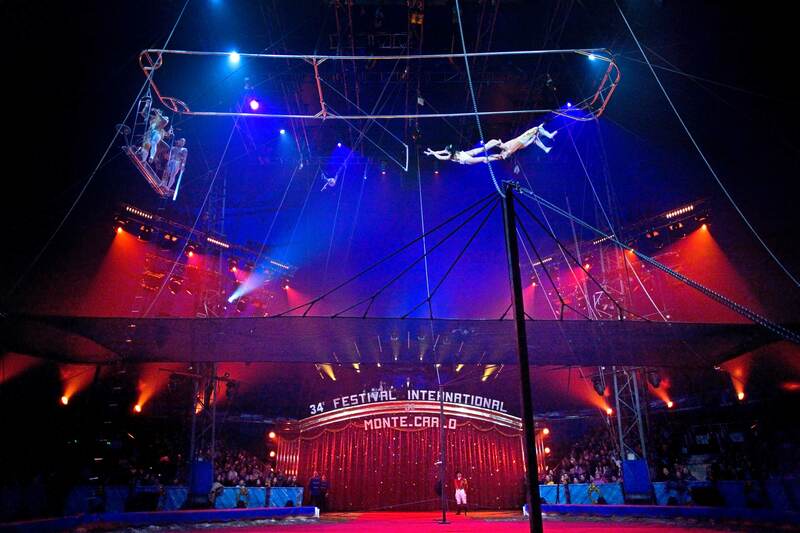 Monte Carlo International Circus Festival: the flying trapeze is one of the most beautiful disciplines of the circus. Here, the Brazilian “Flying Michaels”. 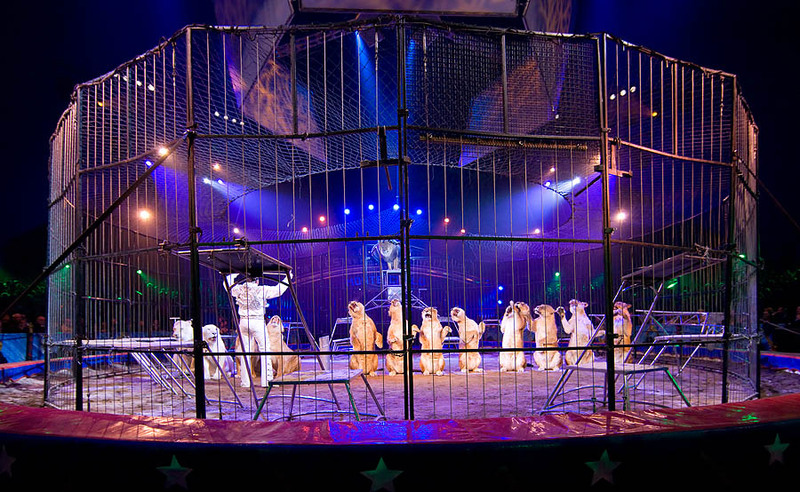 A show consisting even in triple blindfold somersaults …. and the protection of a net. 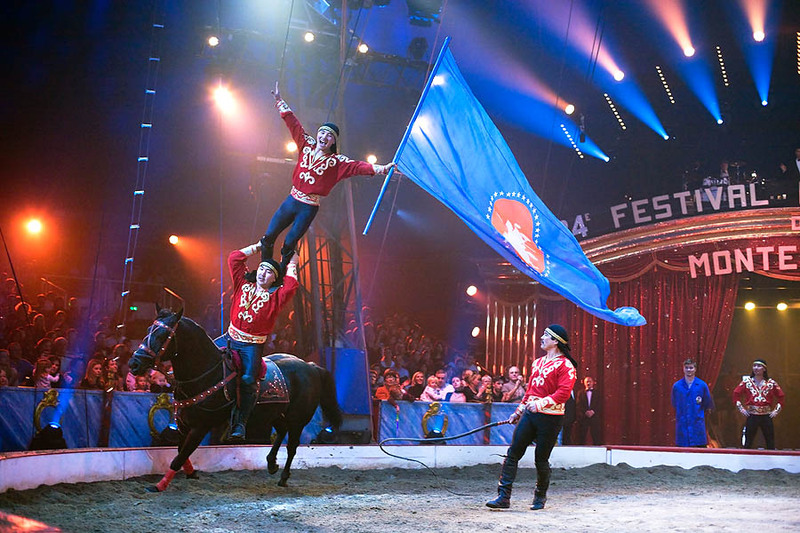 Monte Carlo International Circus Festival: horses riding at full gallop, with equestrian acrobats from Kirghizstan, directed by Manatbek Eshimbekov. 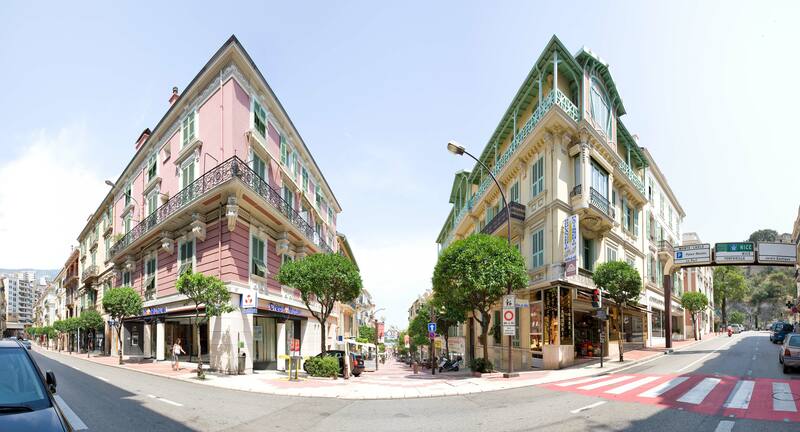 Monaco: Gastaud Square is the heart of the ward of the Condamine. 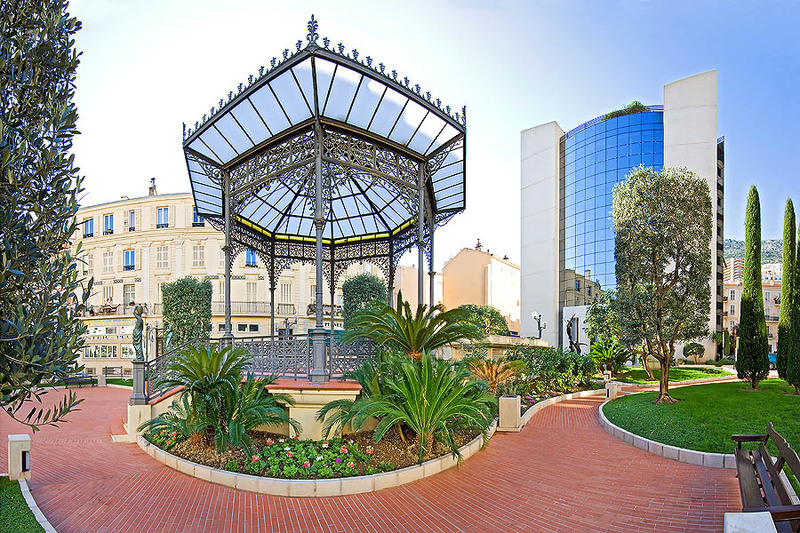 At the centre, a Belle Époque bandstand, still utilized in summer, for open air concerts. Monaco: time seems having stopped in Rue Terrazzani and in Rue of Açores, in Condamine. 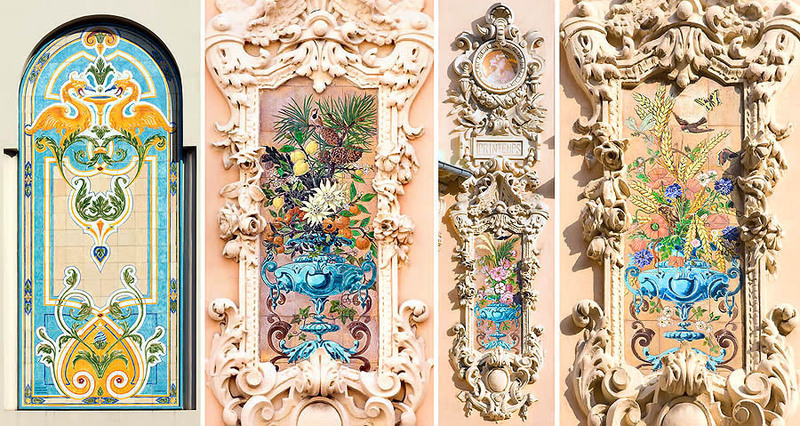 Old façades ornated by precious ceramics remind us the rich bourgeoisie of the Belle Époque. 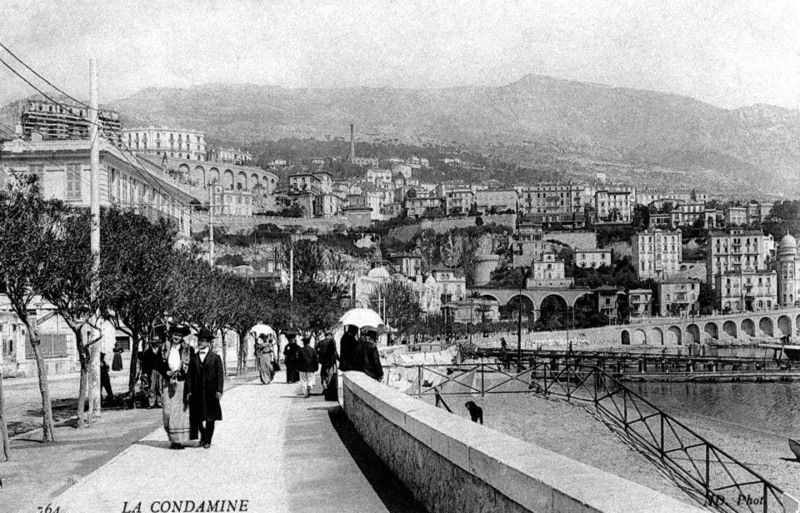 Monaco: the Condamine. The astonishing ceramics of the five continents ladies of Rue Terrazzani. 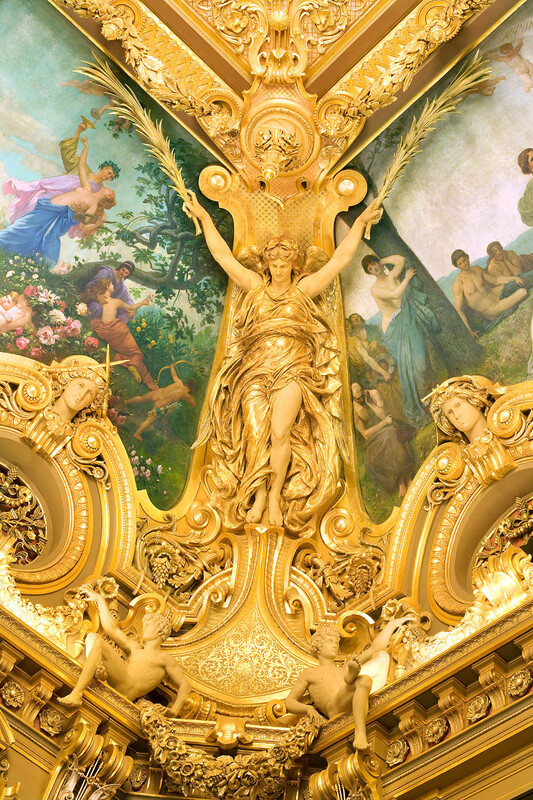 Another Belle Époque decoration in Avenue de Grande Bretagne. 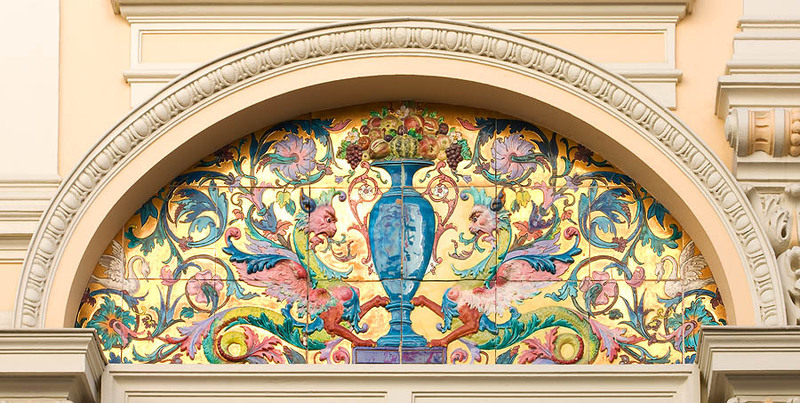 At the Universal Exposition of Vienna, in 1873, Monaco was remarked for its ceramics, introduced by Mrs. Marie Blanc , wife of the Casino director. 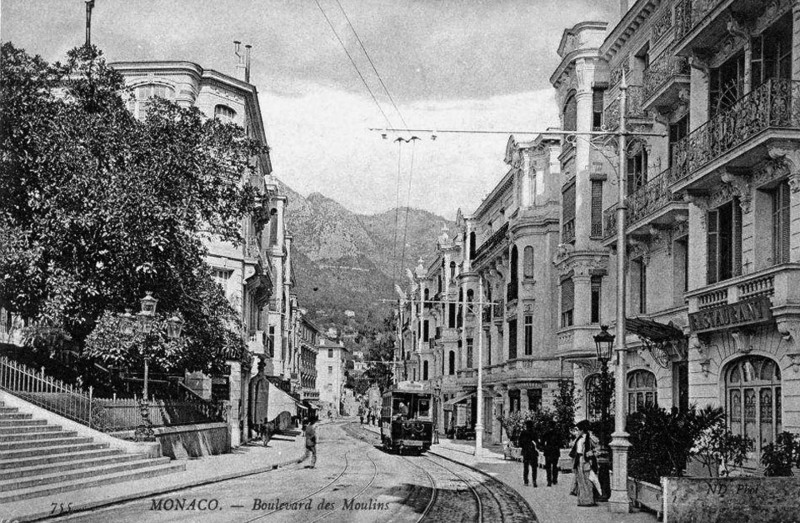 Actually, they had been made in the Pyrenees, not in Monaco, by the ceramics maker Fischer. 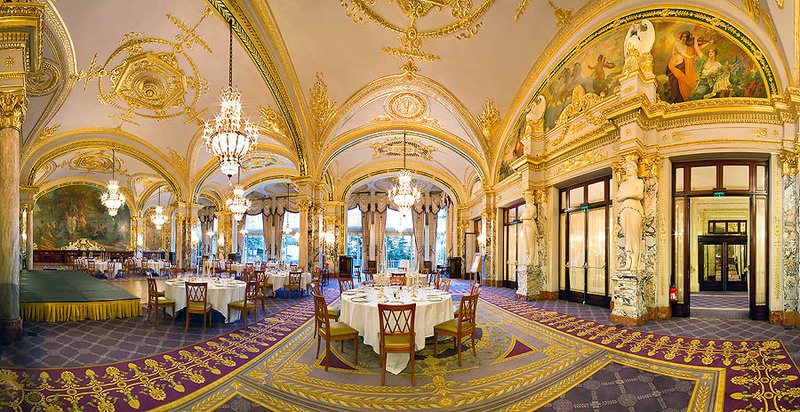 The success was such, that he was called in Monaco to direct the “Monte Carlo Artistic Ceramics Factory”. 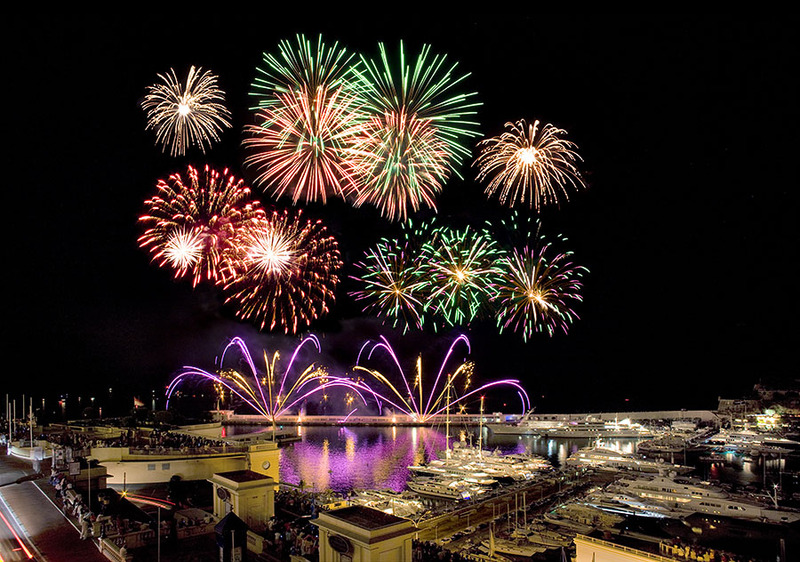 Monaco: every year, on January 27th, they burn a boat on the parvise of the church, in memory of the Patron Saint relics’ thefts, happened in the Middle Age. A violent storm did not allow the sacrilegious to leave. He was caught. 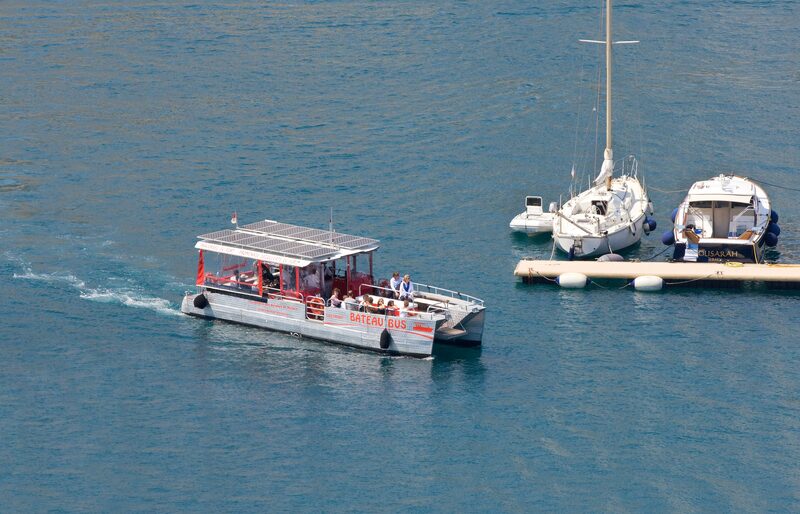 His nose and ears were cut off, and his boat burnt. 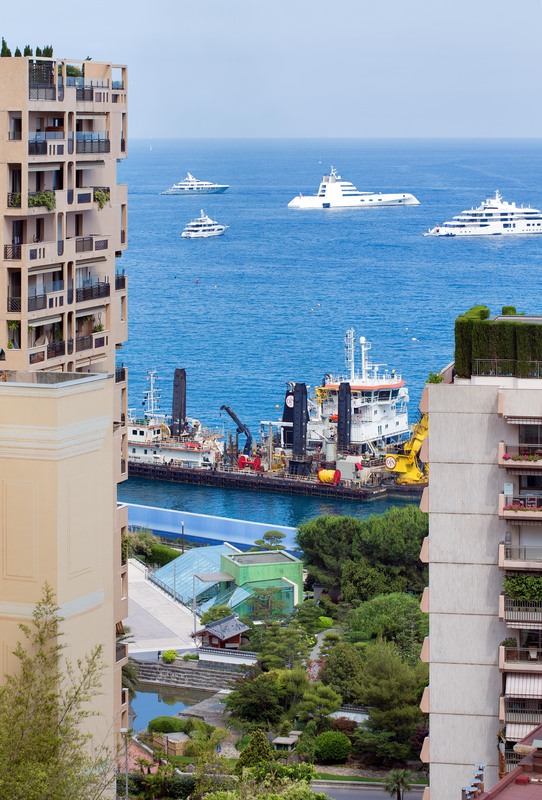 Monaco: starting from the underground station, conveyor-belts, through marble passages, and public elevators, rapidly convey people from one side to the other of the city. 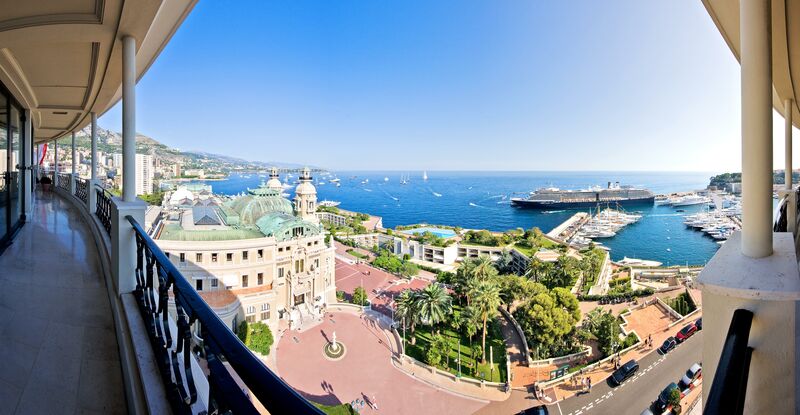 Monte Carlo and the Port d’Hercule, from St. Dévote church, left on the bottom, to the Casino terraces, in occasion of the Monaco Yacht Show. 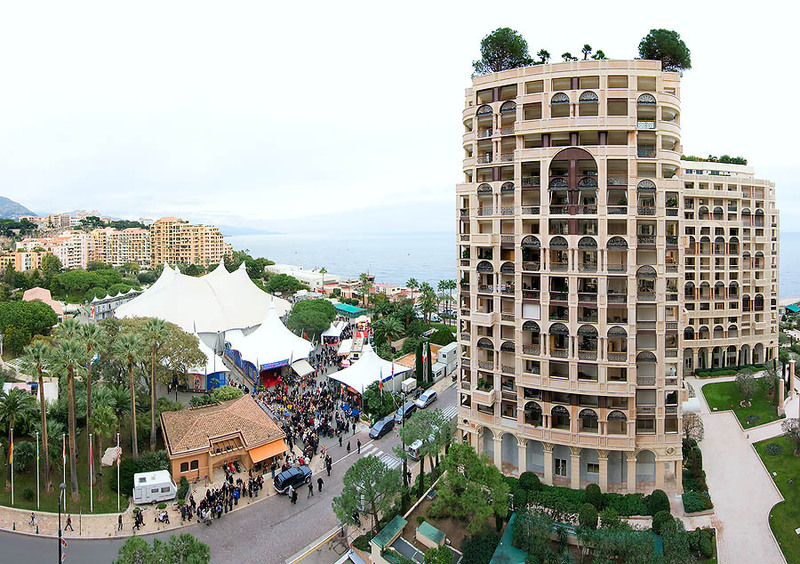 A gay patchwork of various architectonic styles and of underway works, such as those of the future seat of the Monaco Yacht Club, right on the bottom. Perfectly ecologic, with zero emissions thanks to its solar panels placed on the top, the “Bateau Bus” crosses, continuously, the port of Monaco integrating the city buses service. Adam and Eve sculpture by Botero on the Casino Terraces in Monte Carlo, and the mosaic “Sea, Sky and Land”, by Vasarely. 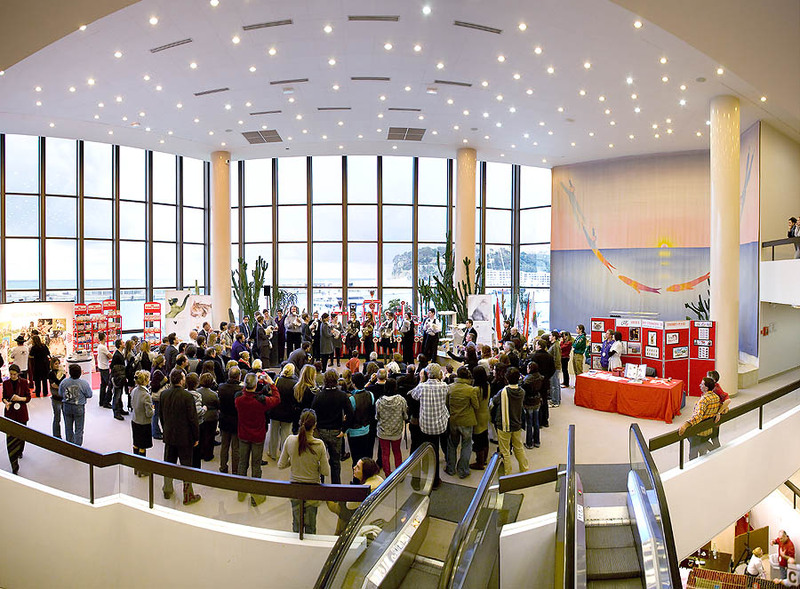 The International Feline Exhibition prizes awarding at the Auditorium Rainier III in Monte Carlo, in presence of H.R.H. the Princess of Hanover, and of Mrs. Martine Woolf, President of the Association Féline de Monaco. 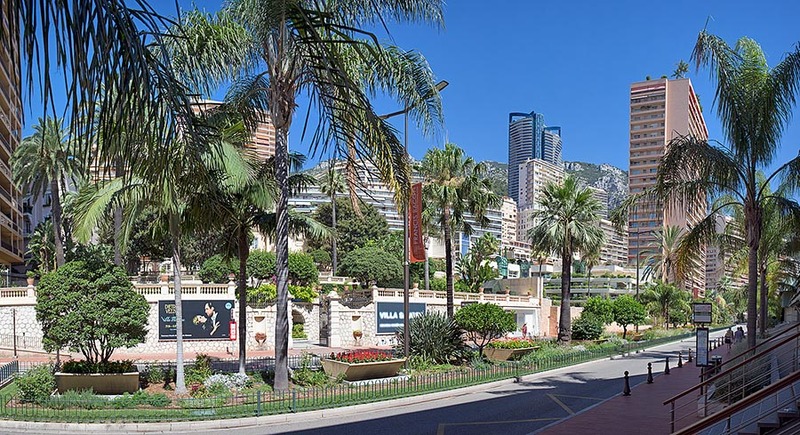 “International Bouquets’ Contest”, and “Reveries on the Gardens”, organized on the Casino Terraces of Monte Carlo by the Garden Club of Monaco. 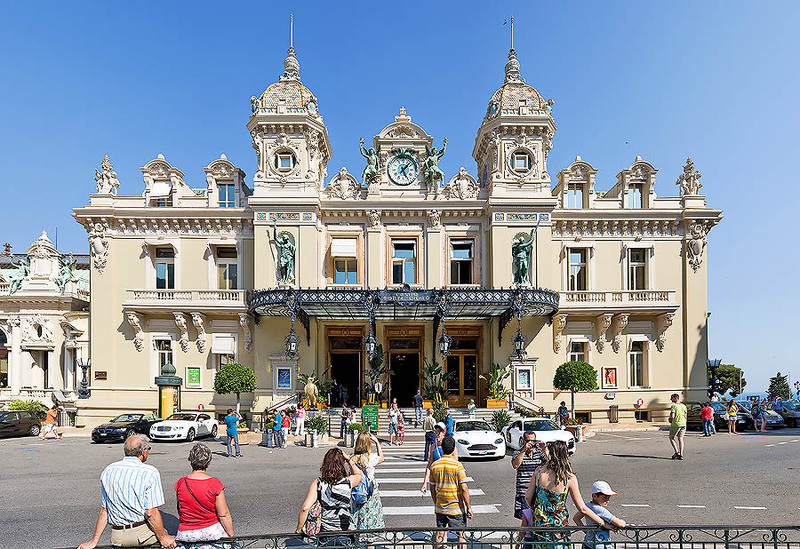 The Monte Carlo Casino entrance, lighted by the sun only in summer, is one of the most photographed sites of the Principality. 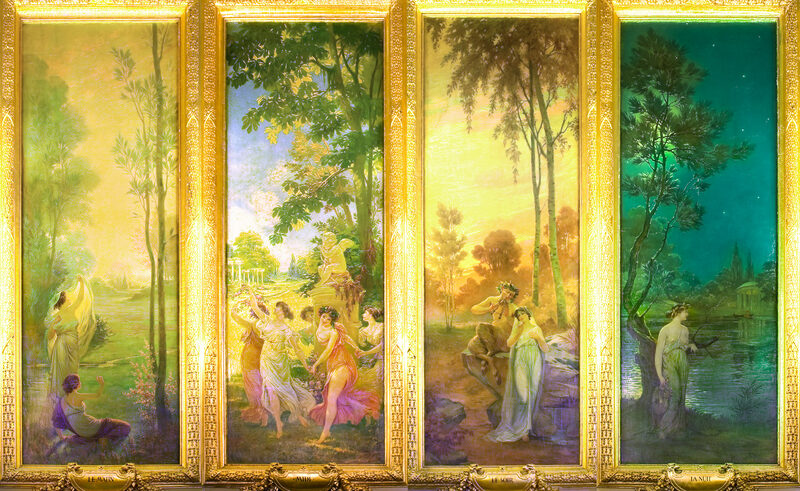 The frescoes by Armand Ségaud in the room François Médecin of the Casino of Monte Carlo show the four parts of the day: morning, noon, evening and night. 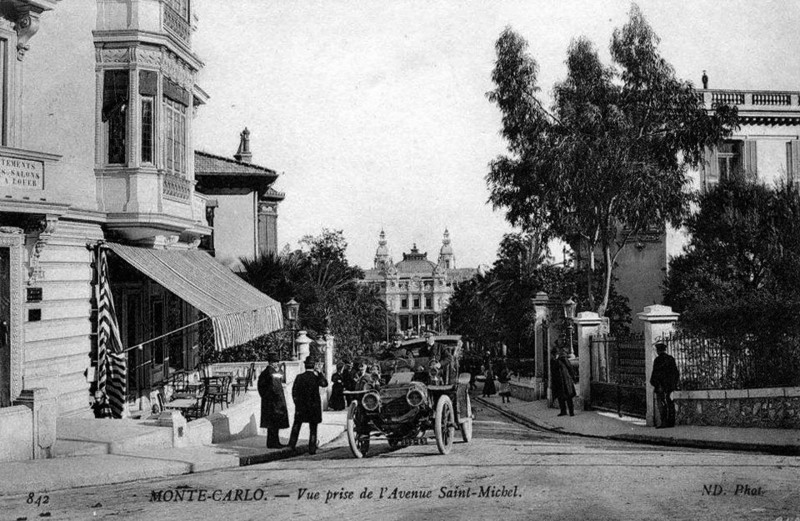 The Monte Carlo Opéra Princes’ entrance, the Terraces of the Casino, and the Port Hercule, seen from the Grill terrace of the Hôtel de Paris. 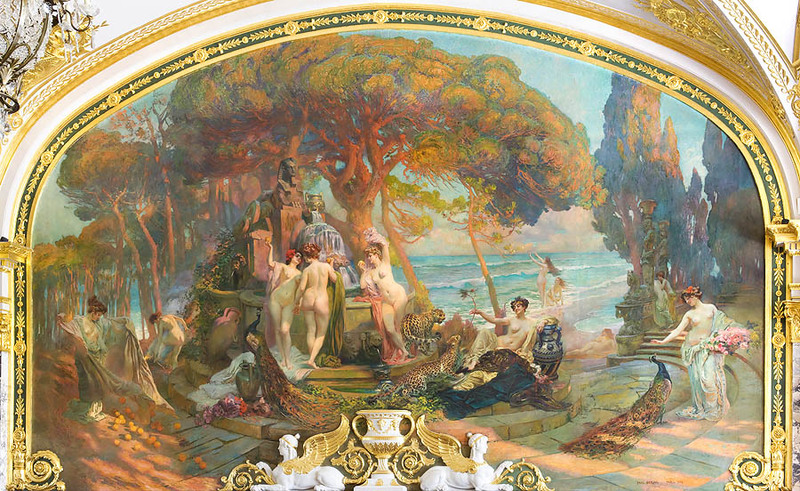 Belle Époque decoration and “Allegory of Dance”, by Henri Cordier, near the Princes’ entrance to the Opera of Monte Carlo. 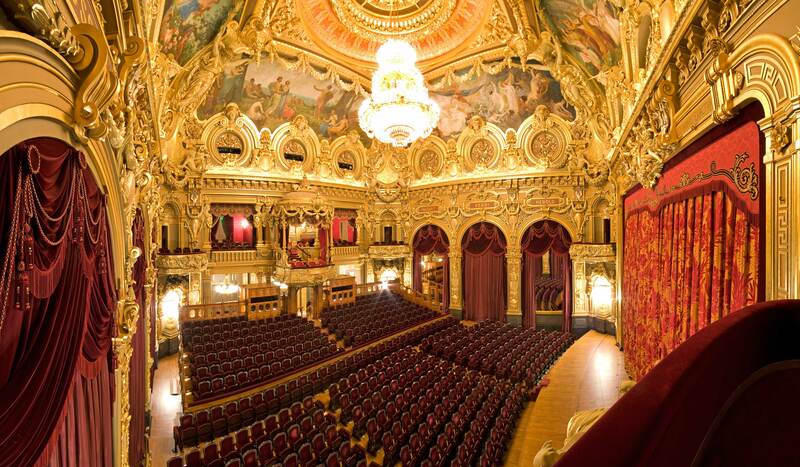 The Monte-Carlo Opera Salle Garnier, built in 8 months only by 400 workmen, operating by turns, day and night, is, since 1879, the seat of prestigious performances. 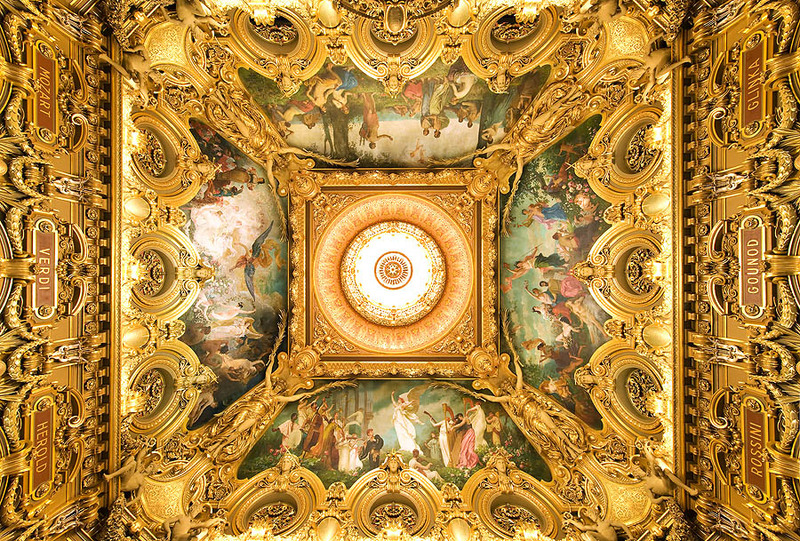 Four big statues of the “Renommée”, by Jules Thomas decorate the walls of the Salle Garnier in the Opera of Monte Carlo. 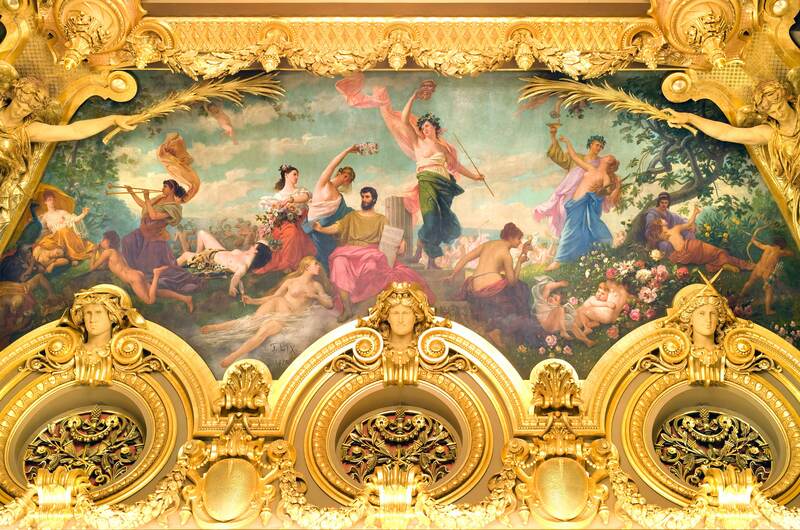 Fresco “The Music”, by Boulanger, in Salle Garnier, over the stage of the Opera of Monte Carlo. 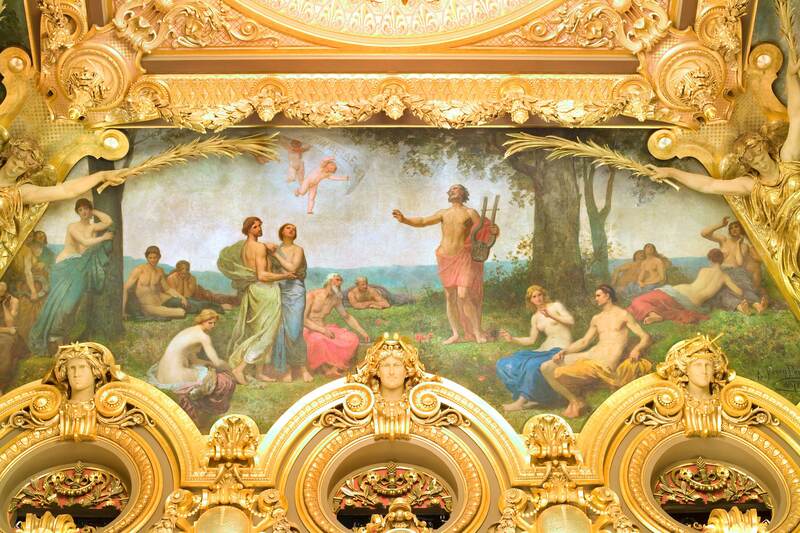 Fresco “The Singing and the Eloquence” by Feyin Perrin, over the Princes’ loge, in Salle Garnier in the Opera of Monte Carlo. Fresco “The Comedy”, by Lix, on a wall of Salle Garnier in the Opera of Monte Carlo. 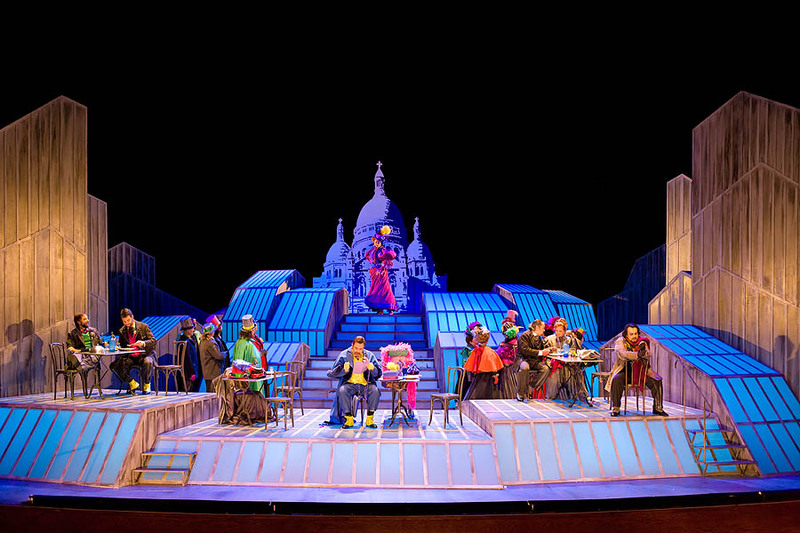 Monte Carlo Opéra: representation of “Falstaff”, with music by Giuseppe Verdi. 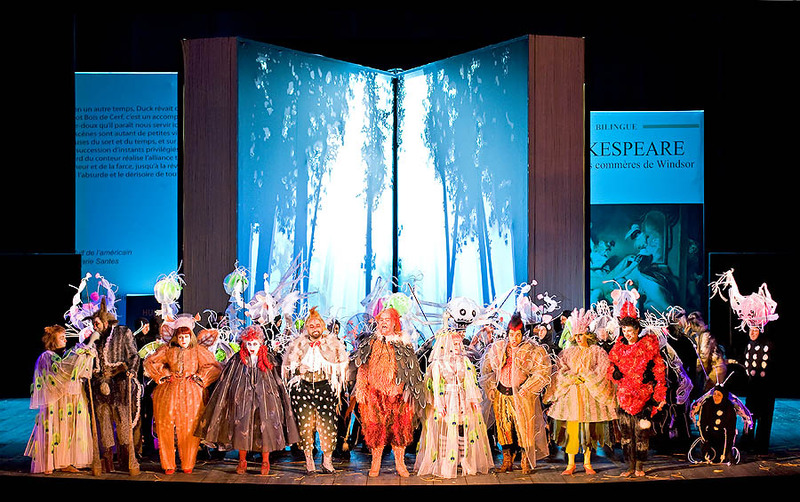 The libretto, by Arrigo Boito, is drawn from “The merry Wives of Windsor” by Shakespeare and, partly, from “Henry IV” – Orchestra conducted by Gianluigi Gelmetti – Productor: Jean-Louis Grinda – Scenarist: Rudy Sabounghi – Monte Carlo Philarmonic Orchestra. Sir John Falstaff lives by his own wits at the Garter Inn. 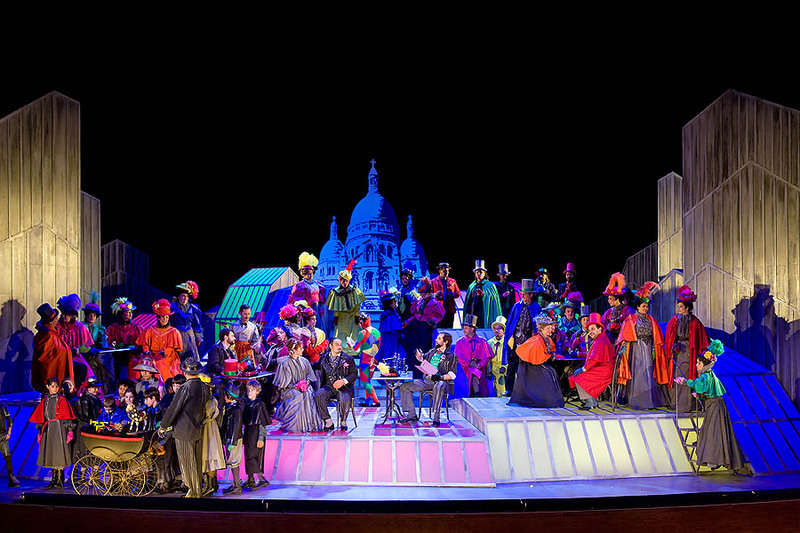 Once a famous Don Juan, he does not hesitate in seducing the rich ladies of Windsor for filling up his belly, and, with bad grace, orders his servants, Bardolph and Pistol to carry two love letters, identical but the addressee’s name, to Meg Page (Annunziata Vestri) and Alice Ford (Aga Mikolaj), on the right of the stage, who are friends and do the washing with Quickly (Mariana Pentcheva) and Nanette (Valérie Condoluci), daughter of the Ford’s. These last two, amused and annoyed at the same time, decide to give the scoundrel a lesson. 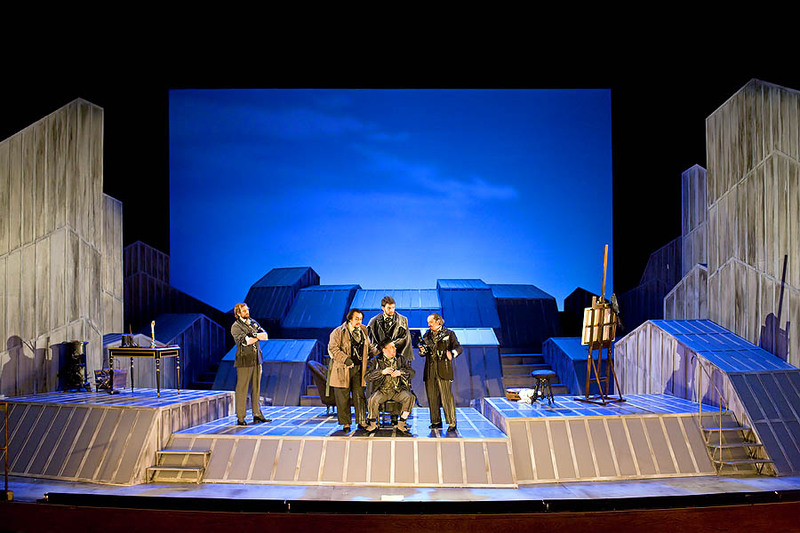 Also the men, from left, Dr. Cajus (Enrico Facini), Mr. Ford (Fabio Capitanucci), Bardolph (Rodolphe Briant) and Pistol (Wojtek Smilak), decide to avenge themselves upon him. 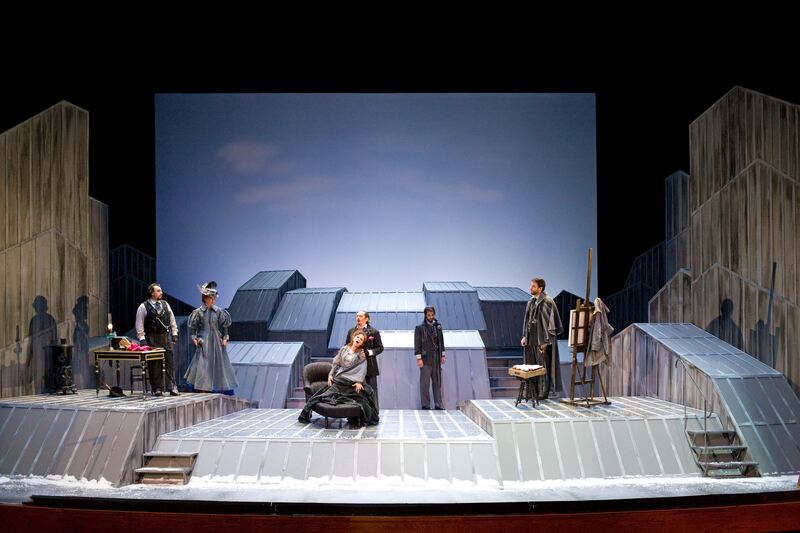 The first had been robbed by Falstaff, and the second has just learnt by the last two, badly dismissed, that their master has written an ardent letter to his lady. On the background, the merry wives continue washing while on the right, Fenton (Florian Laconi), Nannetta’s sweetheart, enters the stage. 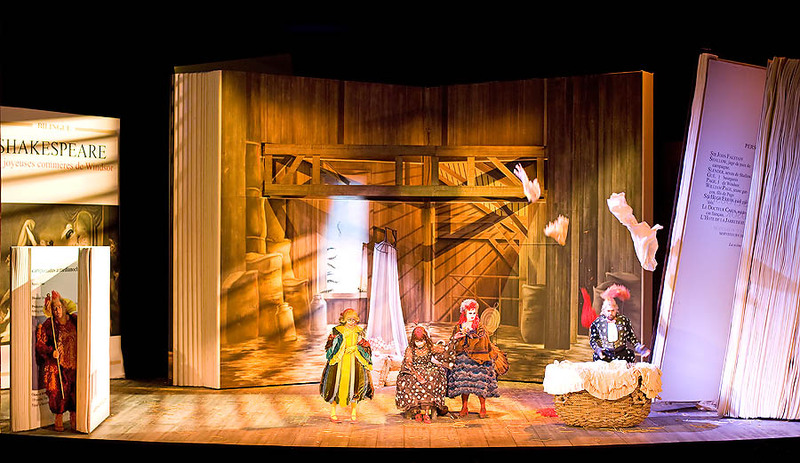 At Garter Inn, Sir John Falstaff (Bryn Terfel) sees, at first, Quickly, who gives him a message from Alice, that she waits for him, at home, from two to three o’clock, when her husband is out. It is a trap laid by the merry wives for jeering him. Then, Mr. Ford (Fabio Capitanucci), comes in, introducing himself under the false name of Master Brook, for acting the men’s revenge. 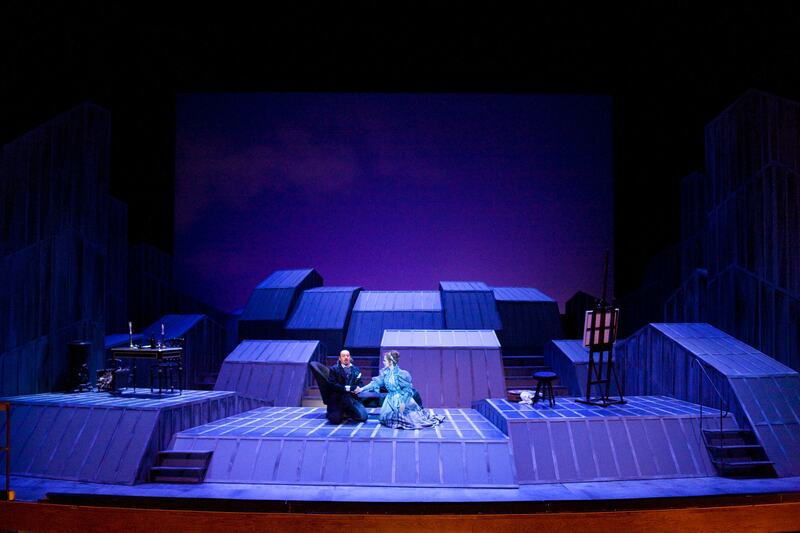 He tells him that he is fond of Alice, but that he is unable to seduce her, as she is a pattern of faithfulness. 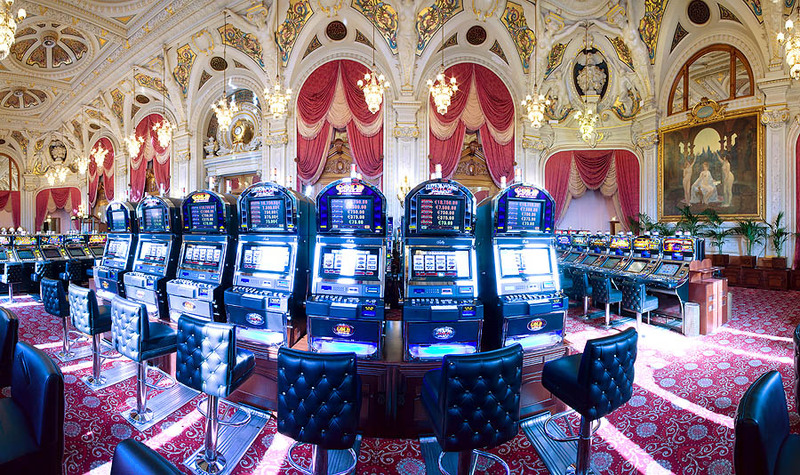 If, in exchange of a purse of silver as a bait, Falstaff will be able to scratch her virtue, then he will find the way smoothed. Falstaff accepts his proposal with a handshake, and while going to dress for the love meeting, he tells the benefactor that he has already received an invitation about it by Mrs. Ford, between two and three o’clock, when her husband is not there. 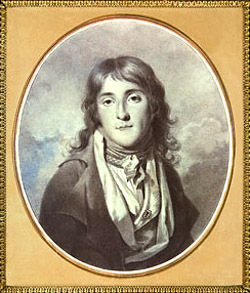 It is unnecessary to say that Mr. Ford, unaware of the plot made by the ladies, is at first prey of despair and then of anger. They part cheerfully, but he is impatient to discover at home the adultery and cut the throat of the culprit. 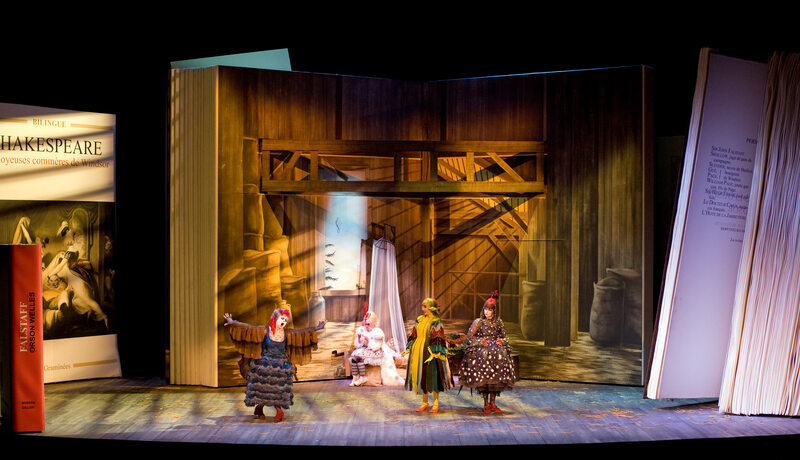 At the Ford’s in the mean time, the wives receive Quickly (Mariana Pentcheva) on the left, who tells them to get ready as Falstaff has been trapped. 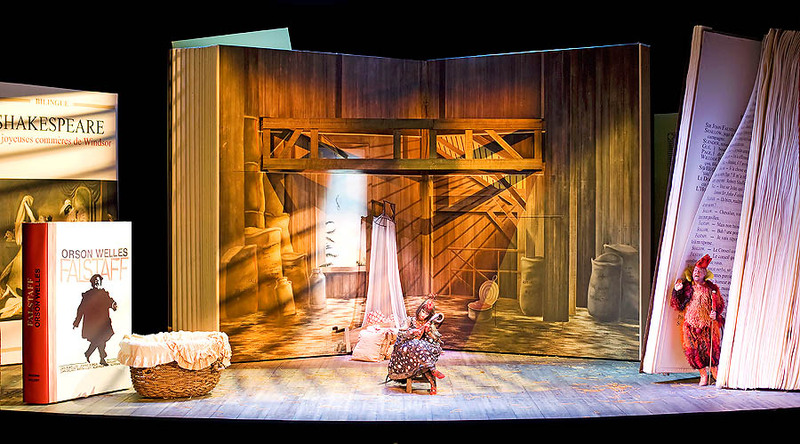 At the centre, Nannetta (Valérie Conoluci), is crying because her father wants her to marry Dr. Cajus, but she is in love with Fenton. The mother, Alice Ford (Aga Mikolaj), on the right, promises her support. 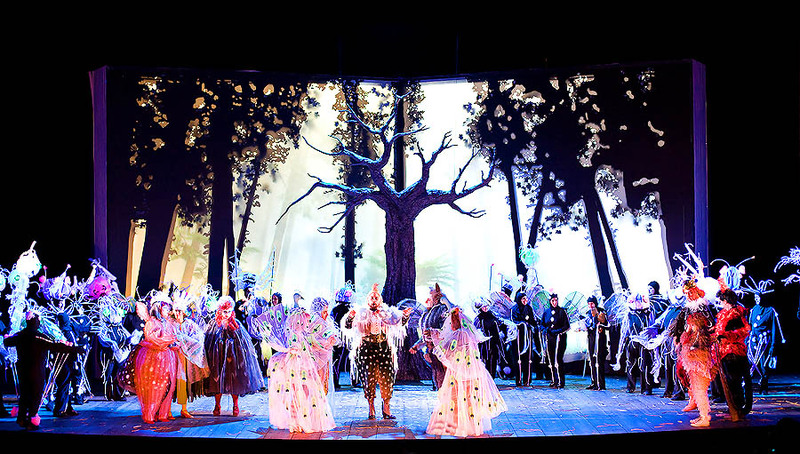 Alice Ford (Aga Mikolaj) awaits, at the centre of the stage, Sir John Falstaff (Bryn Terfel) who is coming out, triumphant, from the story book. But his courting is short-lasting, as the wives come, frightened, with the news that Mr. Ford is arriving with a punitive team composed by Dr. Cajus, Bardolph, Pistol, Fenton and other neighbours. 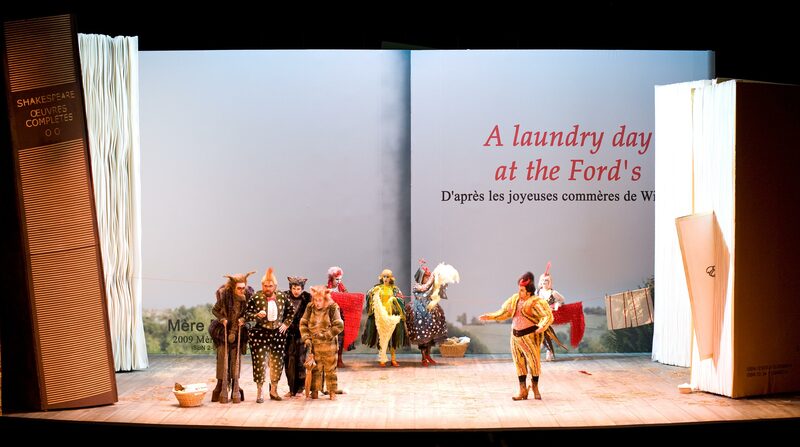 Falstaff (Bryn Terfel) hides behind a screen, while Mr. Ford (Fabio Capitanuccio) looks for him, furious, into the big basket of the dirty linen. 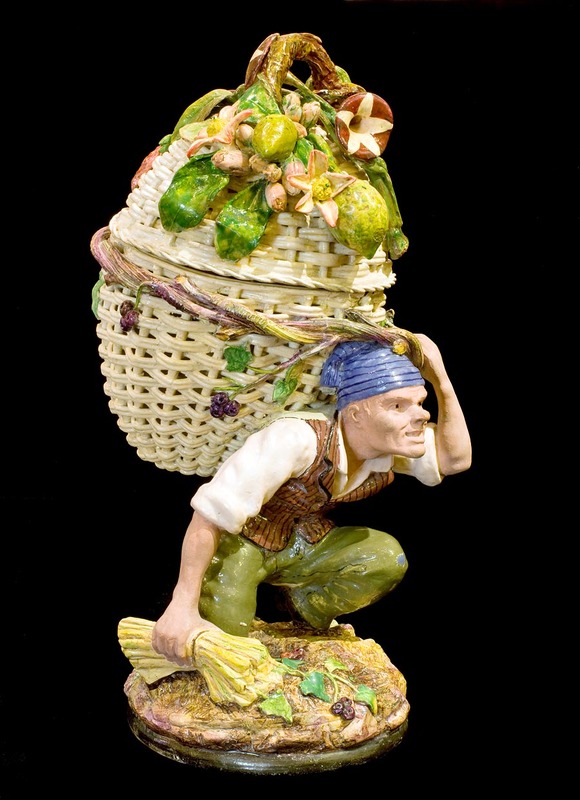 After having, unsuccessfully, turned all the wash upside down, he runs to look for him in the other rooms, while Meg, pretending surprised to see him, hides Falstaff into the basket, which has been already searched, under the stinking linen. 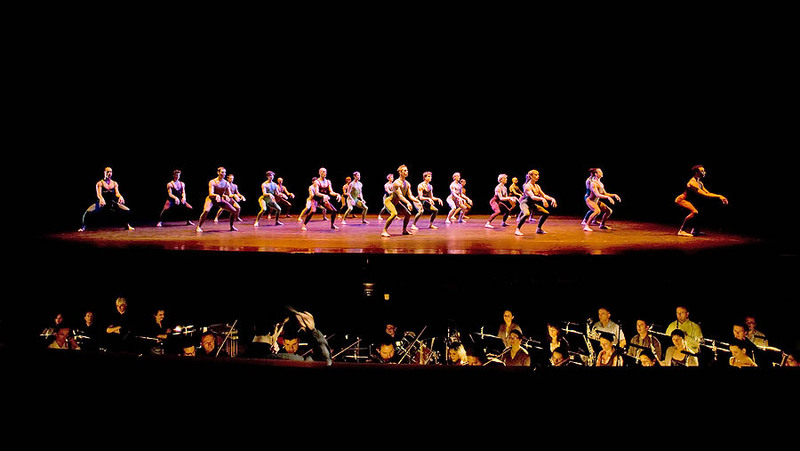 Mr. Ford comes back on the stage with the team. They have searched all the house, and he is not there. He can hide, then, only behind the screen. 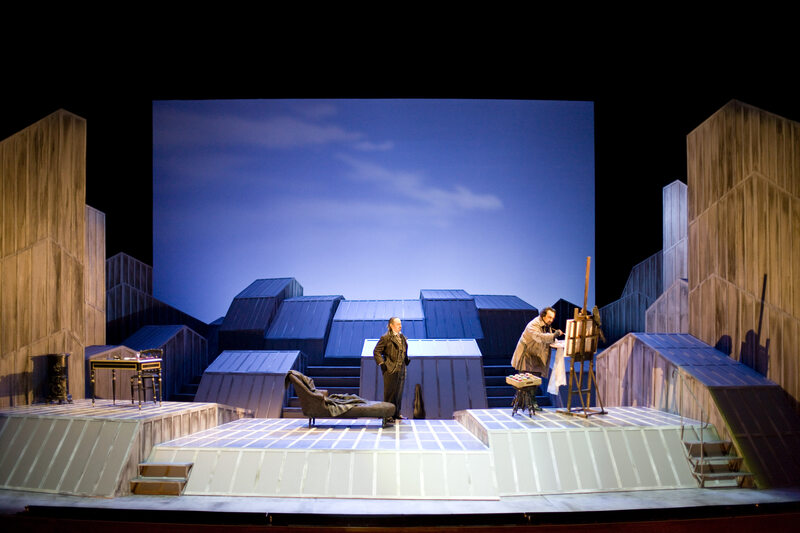 Dr. Cajus opens it, and much to his and the furious father’s surprise, they discover Nannetta (Valérie Condoluci) and Fenton (Florian Laconi), embraced. Profiting by the mess, they had, in fact, withdrawn for kissing. 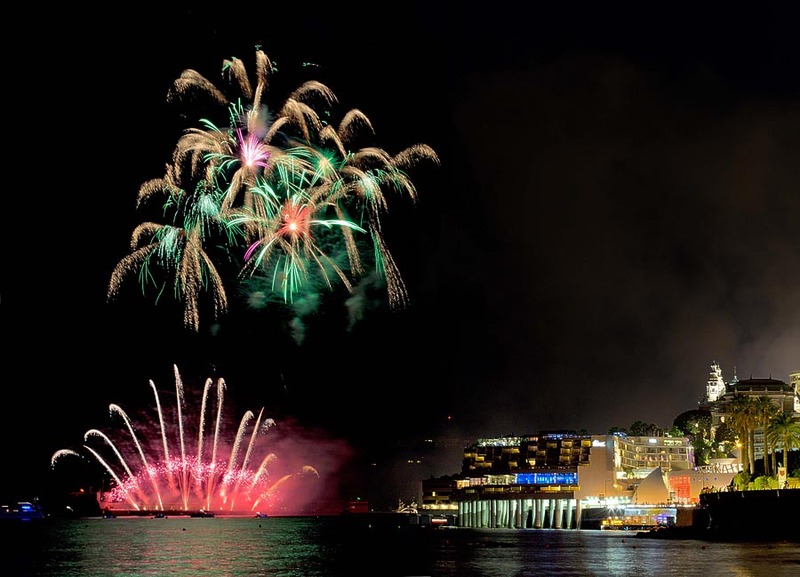 Fenton runs away and the linen basket is thrown into the Thames. 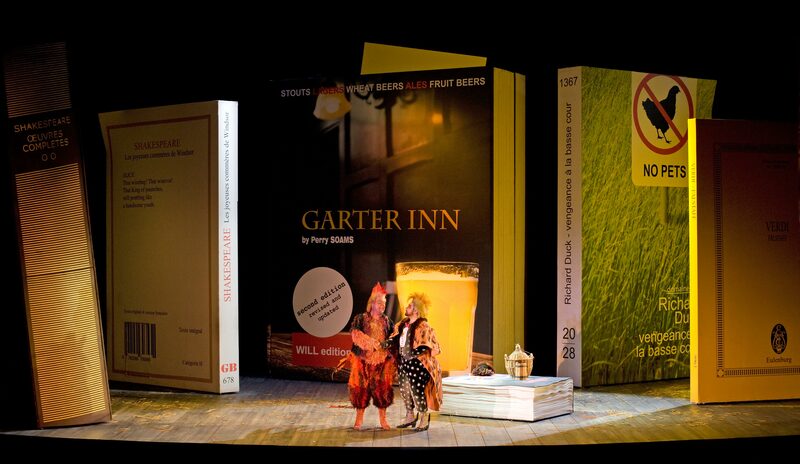 Sir John Falstaff (Bryn Terfel), half-drowned and filthy, still thinks to the scorching misfortune and recovers, drinking, at the inn. 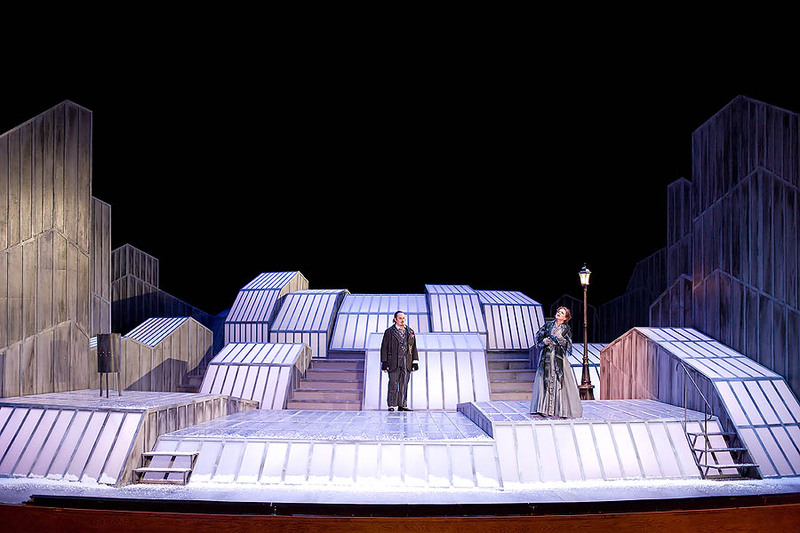 Quickly (Mariana Pentcheva) enters again the stage. In accordance with the wives, she wants to make things worse. She gives him another card from Alice, she wants him to be by midnight in Windsor forest, close to the old oak, disguised as “Black Huntsman”, with a headgear with long horns on top. 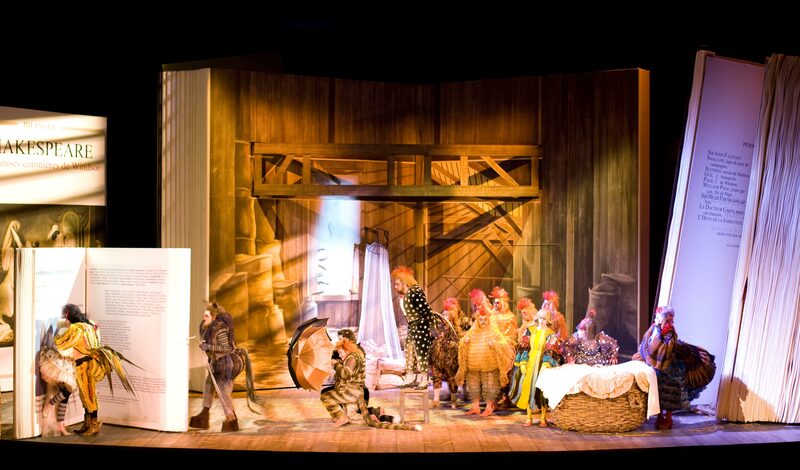 Falstaff (Bryn Terfel) is caught again in the trap. All are aware, of course. 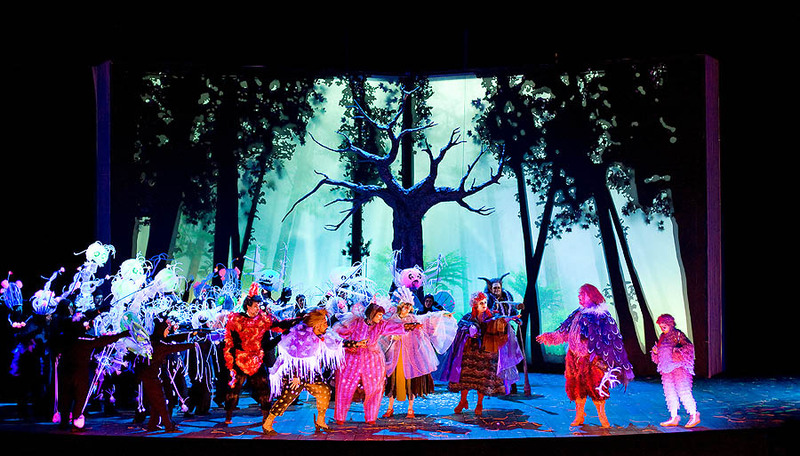 Inspired by a tale, Nannetta will disguise as “Queen of the Fairies”, and the inhabitants of Windsor will dress as sylphs, elves, goblins, devils and vampires. 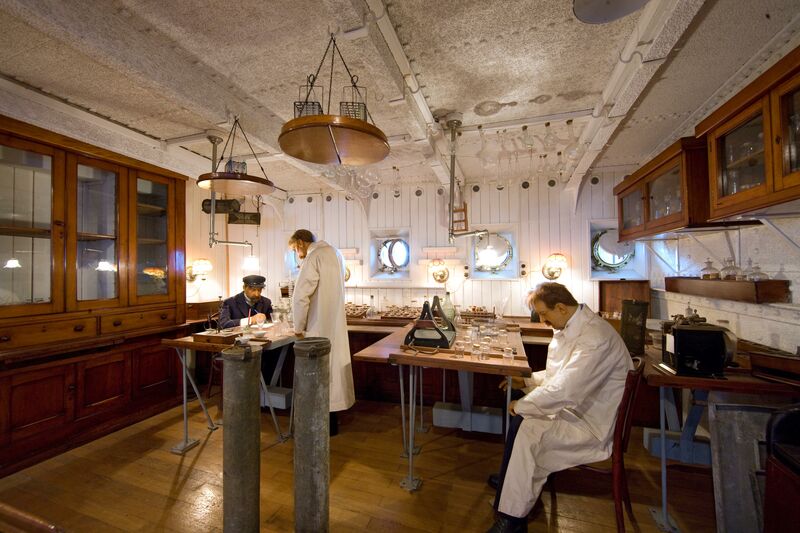 Mr. Ford promises Dr. Cajus that he will profit of the situation for giving him Nannetta, explains him how to disguise, and he will, himself, consecrate their union. But Quickly listens to the conversation and informs her friends. Fenton (Florian Laoni) is the first to get at the great oak by the sunset and Nannetta replies to him, but Alice interrupts them, explaining them how they are to disguise for upsetting her husband’s plans. 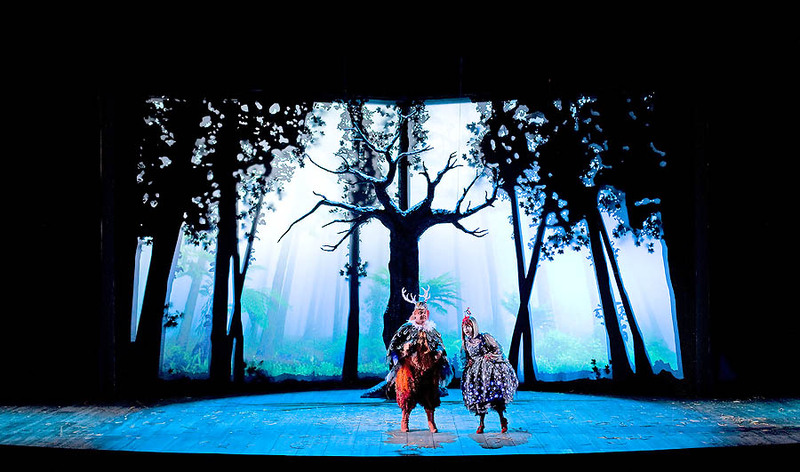 With his great horns on the head and an eagle beak, Falstaff (Bryn Terfel) meets Alice (Aga Mikolaj), but a yell is heard and the spirits come out in the dark of the night. 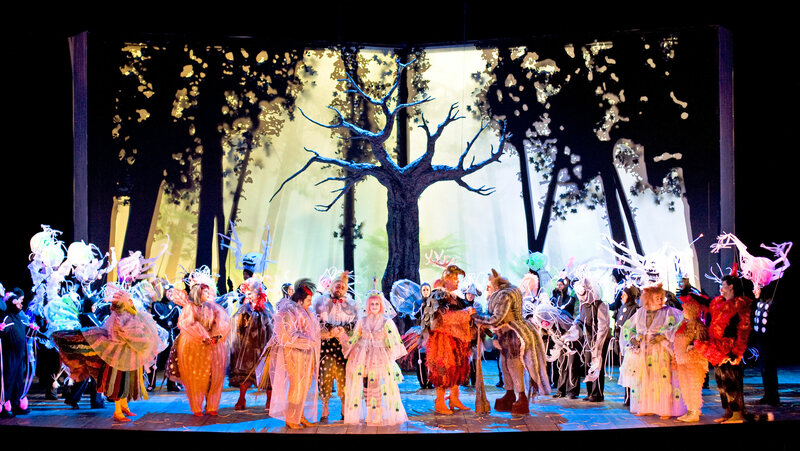 Nannetta (Valérie Condoluci) surrounded by the figurants tunes the song of the Queen of the Fairies. 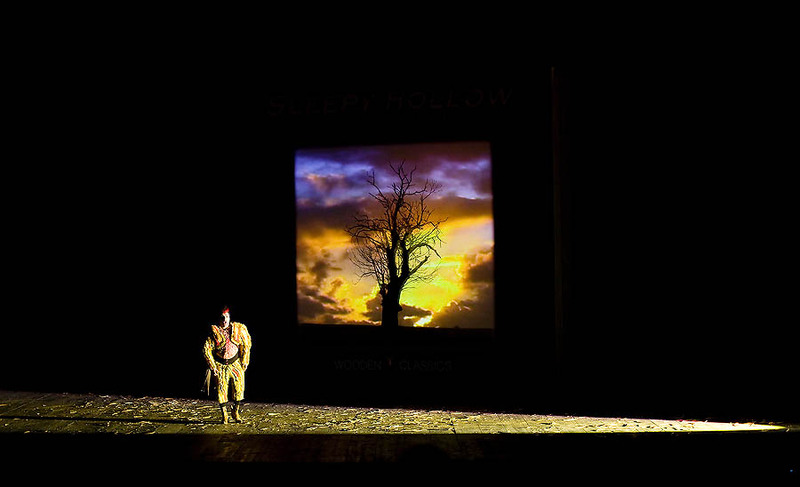 Falstaff, terrified, hides his face on the ground not to see the spirits. And all take advantage of this for stinging him and whipping him with osiers and nettles. Falstaff (Bryn Terfel) repents and begs pardon. One of his torturers loses his hood, and recognizing the servant Bardolph (Rodolphe Briant), Falstaff (Bryn Terfel), discovers the mise en scène. 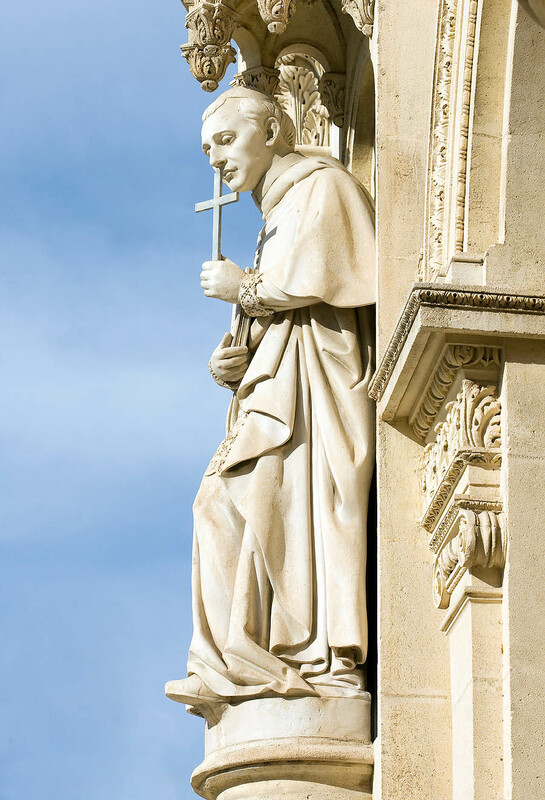 All accuse him and he accepts the punishment and admits his wrongs. Mr. Ford (Fabio Capitanucci) discloses Falstaff his real identity and shouts him “tell me now who is the cuckold”. 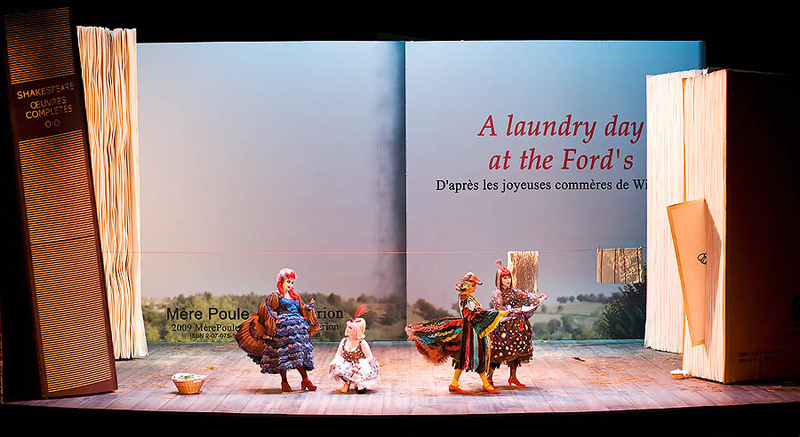 The wives disguise Bardolph (Rodolphe Briant) as a bride, place him, in lieu of Nannetta, close to Dr. Cajus (Enrico Facini), and inform Mr. Ford (Fabio Capitanucci) that there is another couple to marry. 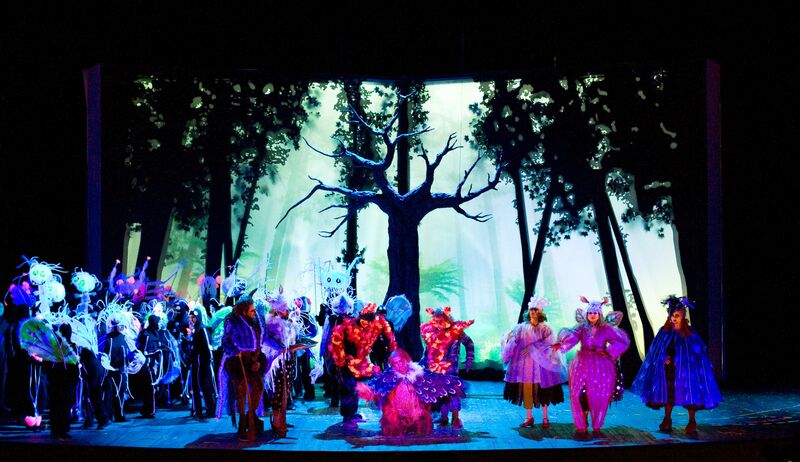 Actually, it’s Nannetta (Valérie Condoluci), hidden by the dress and the veil, and of her Fenton (Florian Laconi). In the darkness of the night, Mr. Ford does not realize the swop, and marries them. The book of the story closes and Falstaff (Bryn Terfel) concludes: “All in the world is a jest”. 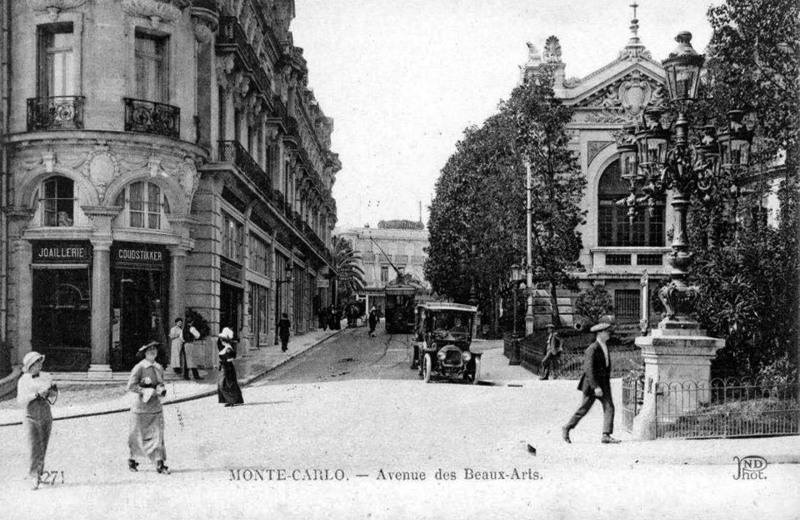 The Monte Carlo Opéra: The Bohème by Giacomo Puccini. 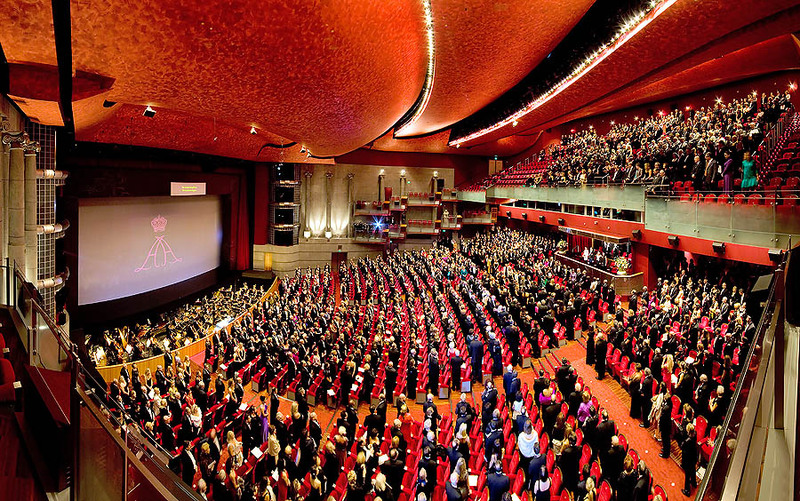 Conductor: Antonio Fogliani – Productor: Jean-Louis Pichon – Stage manager: Alexandre Heyraud – Monte Carlo Philharmonic Orchestra. 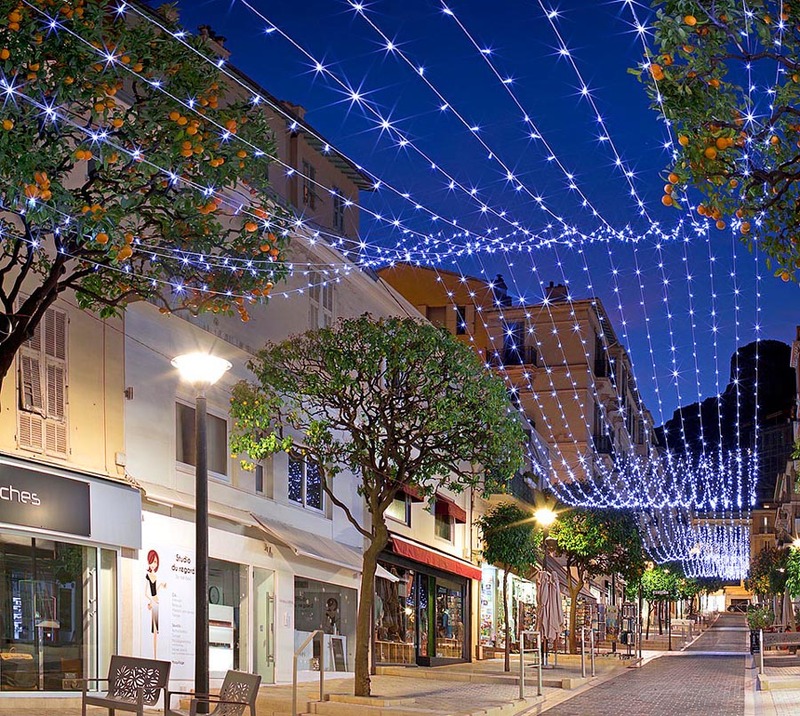 It’s Christmas eve. 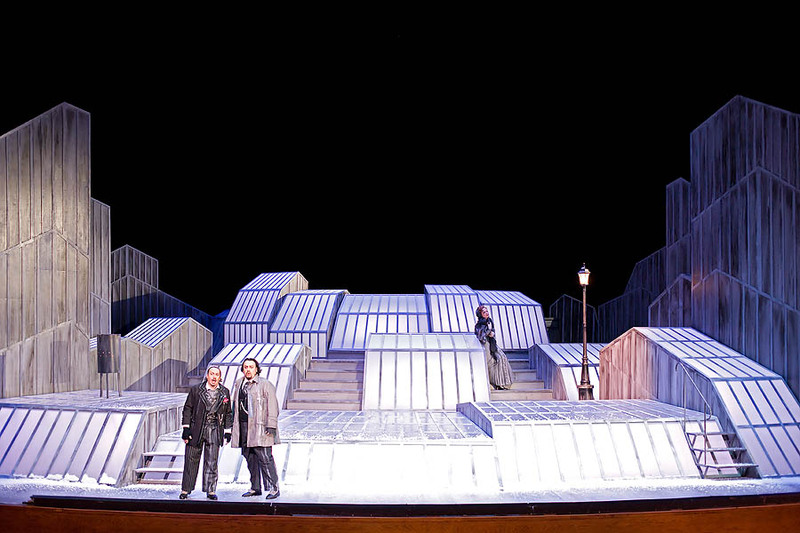 Marcello (George Petan), painter, and Rodolfo (Stefano Secco), poet, are trying to warm up in a poor garret. 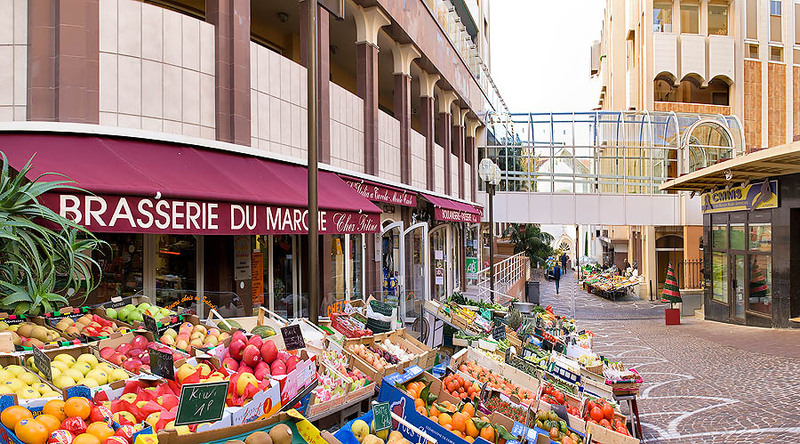 Colline (Gabor Bretz), a friend philosopher, on the left, and Schaunard (Etienne Dupuis), musician, at the centre, with a basket full of food, happy for having gotten some money. The feast is short-lasting, as Benoît (Guy Bonfiglio), the owner, sitting at the centre, gets in claiming for the payment of the rental. 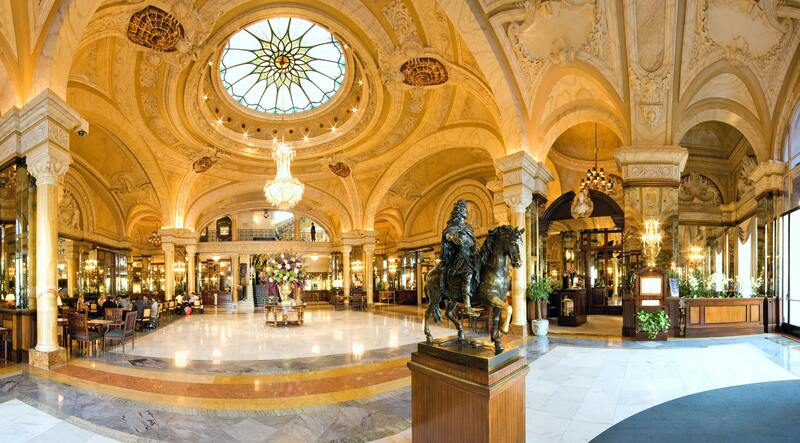 The friends oblige him to drink, and, once drunk, he confesses of having betrayed his wife. 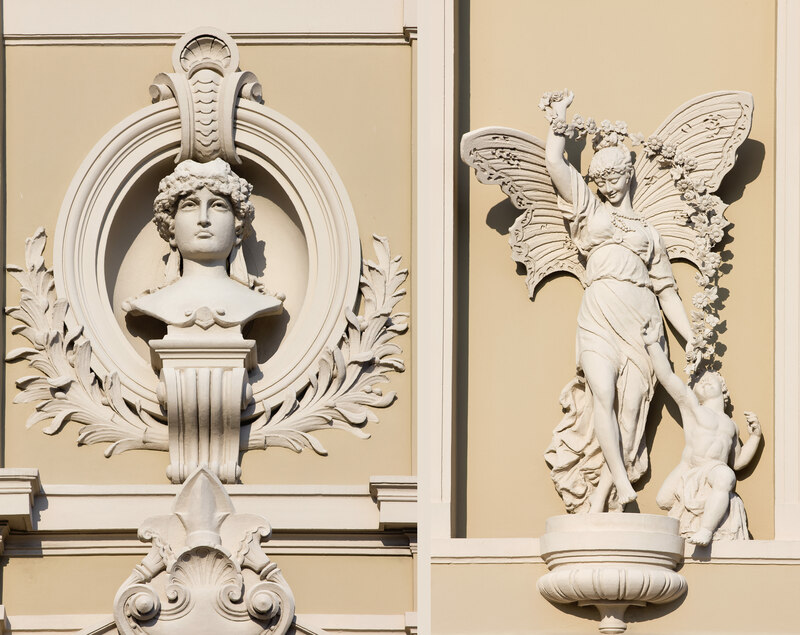 This is a good pretext the tenants were looking for, and, with indignation, show him the door . 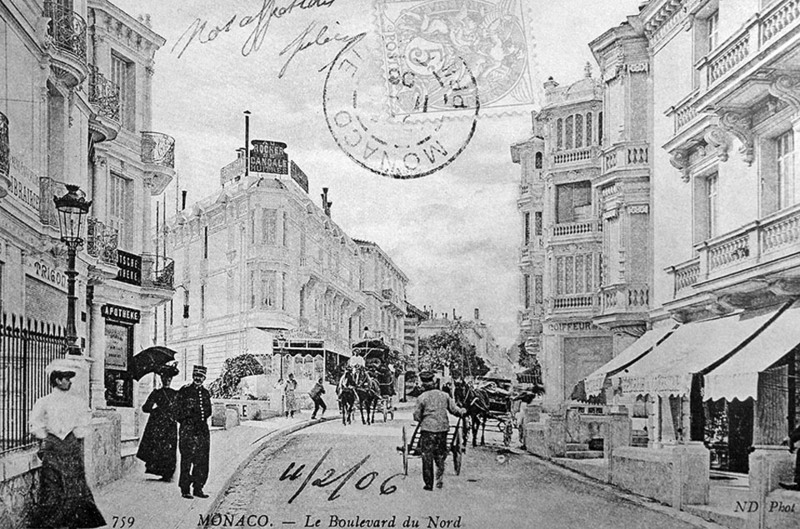 The friends go out bound to the Café Momus, but Rodolfo (Stefano Secco) remains at home as he has to complete an article. Alone, he hears somebody knocking at the door. It is the neighbour, Mimi’ (Inva Mula), looking for a candle to light up the lamp which is out. Then, the girl does not feel well, this is the first symptom of the TB which will carry her to the grave . Raising herself for going back home, she realizes of having lost the key which they look for, in the darkness, on the ground, as a gust of wind has extinguished both lights. Rodolfo (Stefano Secco), finds the key and hides it in his pocket. When his hand meets the one of Mimi’ (Inva Mula), the poet discloses his love singing “Che gelida manina” (What a chilly small hand), and asks her to tell him about herself . Mimi’ (Inva Mula) tells him she is an embroider. 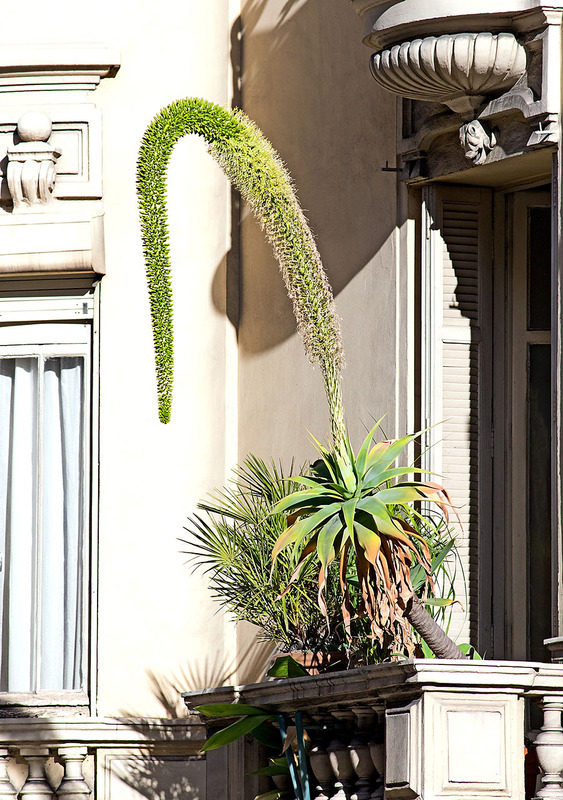 She lives by herself, creating imitation flowers. 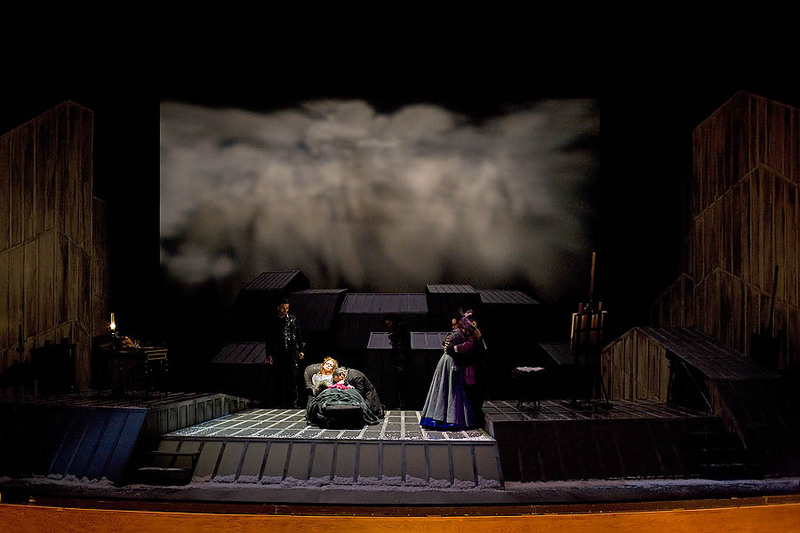 The act ends with a love duet “O soave fanciulla” (Oh, sweet girl) . The two of them join the friends at Café Mimus. Mimi’ (Inva Mula) has found the love and is full of happiness. Rodolfo (Stefano Secco) has just given her, as a present, a red hat . 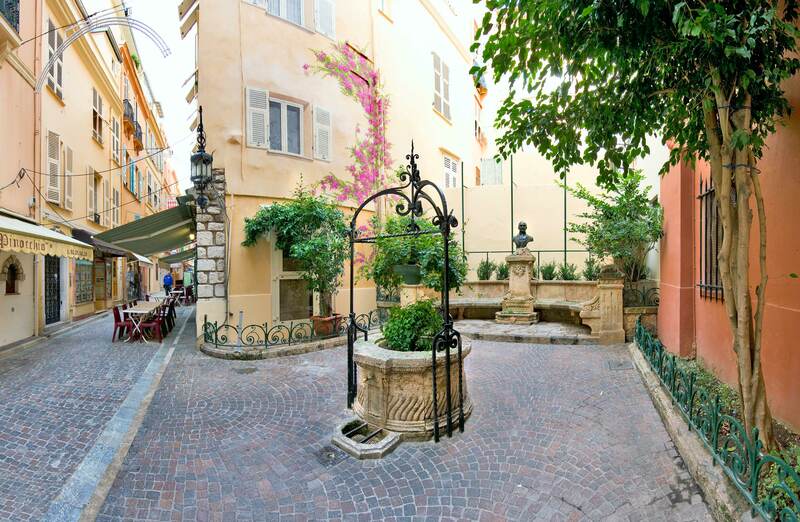 Important meeting place of the city, the Café Mimus is very much popular. 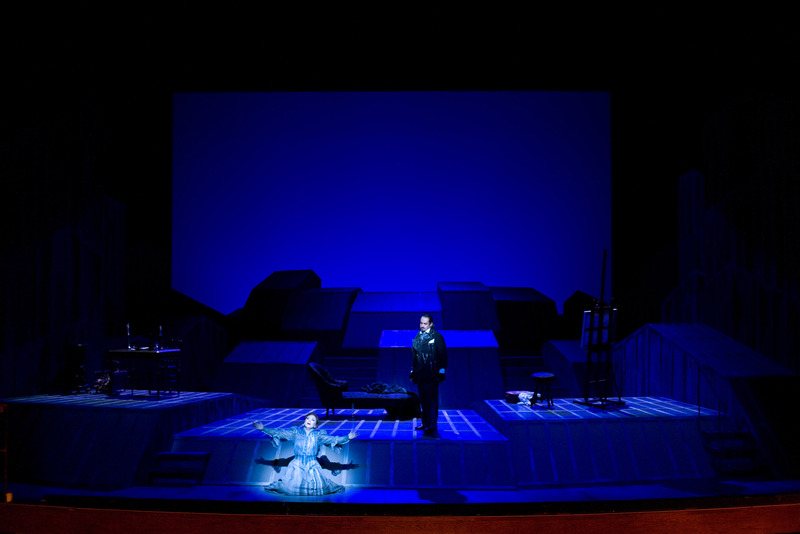 Rodolfo (Stefano Secco) introduces Mimi’ (Inva Mula) to his friends . Then comes the fascinating Musetta (Karen Vourc’h), on the upper part of the stage. 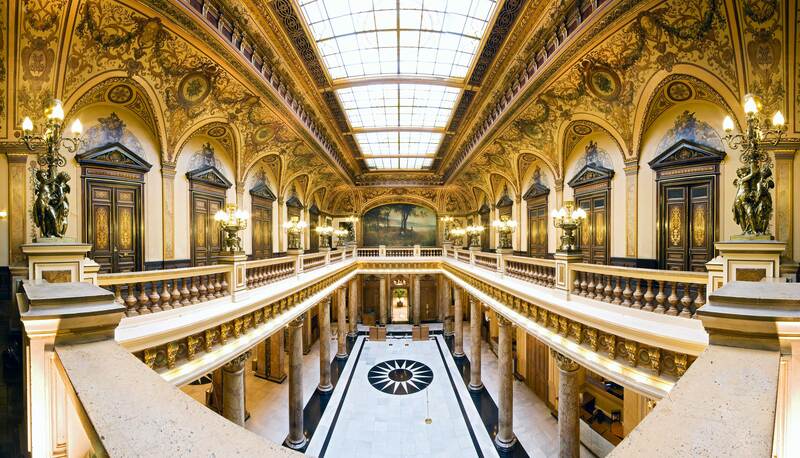 She is the mistress of the rich state councillor, Alcidoro (Jean-François Vinciguerra), sitting at the centre . 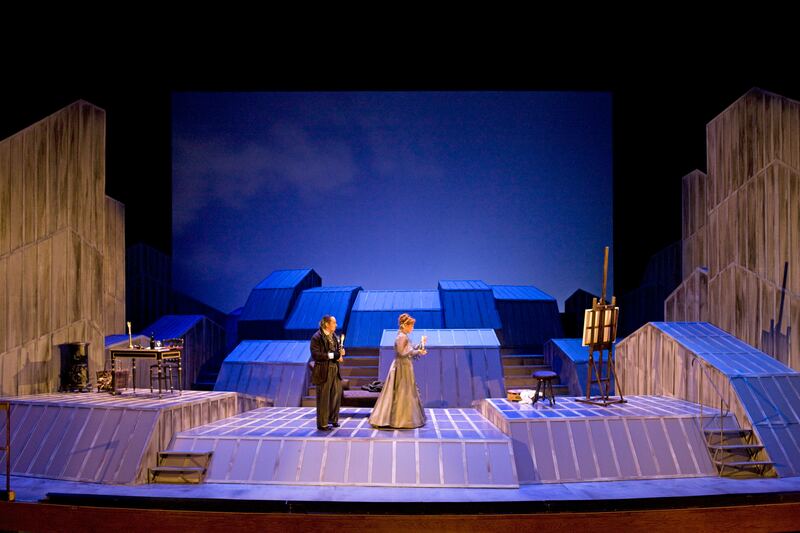 Old flame of the painter Marcello (George Petan), Musetta (Karen Vourc’h) does her best to draw his attention. She intones a provoking song “Quando me’n vo” (When I go) and asks him to take her off, with an excuse, a bootee, showing, scandalously, her ankle. The two old lovers run away together, leaving Alcindoro (Jean-François Vinciguerra) alone and to pay the bill . 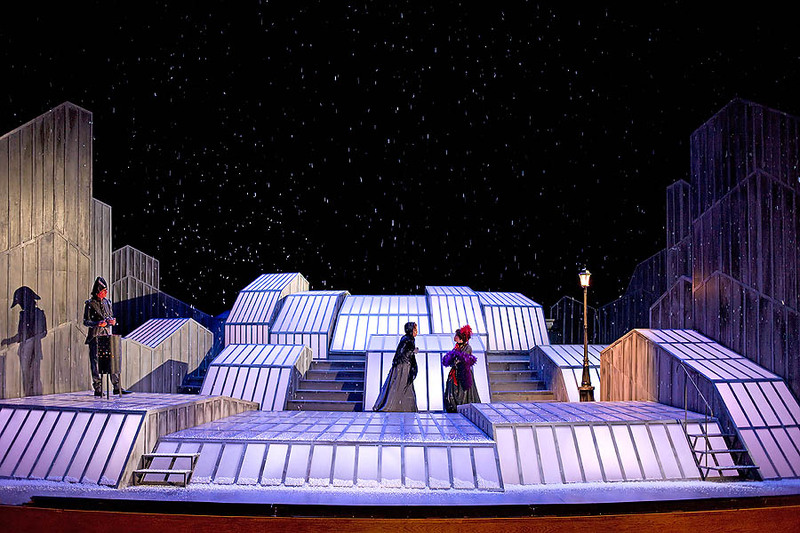 It snows a lot at the Barriera d’Enfer, where Mimi’ (Inva Mula), now seriously ill, looks for Marcello, who works in a public house, to tell him that Rodolfo has abandoned her. 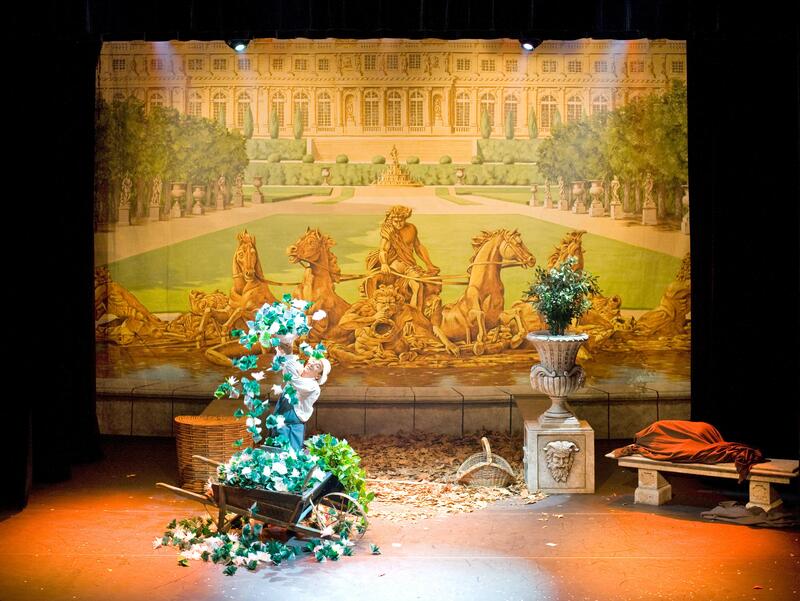 “O buon Marcello, aiuto!” (Oh, good Marcello, help!) . 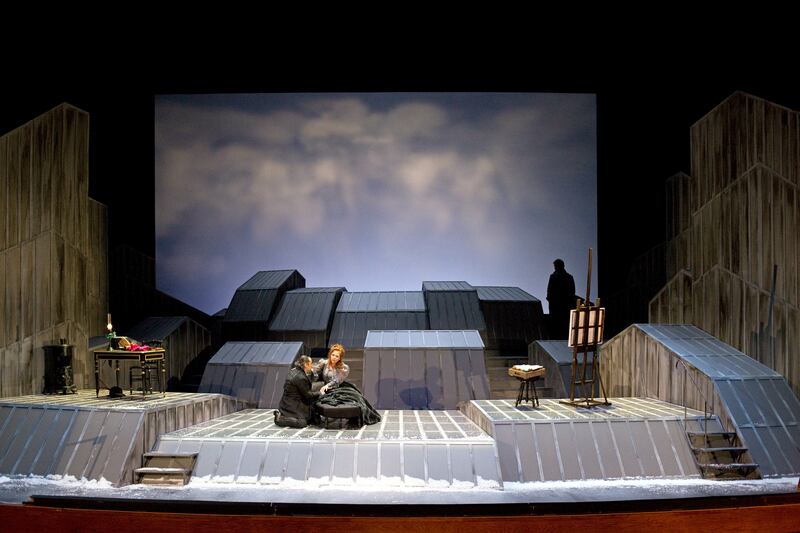 Marcello (George Petan) explains her that Rodolfo (Stefano Secco) is in the public house, sleeping. Then, this one wakes up and gets out looking for his friend. Mimi’ (Inva Mula) hides and listens to his conversation with Marcello. She learns that he has left her just to allow her to find another man, wealthier, who can better lodge her and save from tubercolosis . Mimi’ (Inva Mula) reappears on the stage and meets Rodolfo (Stefano Secco). They would wish to separate friendly “Donde lieta usci’” (From where she came happily out), but the memory of the nice hours spent together, compel them to postpone the separation till the next spring, the flowers season. 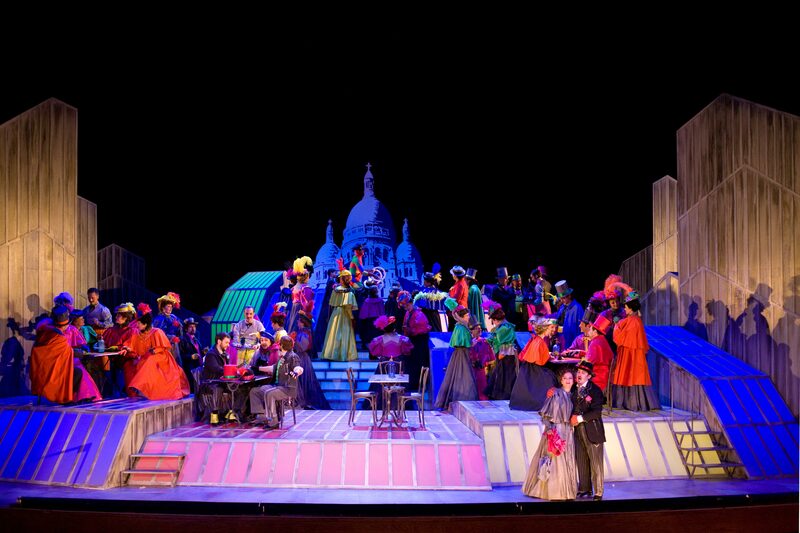 In the mean time, Marcello and Musetta part after a violent quarrel . 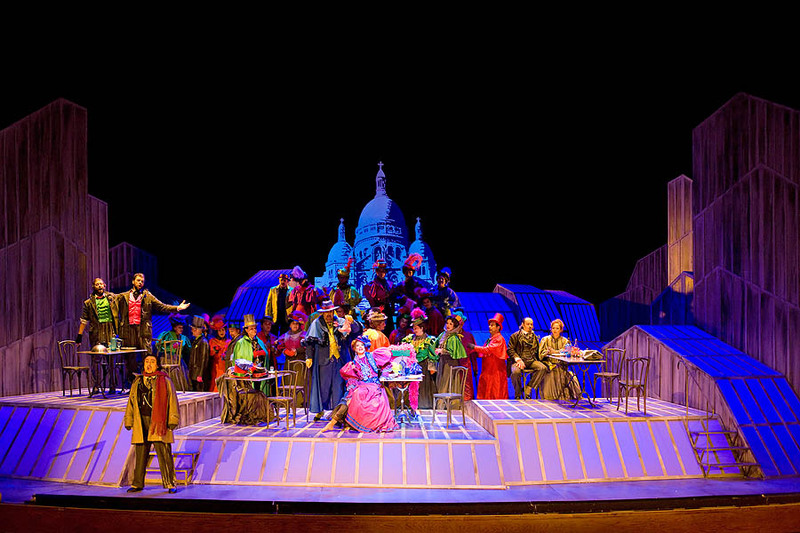 The protagonists, from left, Marcello (George Petan), Musetta (Karen Vourc’h), Rodolfo (Stefano Secco), Colline (Gabor Bretz) and Schaunard (Etienne Dupuis) meet in the garret with Mimi’ (Inva Mula). This one has just left a rich protector and has been picked up, on the street, wandering and weak, by Musetta . 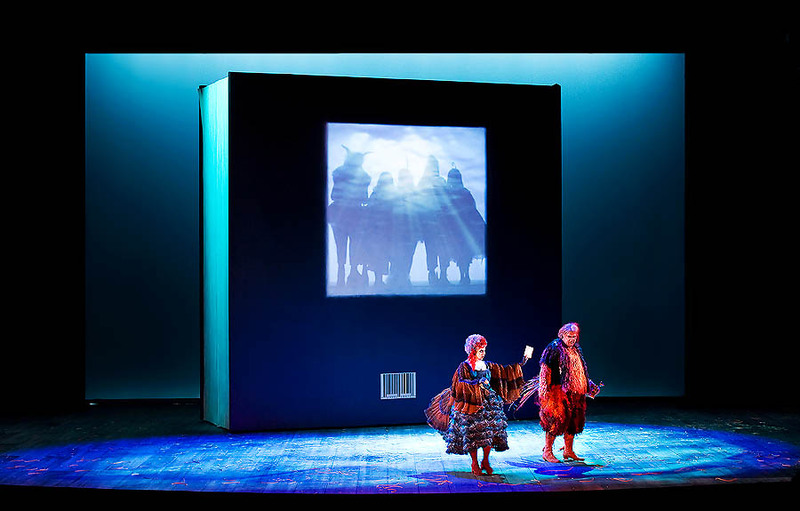 Understanding that the end is approaching, the friends leave alone Mimi’ (Inva Mula) and Rodolfo (Stefano Secco) who recall in the duet “Sono andati?” (Did they go? ), their first encounter and the happy moments. 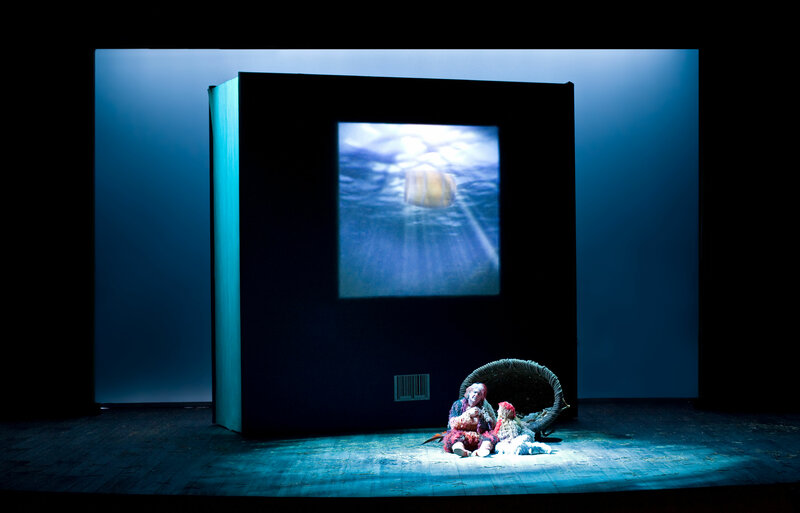 And the red hat Rodolfo has kept as a memory after their separation, gives a moment of joy to Mimi’ . Mimi’ (Inva Mula) passes away quietly, as if sleeping, surrounded by the friends, who had renounced to a pair of ear-rings and to a cloak for buying some medicines and for calling a physician . Monte Carlo: the Hotel Hermitage, the Monégasque Institute of Sport Medicine and Surgery and the Cardiac-Thoracic Centre. 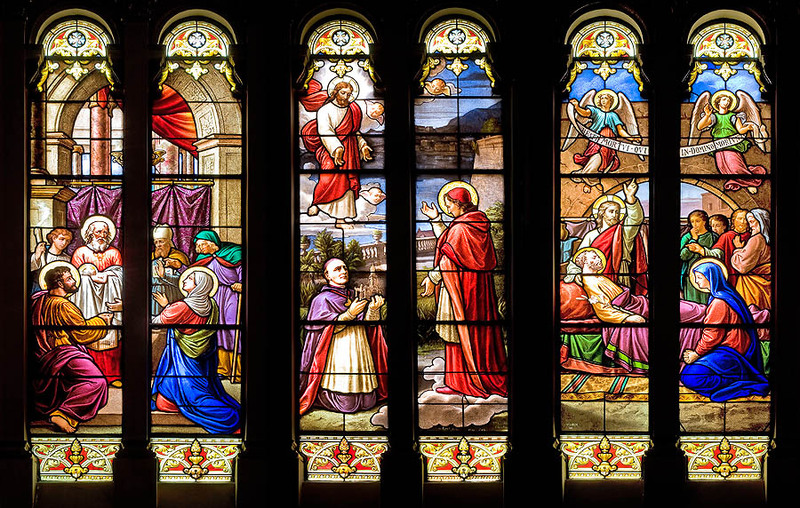 Monte Carlo: stained glass windows in the apse of Saint Charles church showing the Presentation of Jesus at the Temple of Jerusalem, the offering of the church to Saint Charles by Msgr. 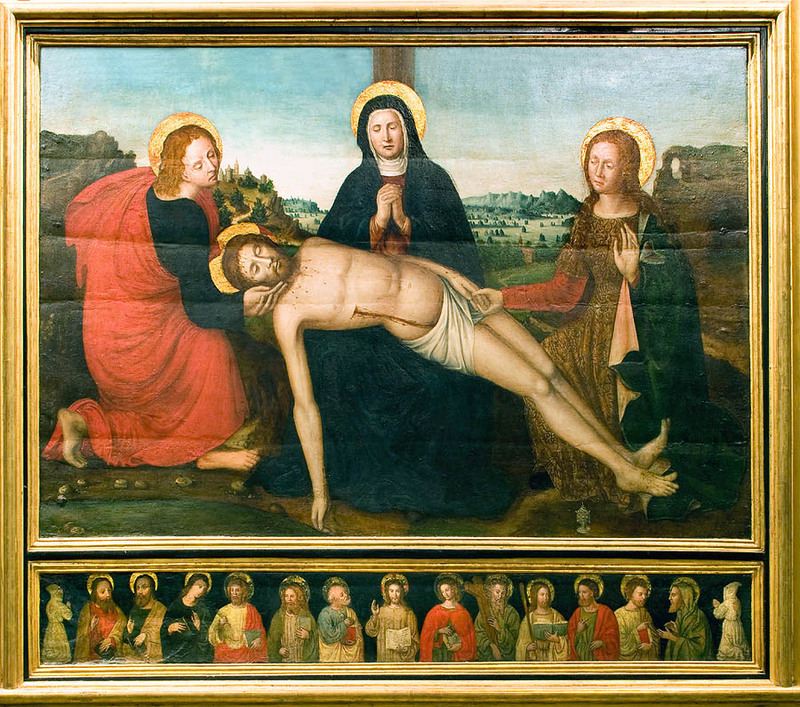 Thevret, and the demise of Saint Joseph. 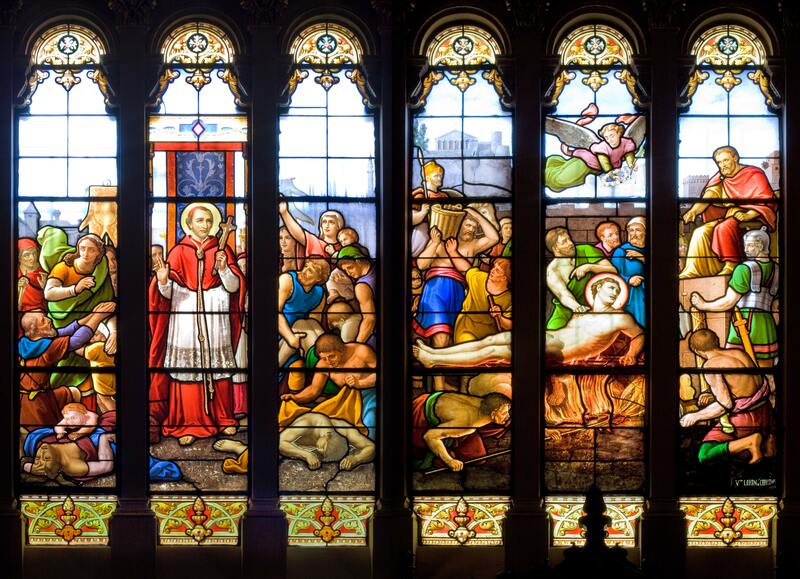 The stained glass windows of Saint Charles church in Monte Carlo, have been done in 1883-1884 by the Maison Lorin of Chartres and have received several recognitions. Here they show Saint Charles Borromoeo during the plague of Milan and Saint Lawrence Martyrdom on the gridiron. 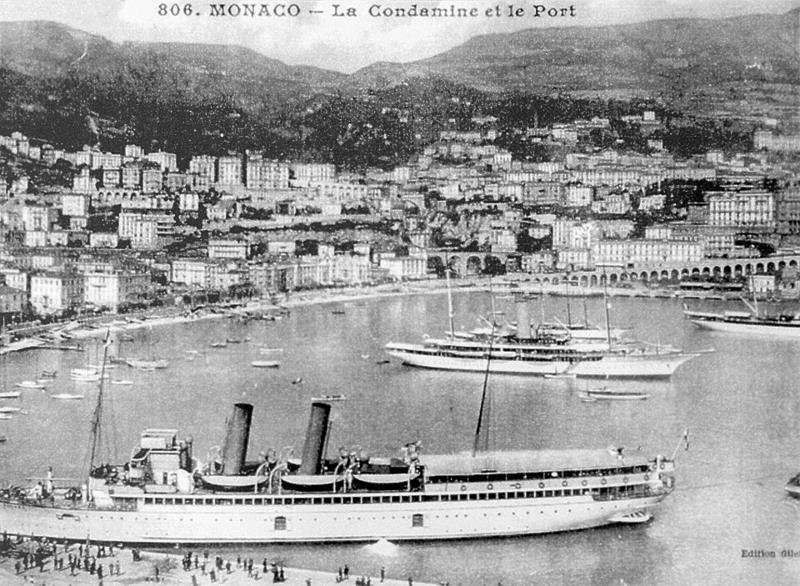 Monte Carlo: the Larvotto sea promenade, the Fairmont Hôtel with the Casino and the Nibox, and a cruise vessel alongside the floating berth of the Port Hercule. 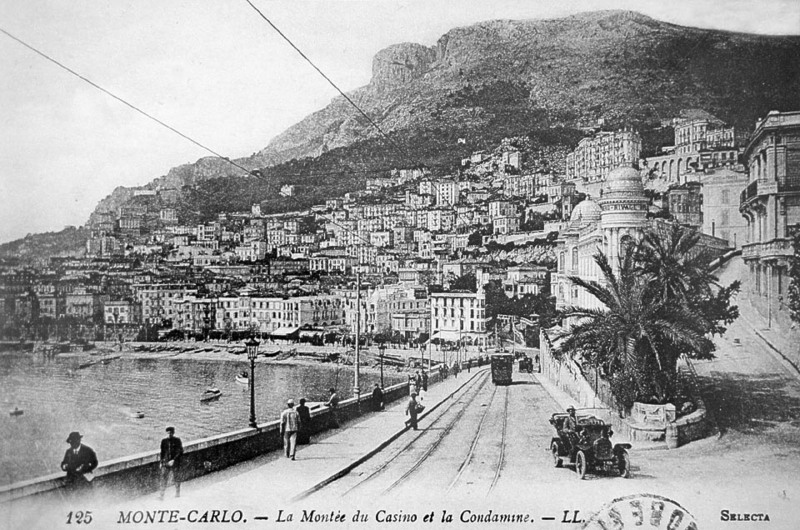 The Larvotto seaside promenade. Some tourists are comparing the size of their feet with those impressed on the ground of the “Champions Promenade”. 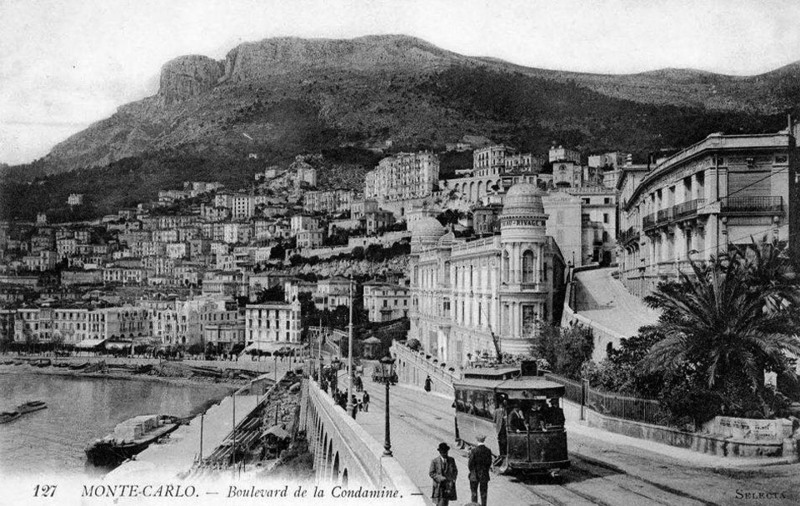 Larvotto grotto and Vaulabelle source. Pluvial water, which falls down from the stalactites, forms an underground pond, just over the sea level and is intercepted by Monaco aqueduct before getting mixed with brackish water. 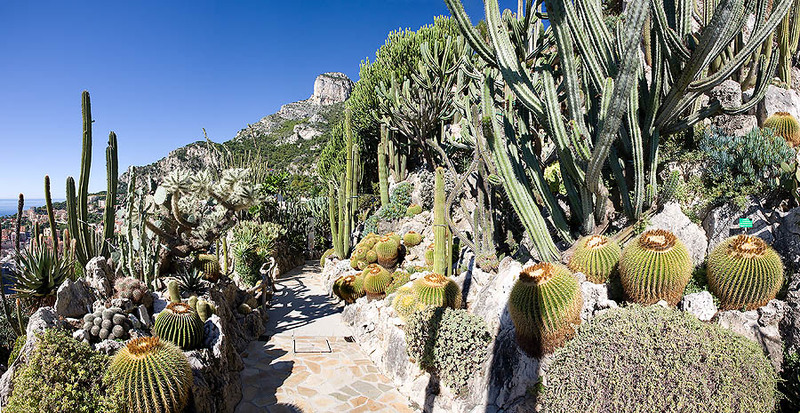 Exotic Garden Observatory Grottoes, partially open to visitors, go down till the water-sheet which flows almost at the sea level. 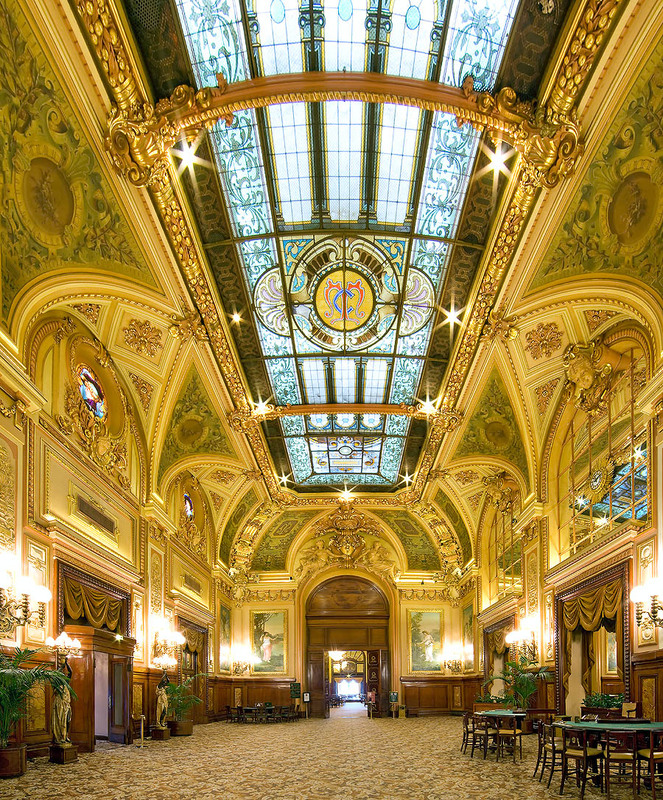 The huge halls, created by tectonic movements and successive collapses of the walls, show spectacular stalactites and stalagmites, which often join to form columnar formations. 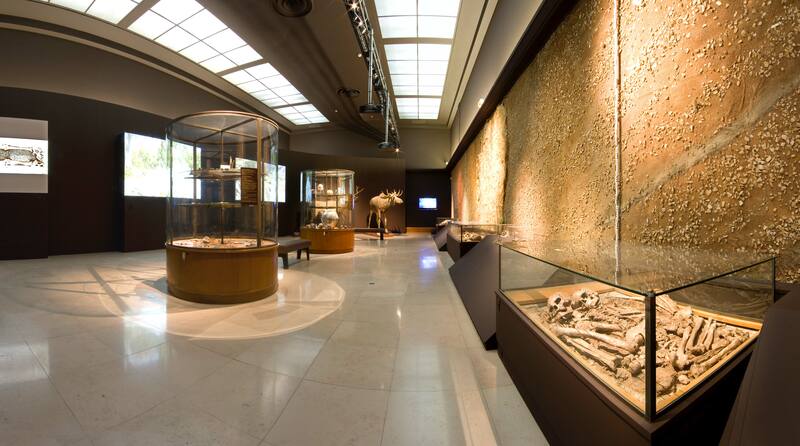 A room in the Monaco Prehistoric Anthropology Museum at the Jardin Exotique. 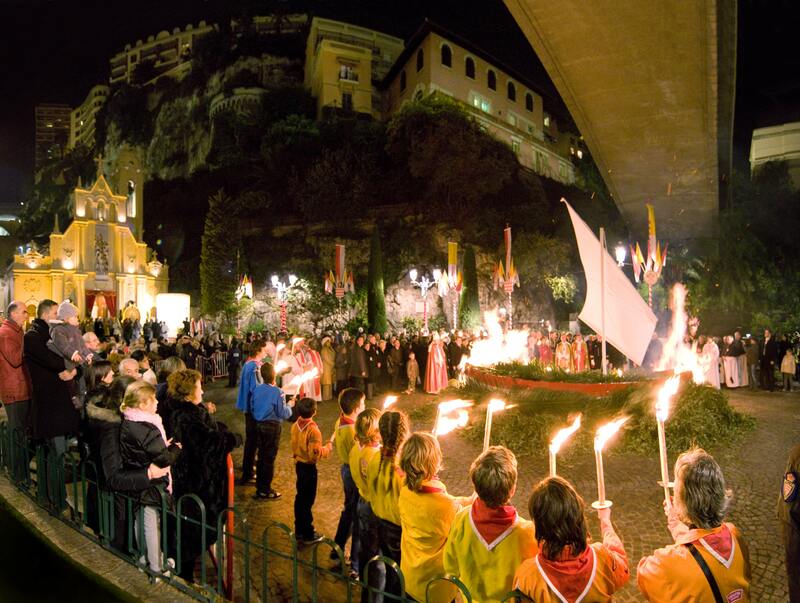 On the right, a double tomb, called of the “Grimaldi Negroids” (Children Cave, Balzi Rossi, Liguria). Recent studies have actually shown that these skeletons belong to the Cro-Magnon human group. The “Great Cro-Magnon” tomb, dated of about 25.000 years BC (Gravettian culture). Researches by L. de Villeneuve, 1902 (Children Cave, Balzi Rossi, Liguria). It’s a great sized man (about 190 cm), to whom are associated several objects: some quite big flint blades, a deer antler, a carved stone and a flat stone covered with ocher. These objects have been purposedly placed by the body and show, unambiguously, the metaphysical and religious side of these Upper Paleolithic populations. Monaco-Ville: Saint Martin gardens. Statue “Maryse at the mirror, or rather, The unchangeable time”, by Cyril de la Patellière. At the centre, the statue of the Prince Albert I. This fountain formed by XVIII century patterns and by an old Renaissance basin, was restored and placed in the Saint Martin gardens, in Monaco-Ville, on 1987. 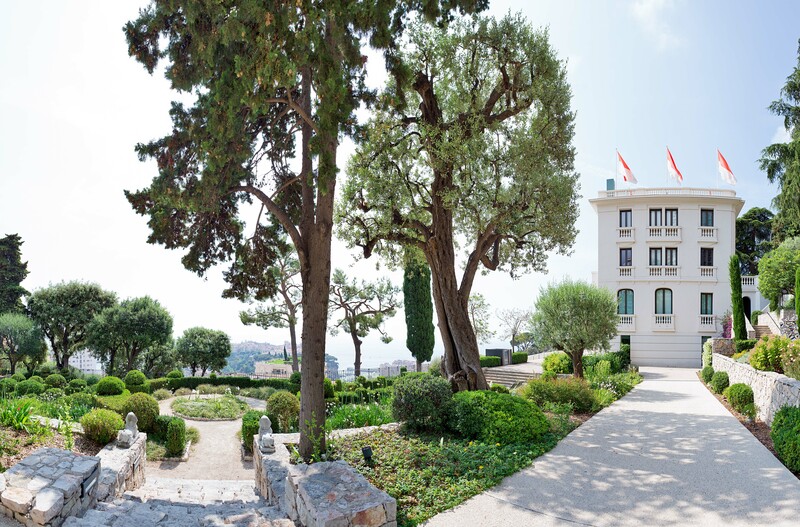 The marble bears this inscription: “Louis I, Prince of Monaco, built it for the public use and it was active from 1662. 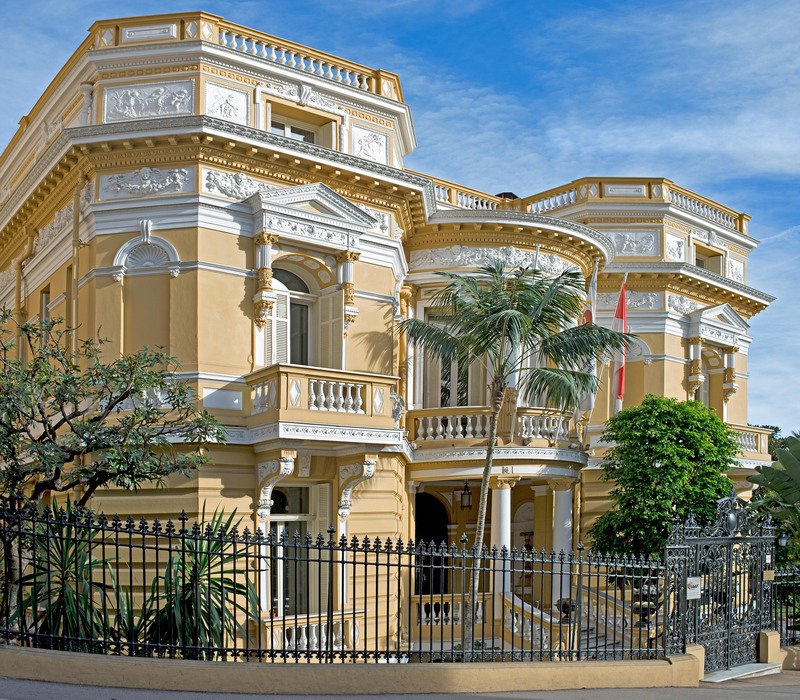 The consuls: Phelippo Ferreiro, Francesco-Antonio Gastaldo, Emanuele Frias and Joanne Terrazzano. 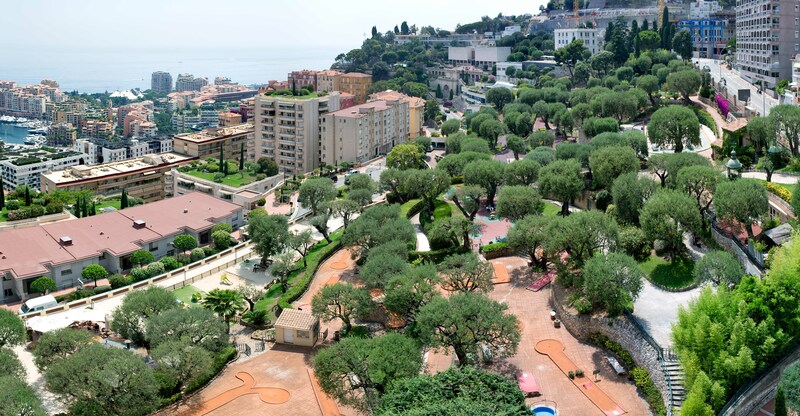 Monaco: the Princesse Antoinette Park, with its small farm hosting sheep, goats, rabbits and one hen. 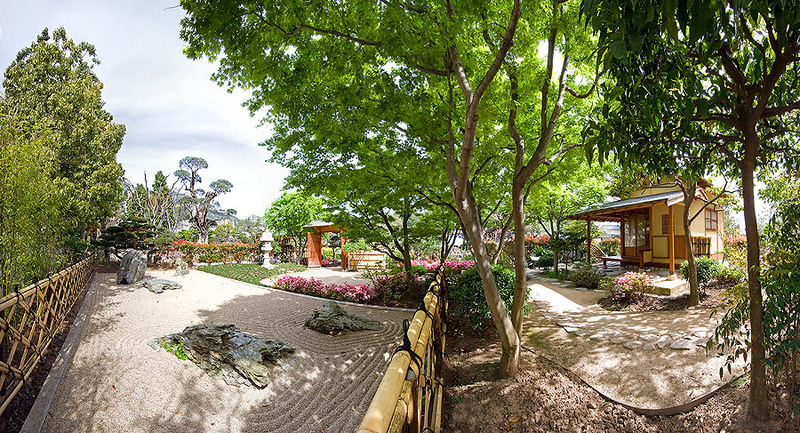 The contact with the animals is very educational for the children of the elementary schools who cultivate also a small yard, under the hundred years old olive-trees. On the right, close to the scare-crow, we can see some eggplants and onions. 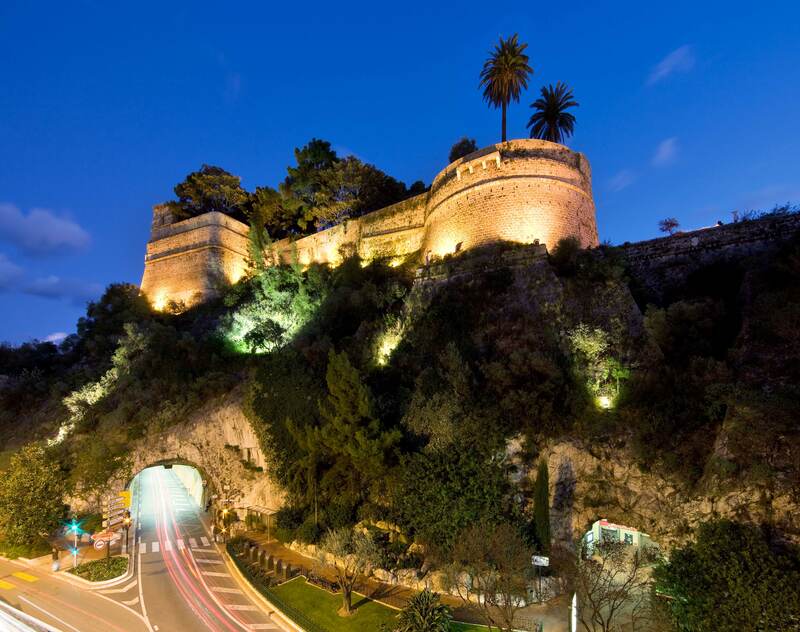 Monaco-Ville: gate, called “La Major”, built on January 10th, 1533 under the rule of Honoré I, son of Lucien Grimaldi, successor to Augustin Grimaldi on 1532. At the time of the latter’s demise, he was only 10 and the regency was given to Etienne Grimaldi, called “Le Gubernant”, from whom the initials H and G on the architrave. The “Serravalle Bastion” and “All Saints’ Tower”, with their numerous pillboxes, were, since the XVI century, essential fortifications for the defence of the Rock of Monaco. 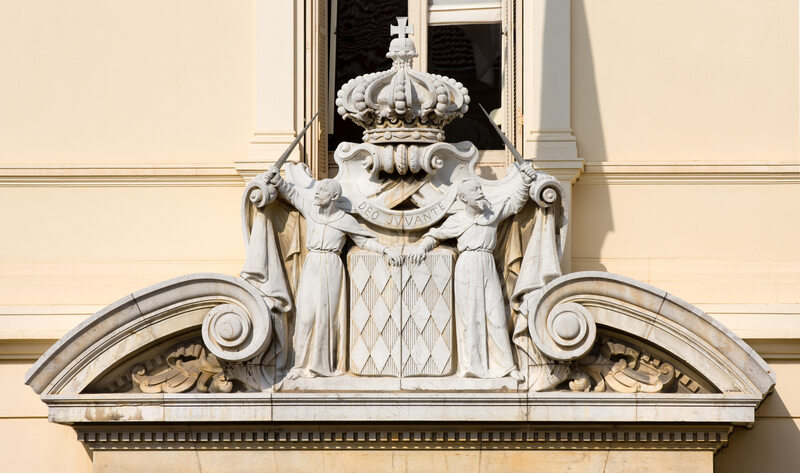 Inaugurated in 1930, under the rule of Prince Louis II, the Monaco Hall of Justice, built in solid sea tufa, is inspired by the Gothic Florentine mansions. 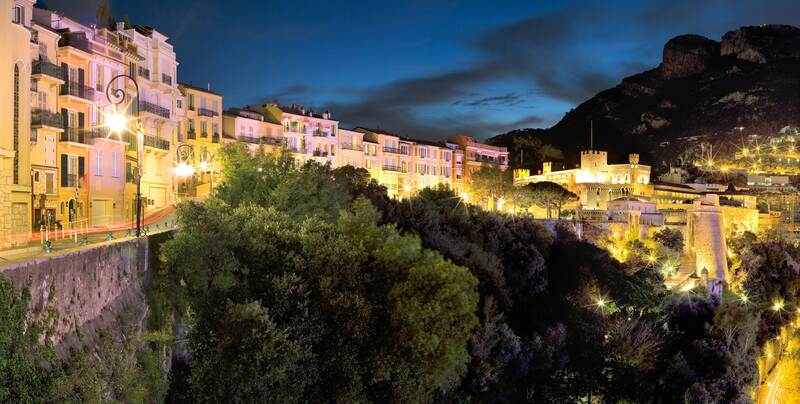 By dusk, the Rock of Monaco and Fontvieille dress with ephemeral colours, between the pink of the sunset and the blue of the sea. 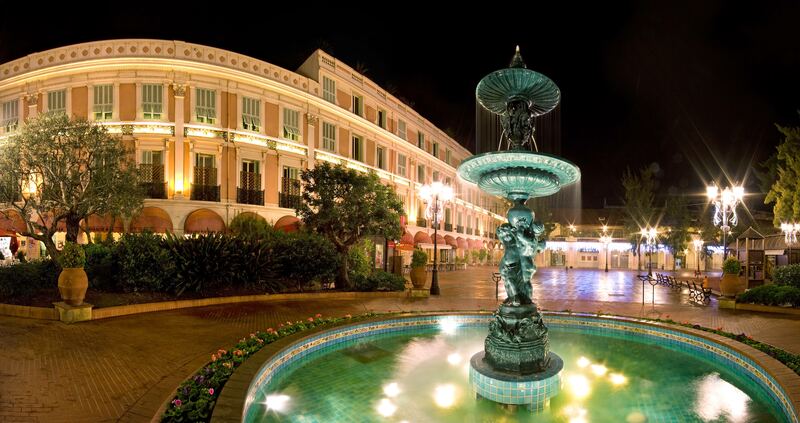 Monte Carlo: the Casino square with its typical round flower-bed, universally known as “Camembert”, mantles with the night lights. 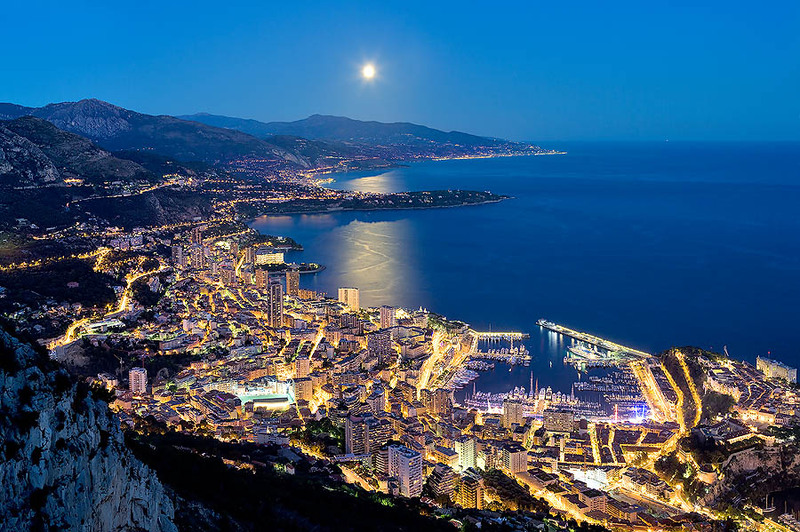 Suggestive night view from the Mont Agel. The cruise vessels, joyfully illuminated, merge with the stream of lights of the Principality of Monaco. 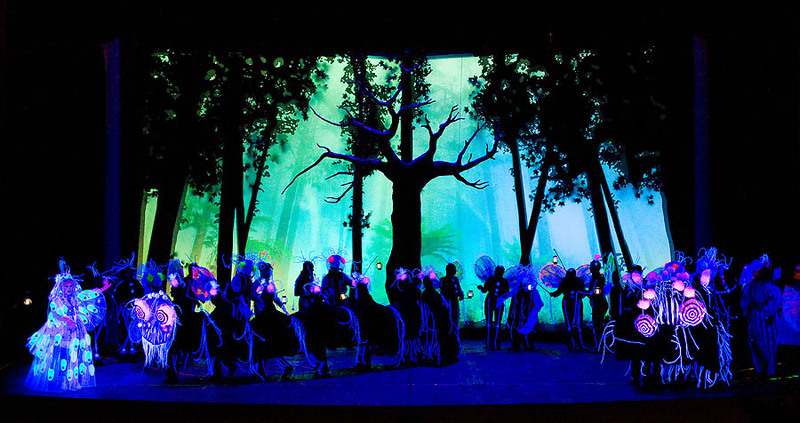 A theatrical “Little Africa”, in the suggestive night illumination of the Monte Carlo Casino Gardens. 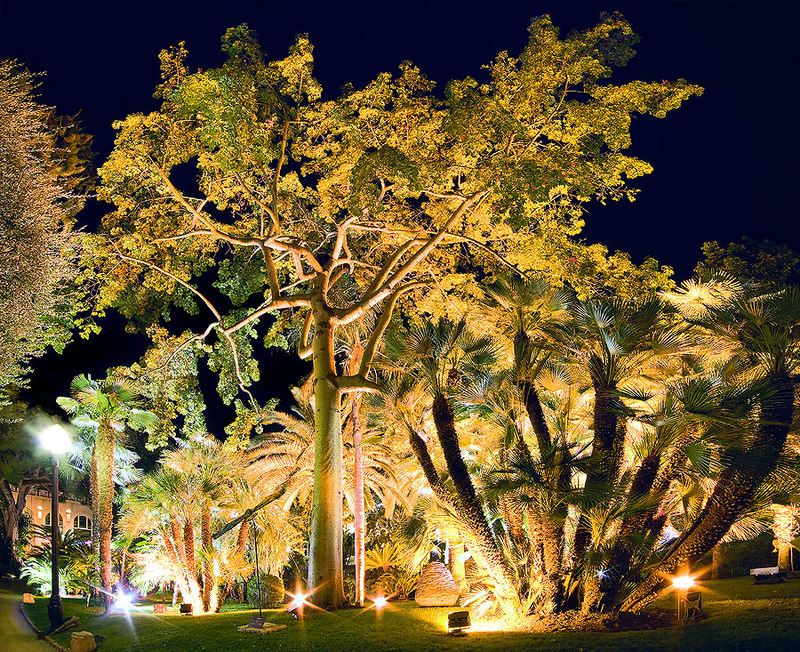 On the stage, a solemn Ceiba speciosa and a big tuft of Chamaerops humilis. 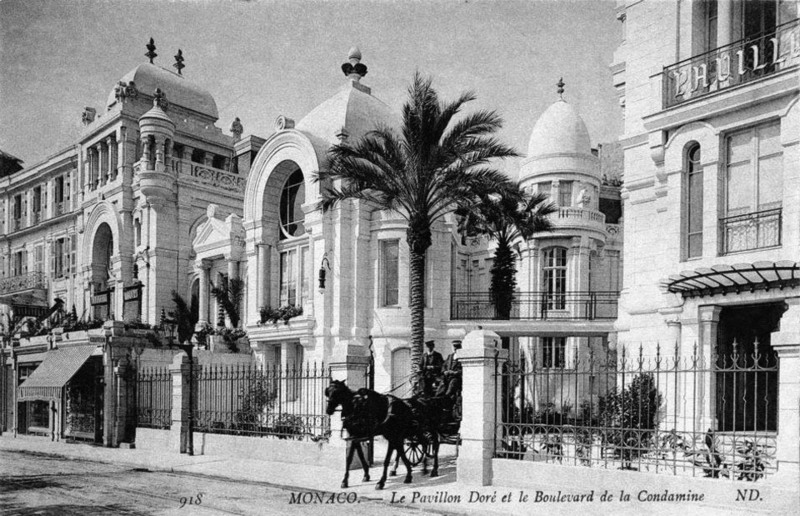 Created in 1889 by a British company, the Hotel Métropole of Monte Carlo had been demolished due to its ancientness and then accurately rebuilt after the original drawings. 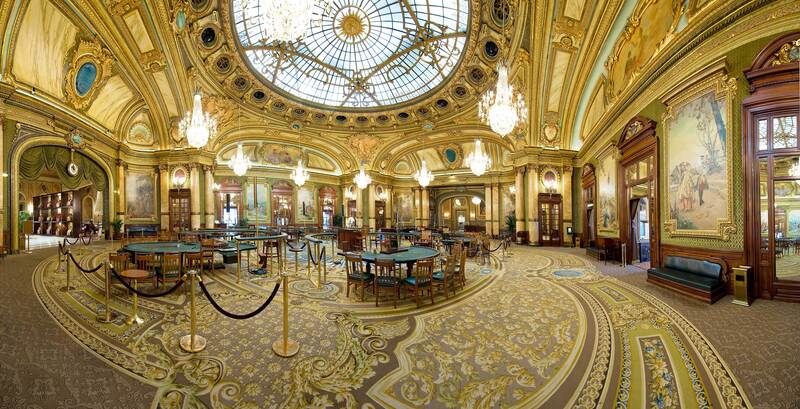 Monte Carlo: the Princes’ Hall at the Grimaldi Forum. 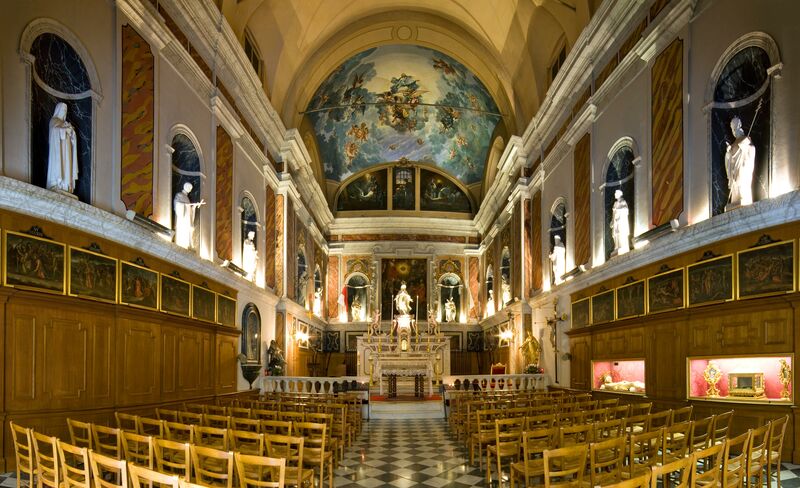 The audience listens, standing, to the Hymne monegasque, at the presence of the Sovereign Family. 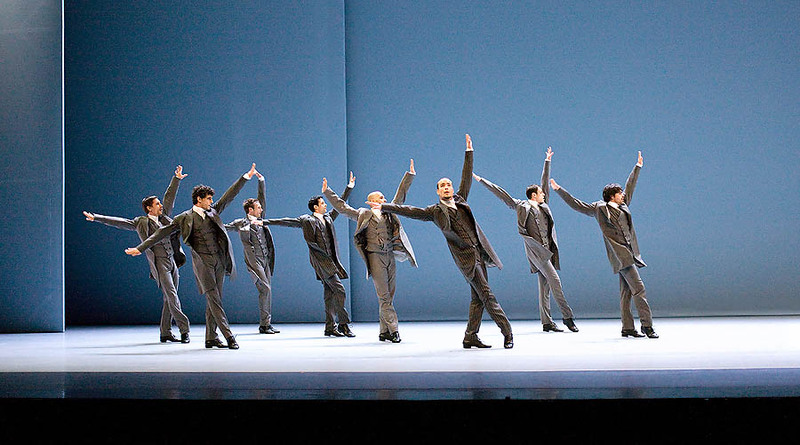 Les Ballets de Monte Carlo – “The Rite of Spring” performed at the Grimaldi Forum, choreography by Maurice Béjart. 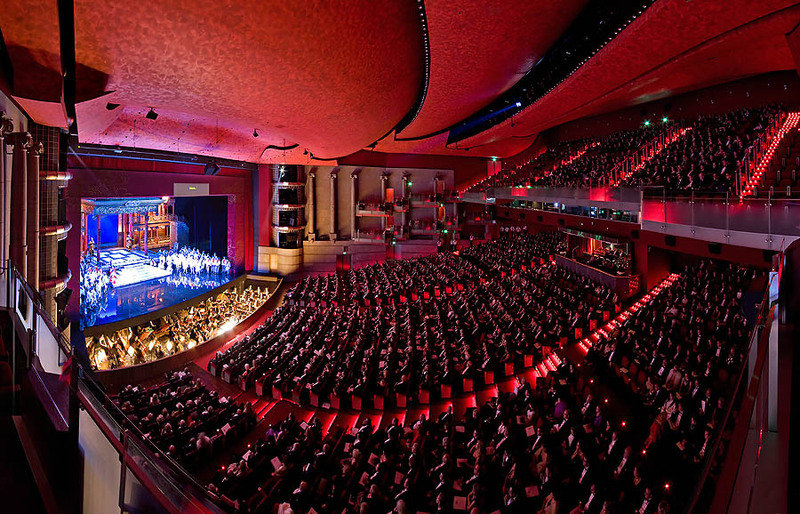 On the bottom, the Monte Carlo Philarmonic Orchestra, conducted by Yakov Kreizberg. Les Ballets de Monte Carlo, “The Rite of Spring” performed at the Grimaldi Forum, choreography by Maurice Béjart. At the centre, Mimoza Koike. 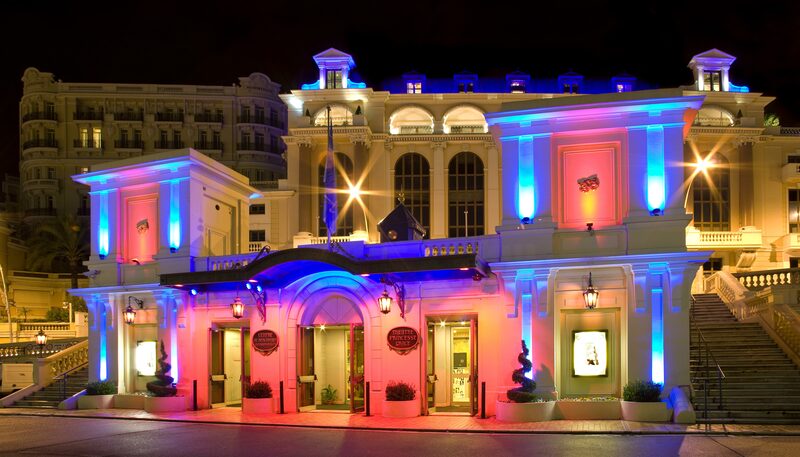 Lest Ballets de Monte Carlo. 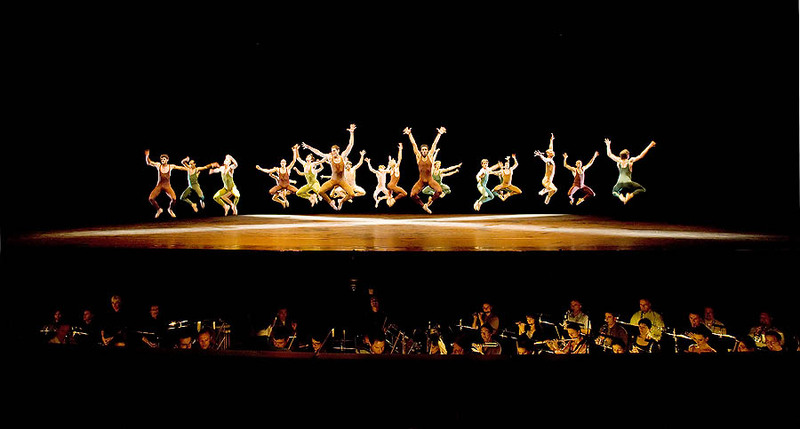 The female ballet ensemble of “The Rite of Spring”, performed at the Grimaldi Forum, choreography by Maurice Béjart. 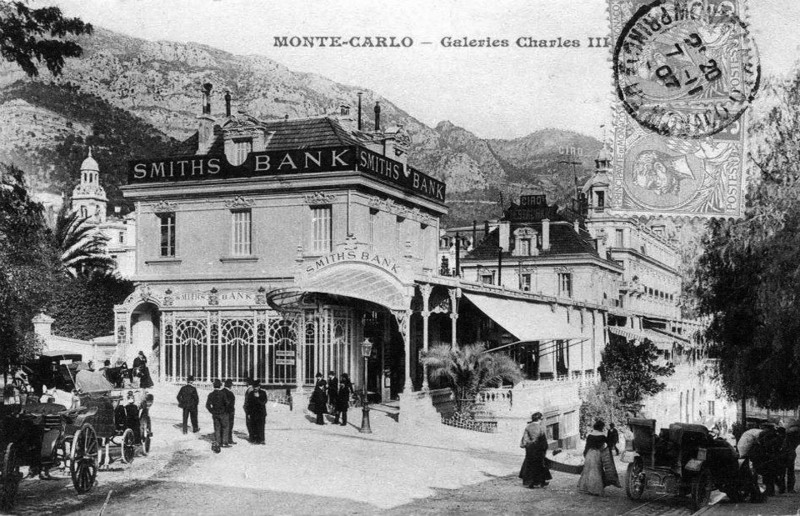 Les Ballets de Monte Carlo. 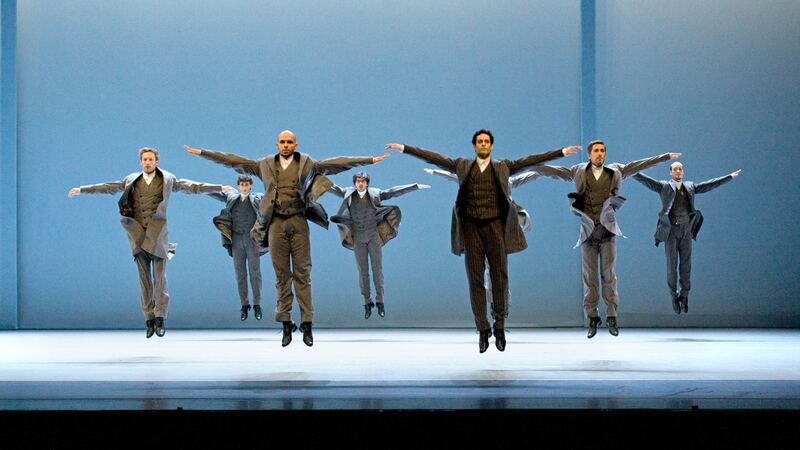 “The Rite of Spring performed at the Grimaldi Forum, choreography by Maurice Béjart. 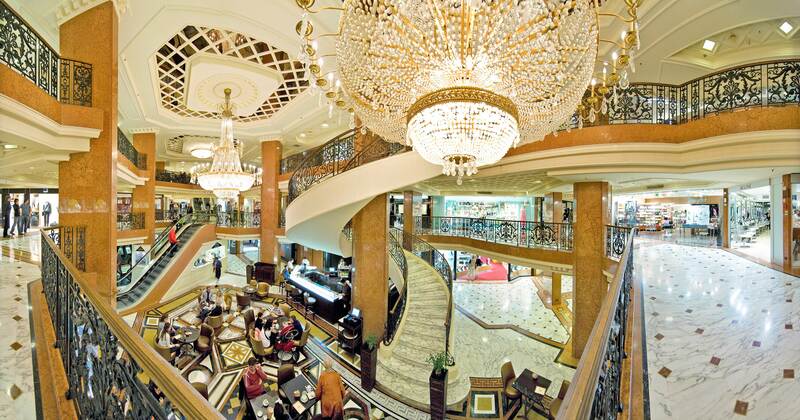 At the centre, Mimoza Koike. Les Ballets de Monte Carlo. “The Rite of Spring” performed at the Grimaldi Forum, choreography by Maurice Béjart. At the centre Mimoza Koike and Chris Roelandt. 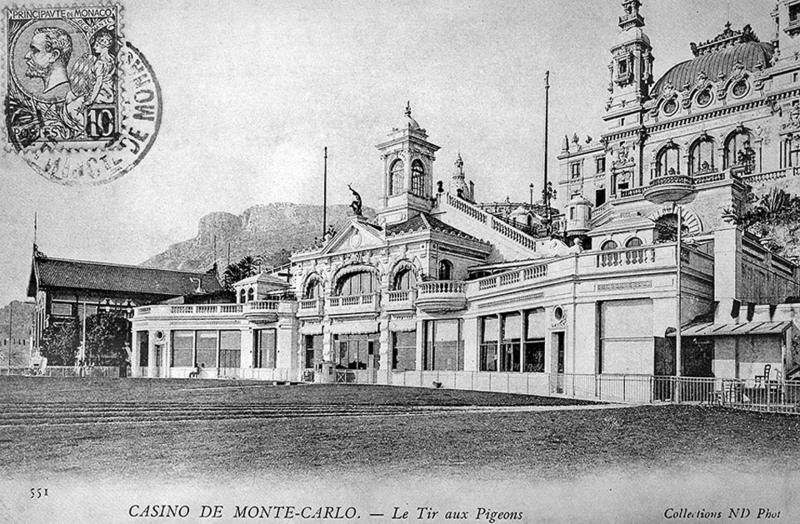 Les Ballets de Monte Carlo. “The Rite of Spring” final performed at the Grimaldi Forum, choreography by Maurice Béjart. At the centre Mimoza Koike and Chris Roelandt. Les Ballets de Monte Carlo. 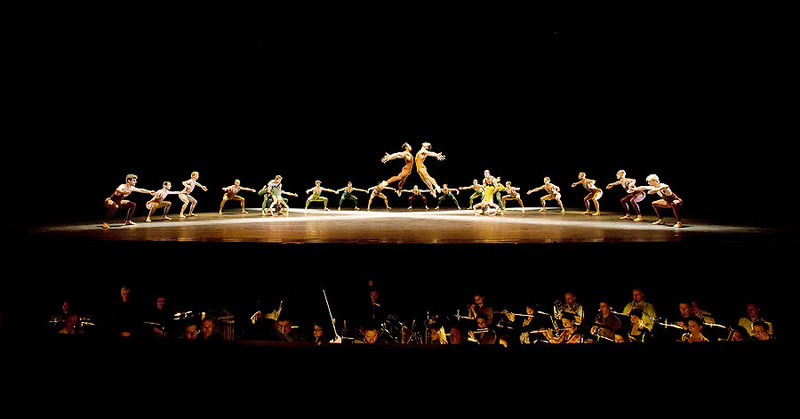 “Daphnis et Chloé” performed at the Grimaldi Forum, choreography by Jean-Christophe Maillot. Anjara Ballesteros and Jeroen Verbruggen. Les Ballets de Monte Carlo. 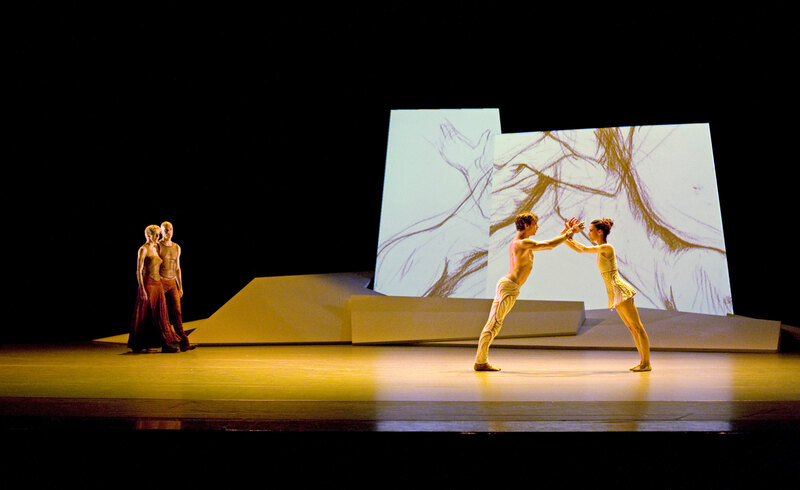 “Daphnis et Chloé” performed at the Grimaldi Forum, choreography by Jean-Christophe Maillot. Bernice Coppieters and Gaëtan Morlotti – Anjara Ballesteros and Jeroen Verbruggen. 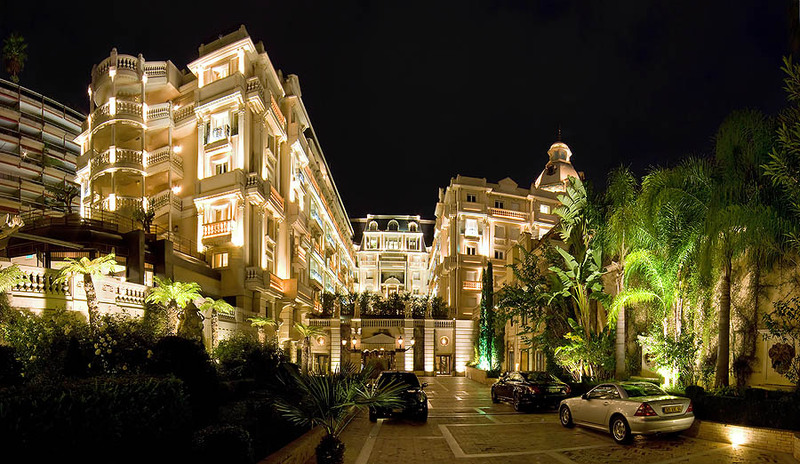 Monte-Carlo Magic Stars : two hours are needed for preparing the dress of Ma Yanyan, specialist in manipulation, who, while dancing, displays flowers, decks, ribbons, parasols and even two flags. 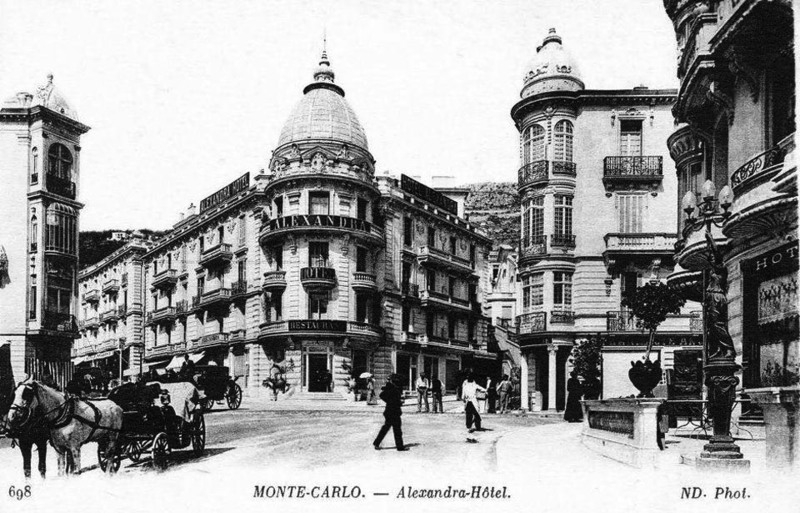 Monte-Carlo Magic Stars : the great Italian illusionist Alberto Giorgi conceals the head of his splendid assistant into a cube on fire. 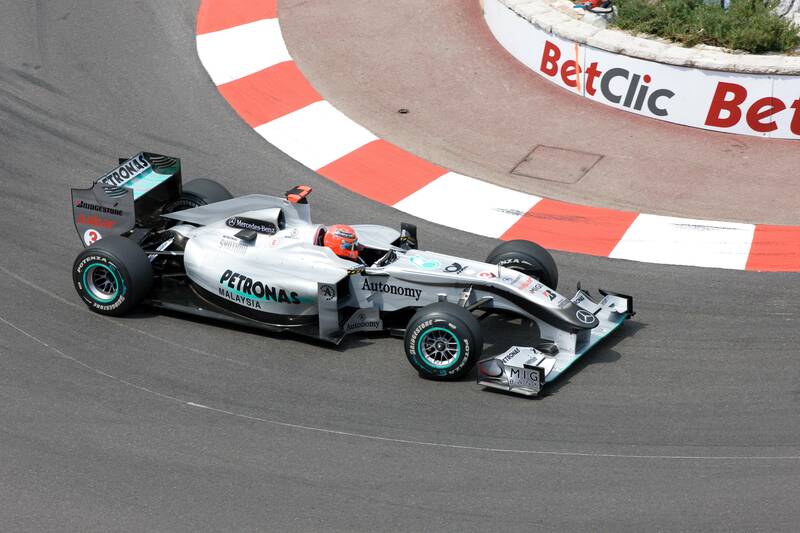 Monte-Carlo Magic Stars : the great German illusionist Julius Frack in a spectacular levitation performance. Monte-Carlo Magic Stars : Phillippart, exuberant general magic master offers us an appearance. He closes a dolly inside a cage, covers it with a cloak, the cage lifts and Anja, his nice assistant, appears. 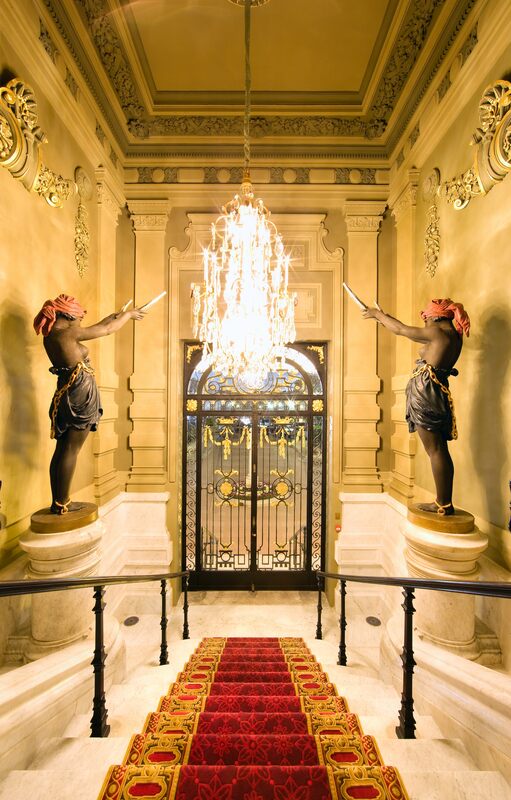 Monte-Carlo Magic Stars : Philippart gets between the beholders, chooses a volunteer and with a dagger, stabs, smiling, his throat without harming him. 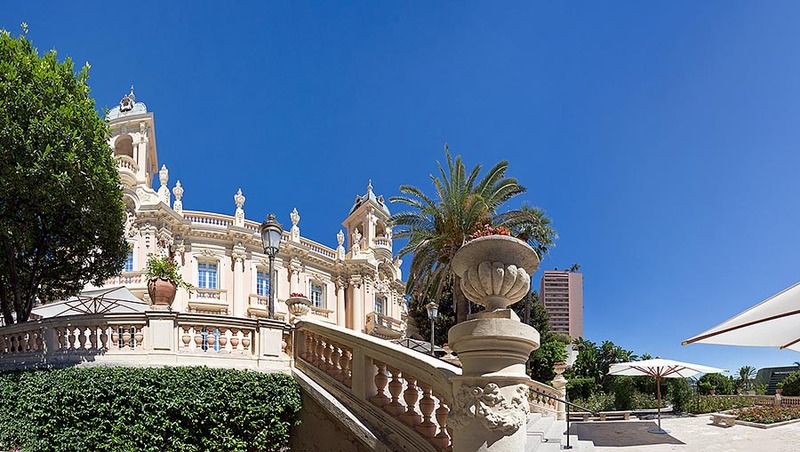 Monte-Carlo Magic Stars : Laurent Beretta, famous master in general magic, comes out from a framework and then imprisons there a thief who had entered his study. 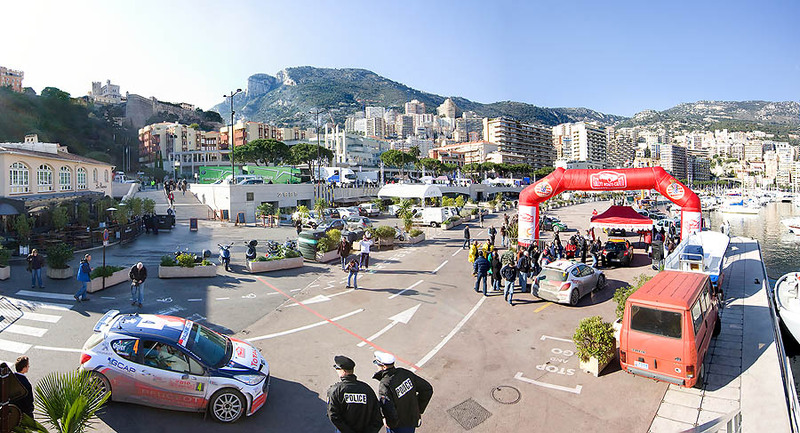 Monte-Carlo Magic Stars : Comic magic is also present. 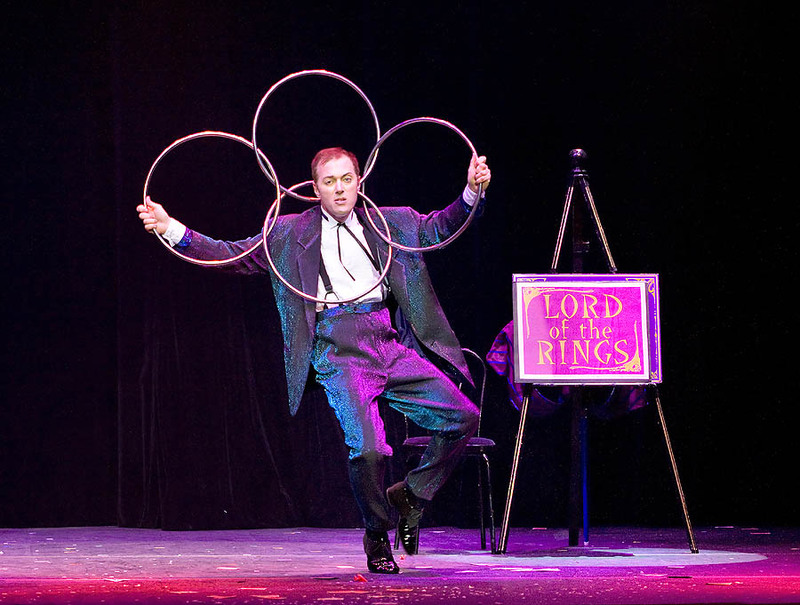 Charlie Frye here, in his own way, undertakes several exercises, among which the Chinese rings. Monte-Carlo Magic Stars : The great French illusionist Dani Lary extracts cascades of flowers from an old rolled newspaper and disappears, several times, for re-appearing in the opposite side of the stage. 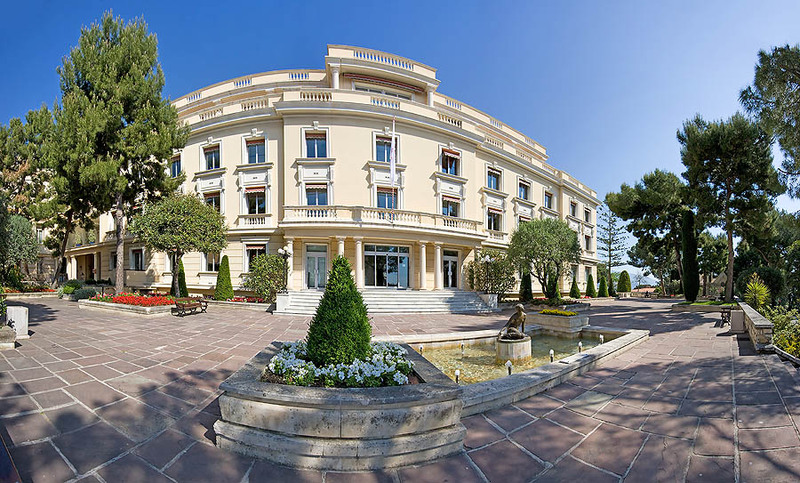 Monte-Carlo Magic Stars : The music animator Frank Wilson, left, and the artists Dani Lary, Philippart & Anja, Laurent Beretta & Cécile Medour, Cindy Keller, Roxanne, Julius Frack, Topas, Soma, Alberto Giorgi & Carolina, Ma Yanyan, Charlie Frye & Diana, Julien Manry, Senzo and La Cie de l’Escadrille of the 25th Monte Carlo Magic Stars greet the audience. 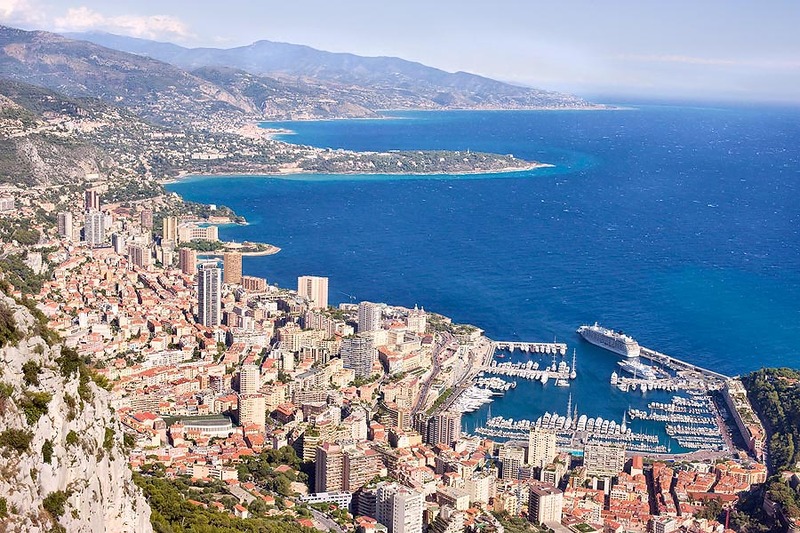 The profile of Corsica seen from Monaco has not changed. A new day begins.